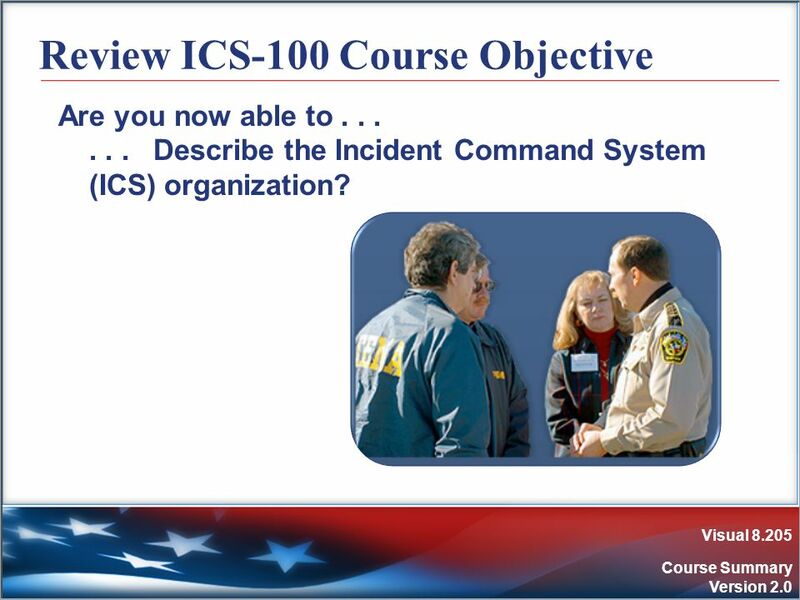 2 ICS-100 Course Objective Demonstrate basic knowledge of the Incident Command System (ICS). 4 What do you expect to gain from this course? 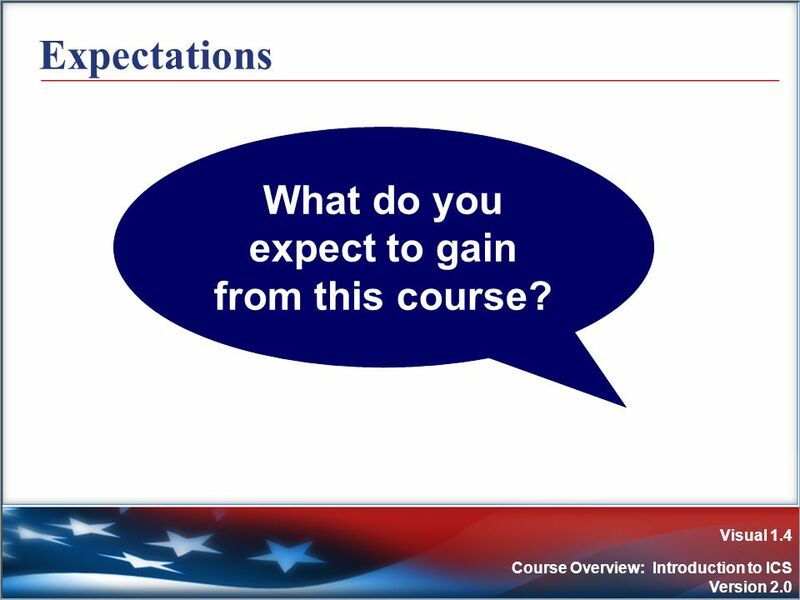 Expectations What do you expect to gain from this course? Cooperate with the group. Be open minded to new ideas. Participate actively in all of the training activities and exercises. Return to class at the stated time. 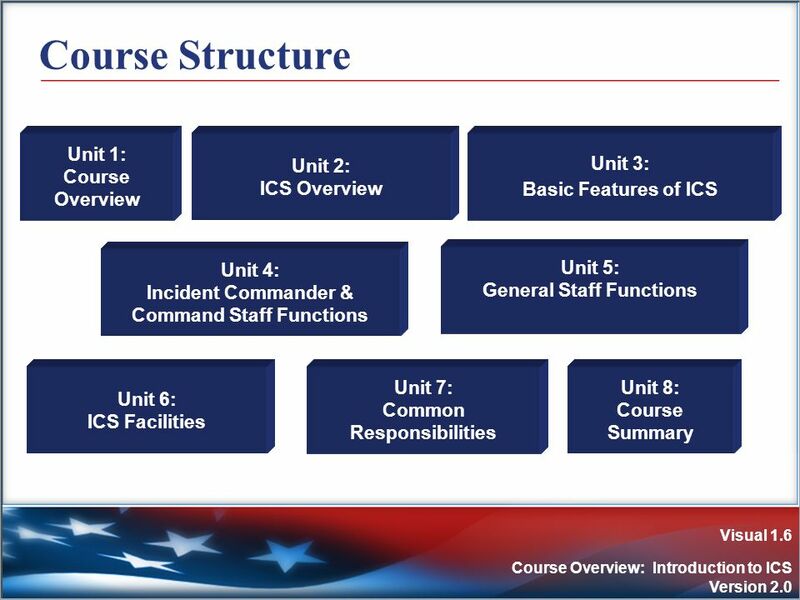 Use what you learn in the course to perform effectively within an ICS organization. 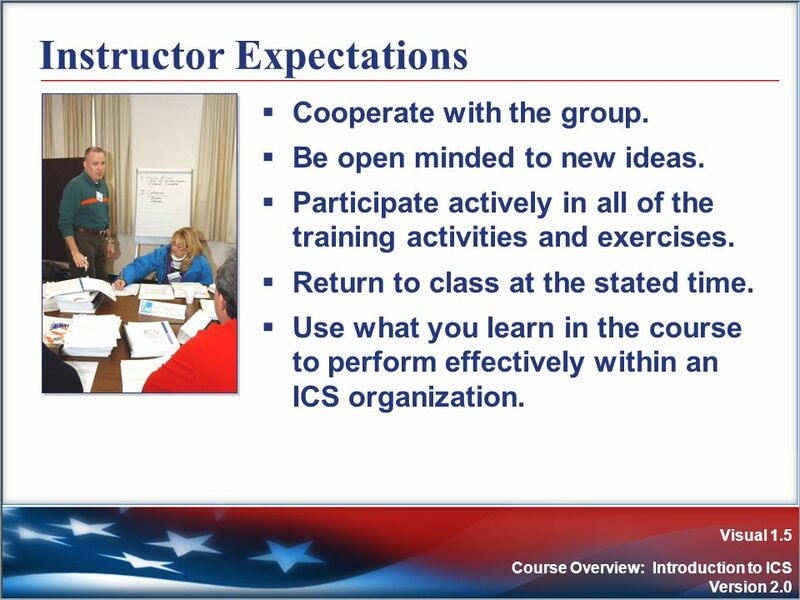 Participate in unit activities/exercises. Achieve 75% or higher on the final exam. 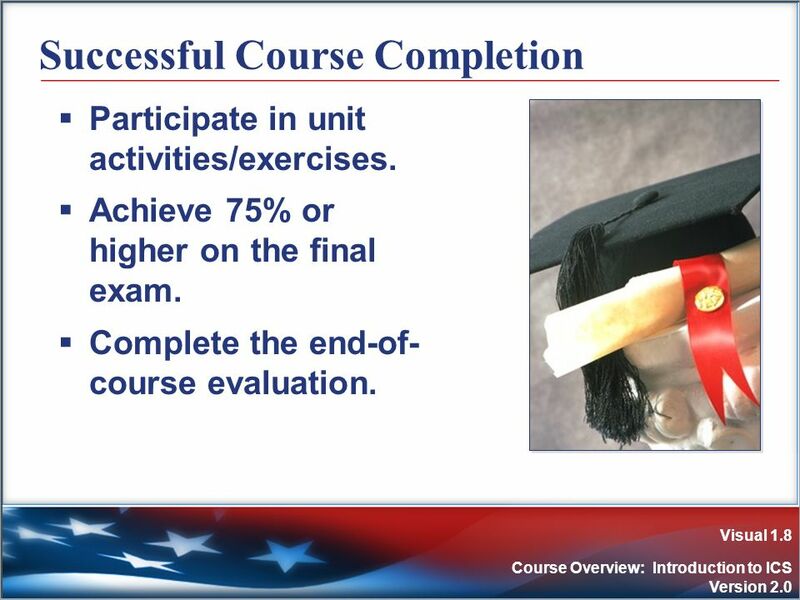 Complete the end-of-course evaluation. 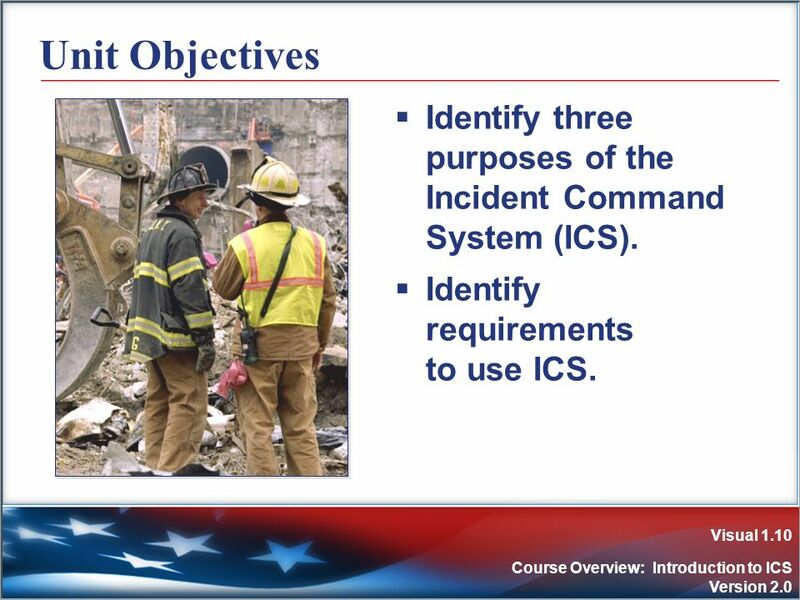 10 Unit Objectives Identify three purposes of the Incident Command System (ICS). Identify requirements to use ICS. 11 What Is an Incident? 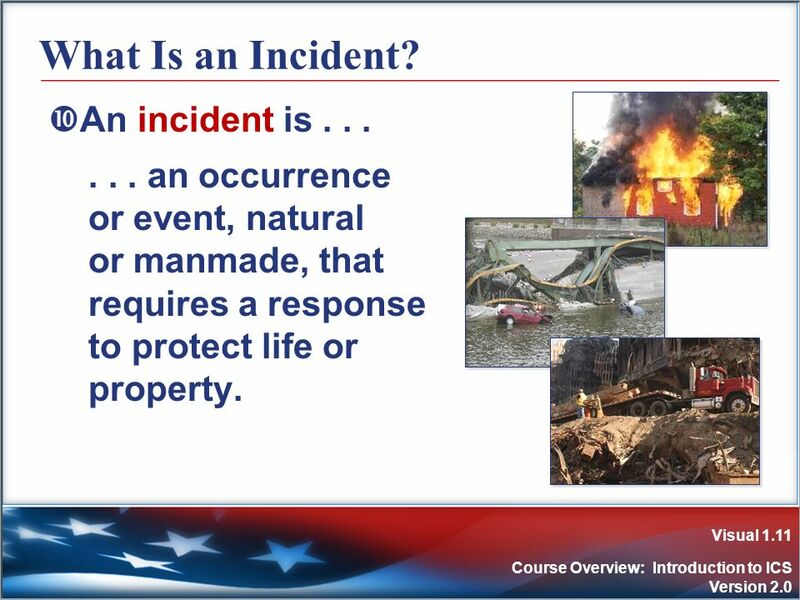 An incident is . . .
. . . an occurrence or event, natural or manmade, that requires a response to protect life or property. Is a standardized, on-scene, all-hazard incident management concept. Allows its users to adopt an integrated organizational structure to match the complexities and demands of single or multiple incidents without being hindered by jurisdictional boundaries. The safety of responders and others. The achievement of tactical objectives. The efficient use of resources. Lack of accountability. Poor communication. Lack of a planning process. Overloaded Incident Commanders. 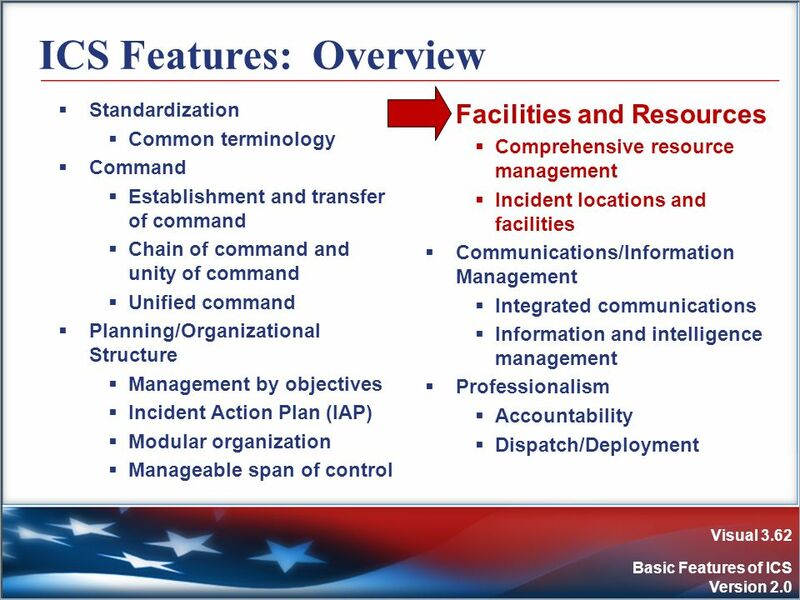 No method to integrate interagency requirements. 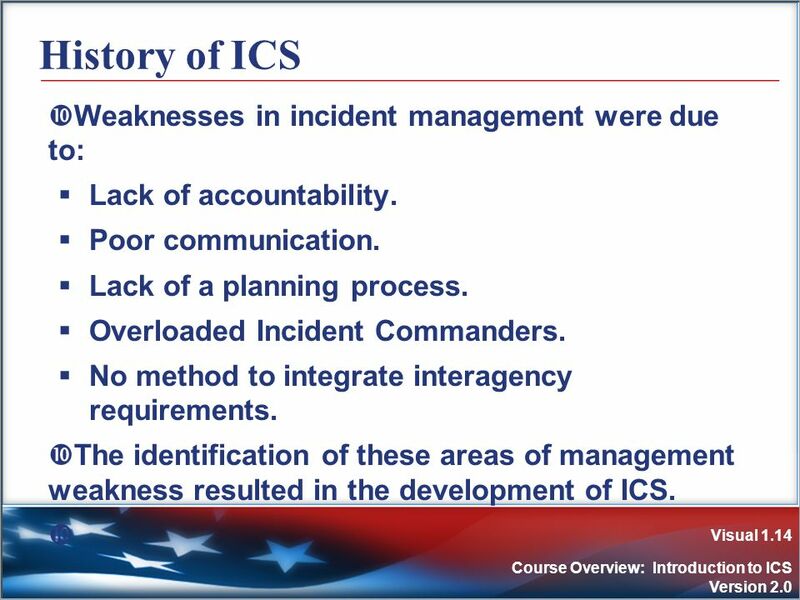 The identification of these areas of management weakness resulted in the development of ICS. 15 Knowledge Review (1 of 2) Instructions: Decide if the statement is TRUE or FALSE. 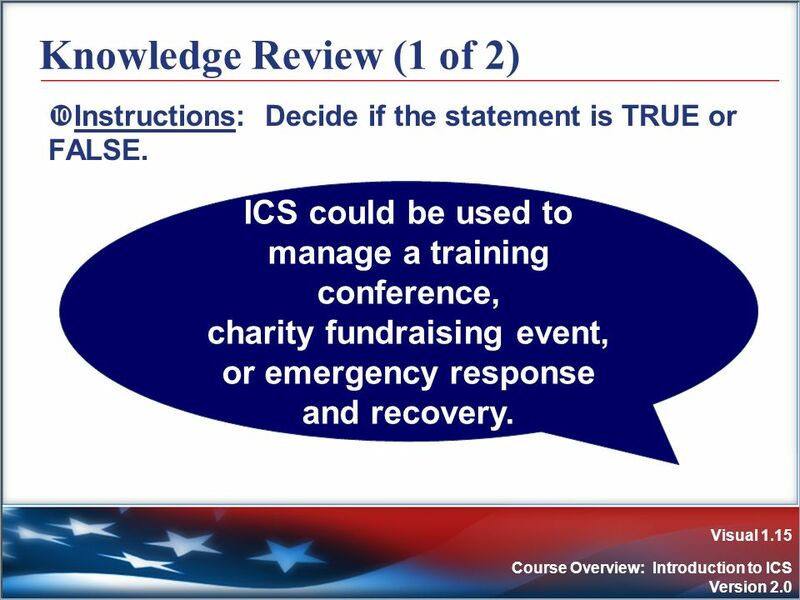 ICS could be used to manage a training conference, charity fundraising event, or emergency response and recovery. 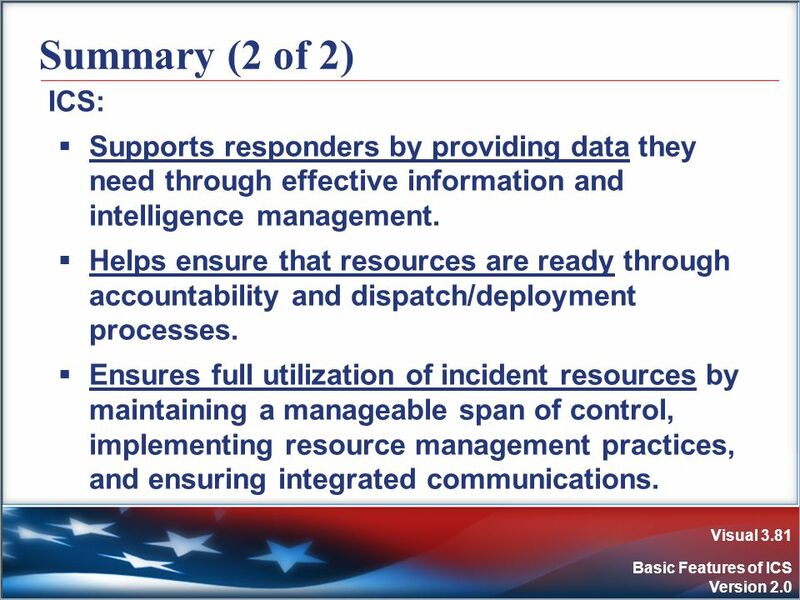 16 incident responses found resulted from a lack of resources. Knowledge Review (2 of 2) Instructions: Decide if the statement is TRUE or FALSE. The study of previous incident responses found that failures likely resulted from a lack of resources. 18 NIMS What ? . 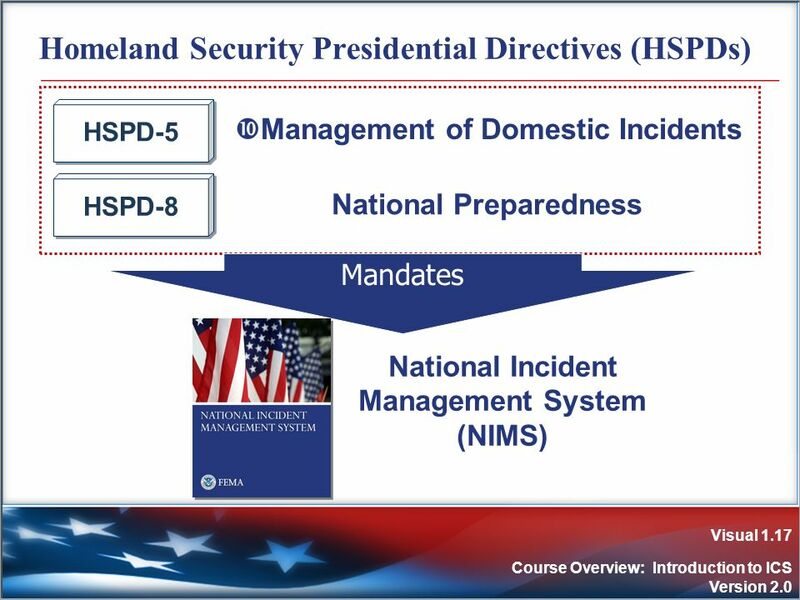 . . NIMS provides a consistent nationwide template . 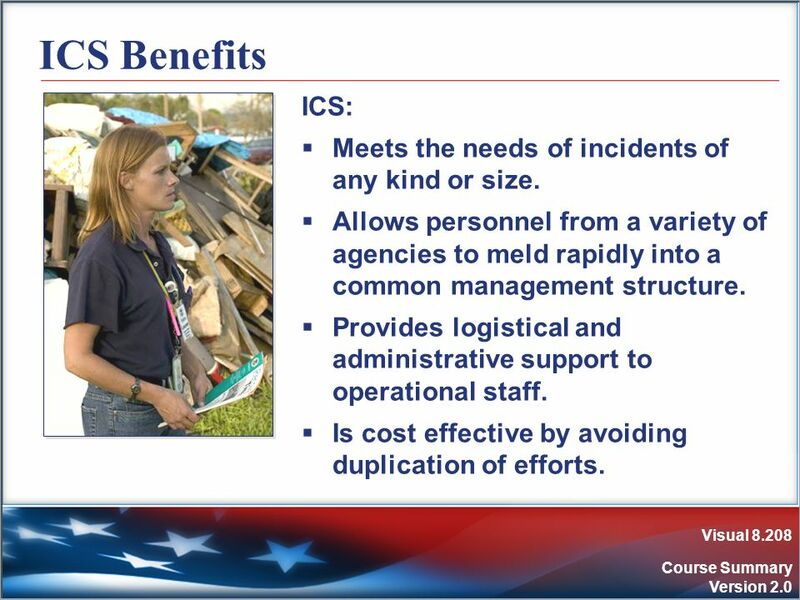 . .
20 ICS Benefits ICS: Meets the needs of incidents of any kind or size. Allows personnel from a variety of agencies to meld rapidly into a common management structure. 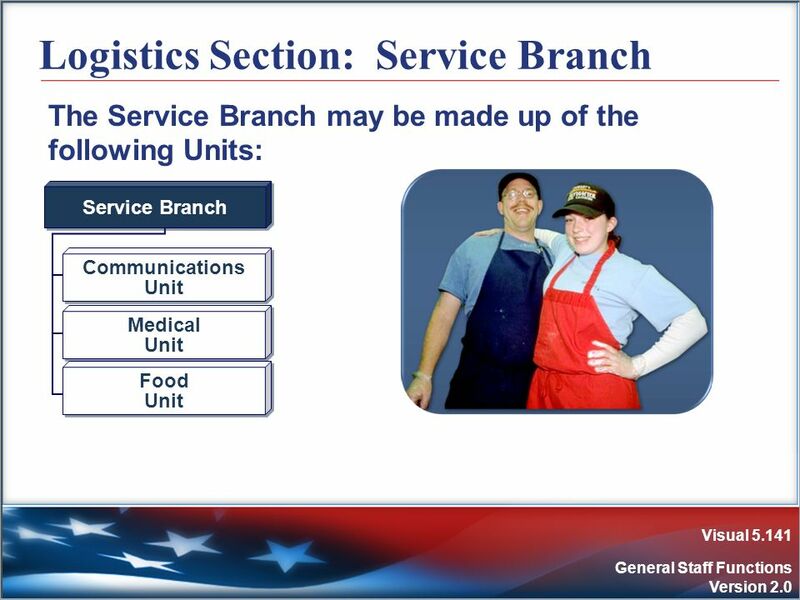 Provides logistical and administrative support to operational staff. Is cost effective by avoiding duplication of efforts. 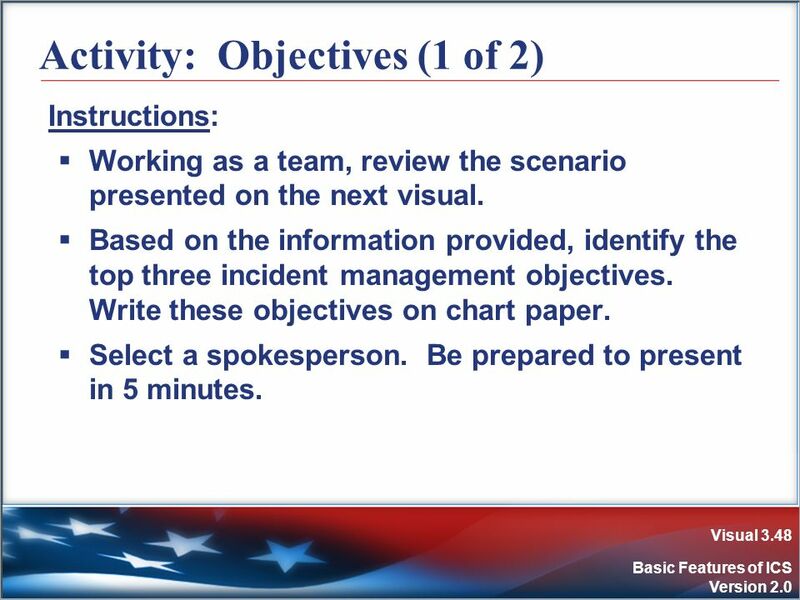 Instructions: Working as a team, review the scenario presented on the next visual. 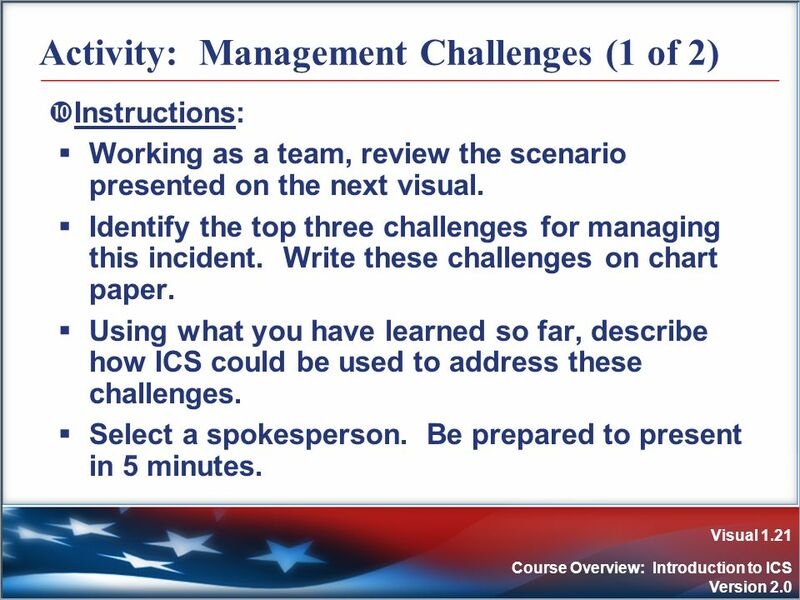 Identify the top three challenges for managing this incident. Write these challenges on chart paper. 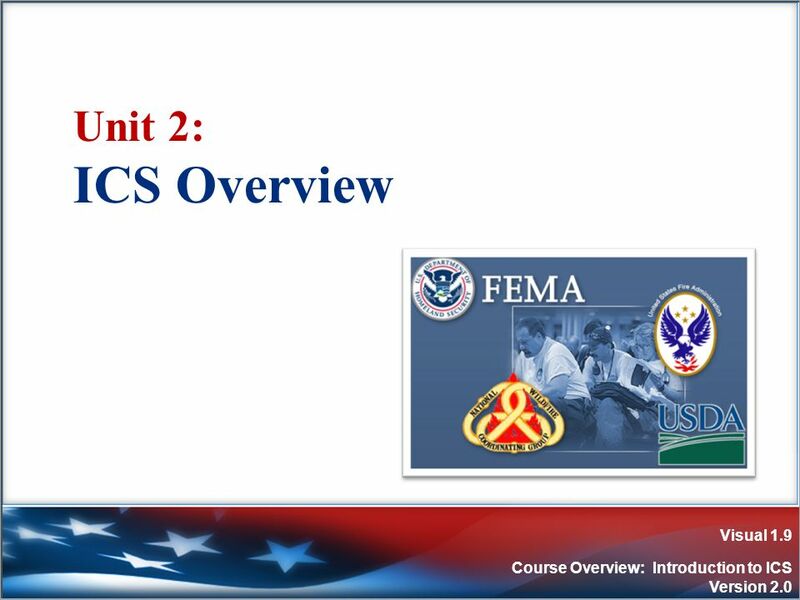 Using what you have learned so far, describe how ICS could be used to address these challenges. Select a spokesperson. Be prepared to present in 5 minutes. Scenario: An unexpected flash flood has struck a small community. As a result: Homes, schools, and the business district have been evacuated. 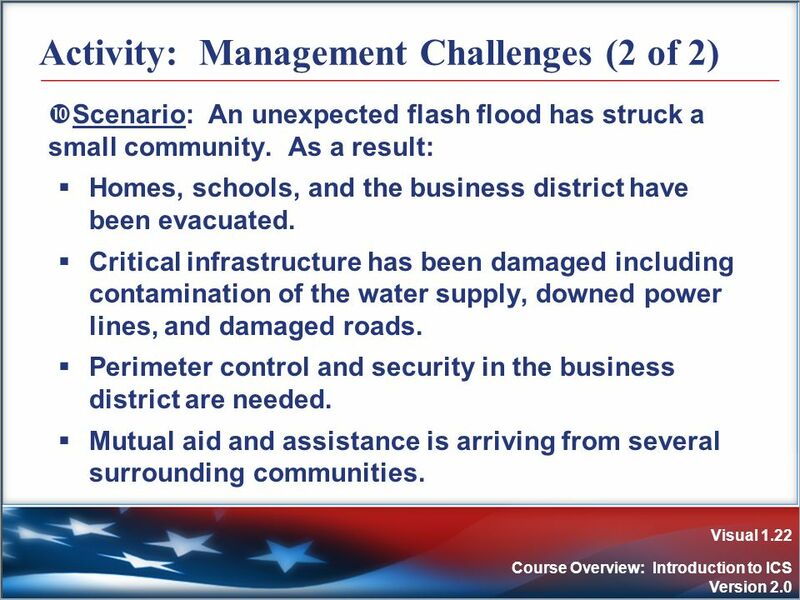 Critical infrastructure has been damaged including contamination of the water supply, downed power lines, and damaged roads. Perimeter control and security in the business district are needed. Mutual aid and assistance is arriving from several surrounding communities. 23 Summary (1 of 2) Instructions: Answer the questions below. 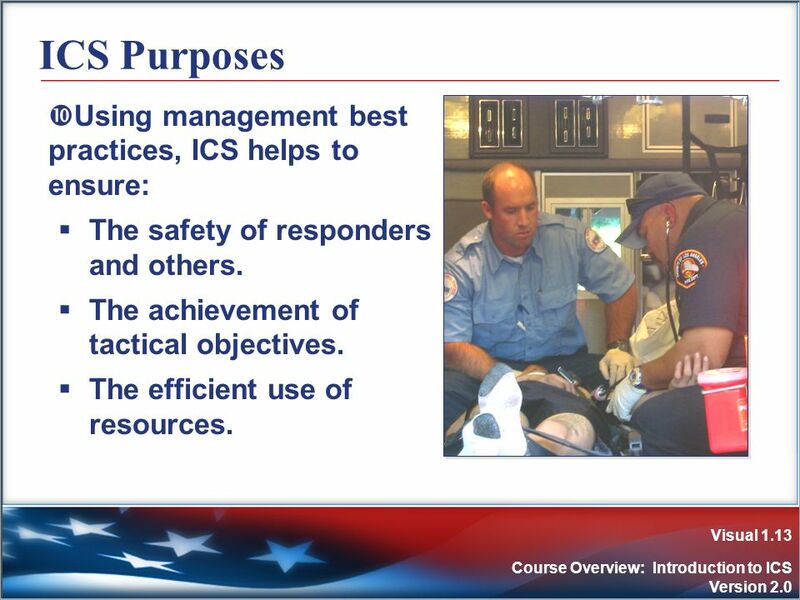 What are three purposes of ICS? 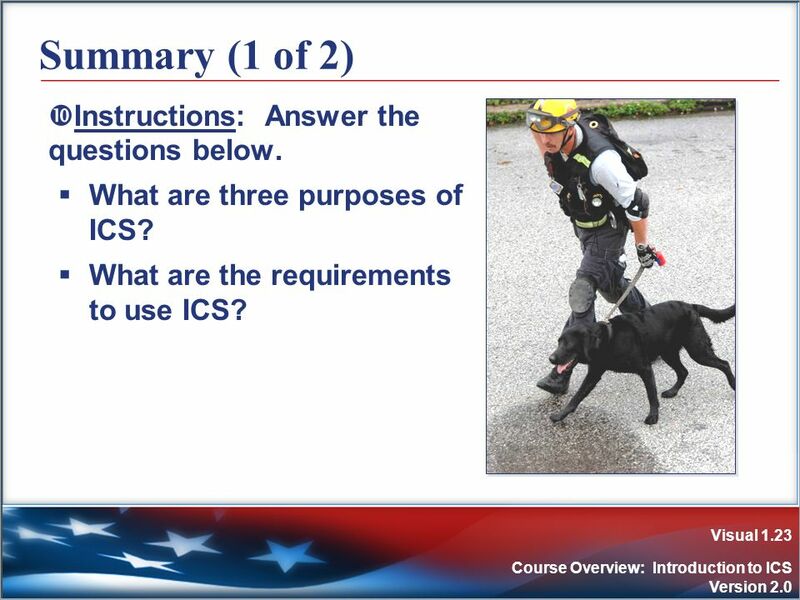 What are the requirements to use ICS? 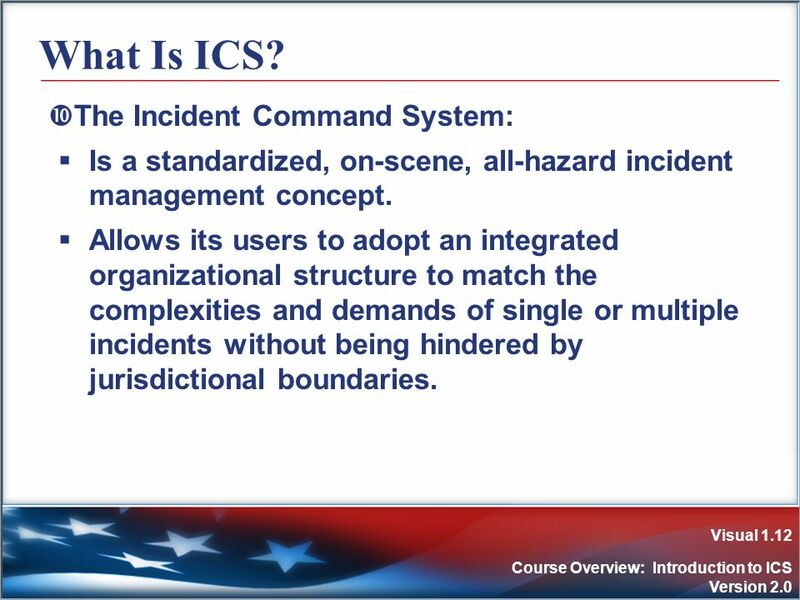 24 Summary (2 of 2) ICS: Is a standardized management tool for meeting the demands of small or large emergency or nonemergency situations. 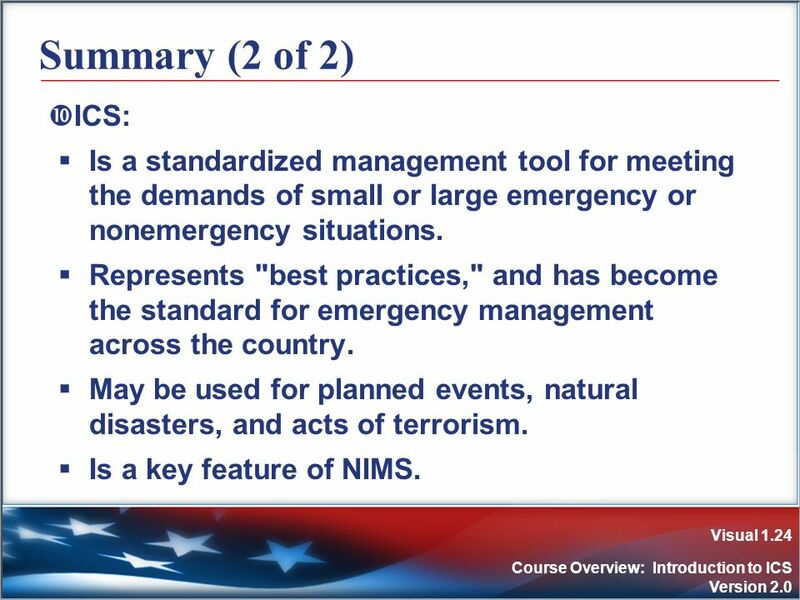 Represents "best practices," and has become the standard for emergency management across the country. May be used for planned events, natural disasters, and acts of terrorism. 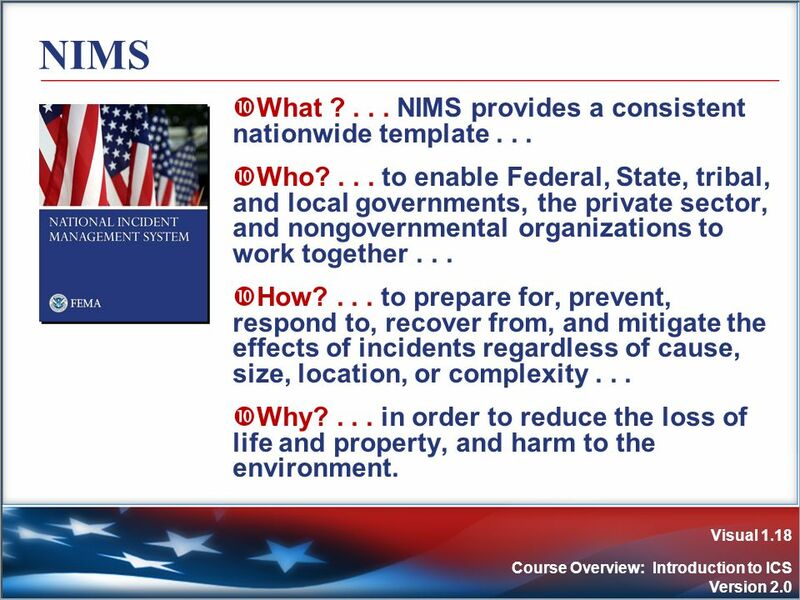 Is a key feature of NIMS. 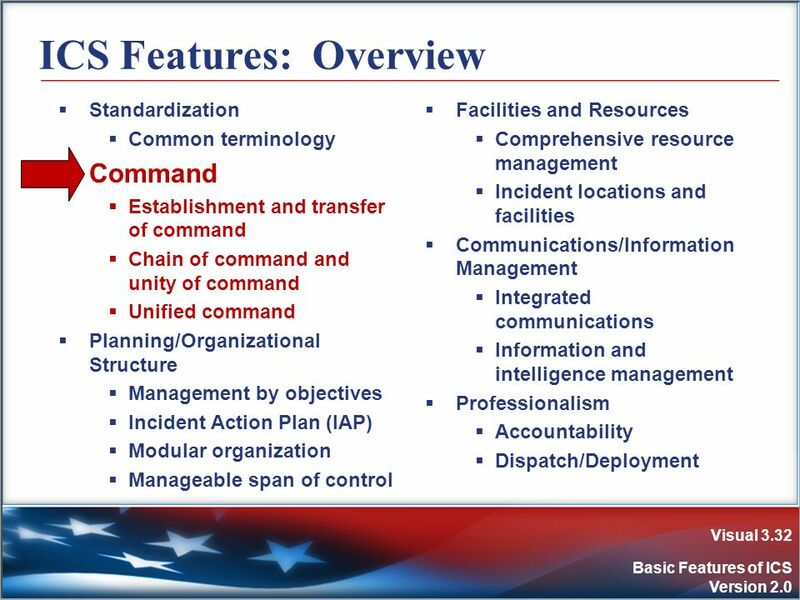 26 Unit Objective Describe the basic features of the Incident Command System (ICS). 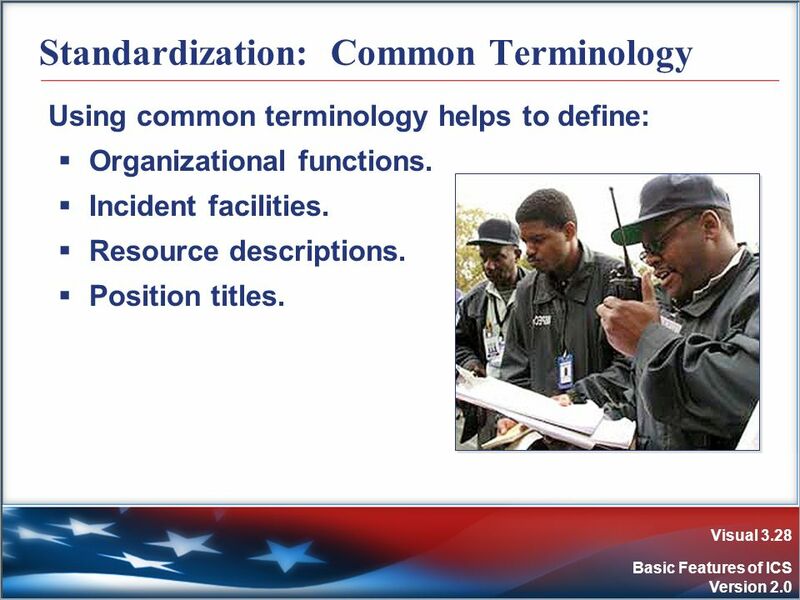 Using common terminology helps to define: Organizational functions. Incident facilities. Resource descriptions. Position titles. 29 Use of Plain English Communications should be in plain English or clear text. Do not use radio codes, agency-specific codes, or jargon. 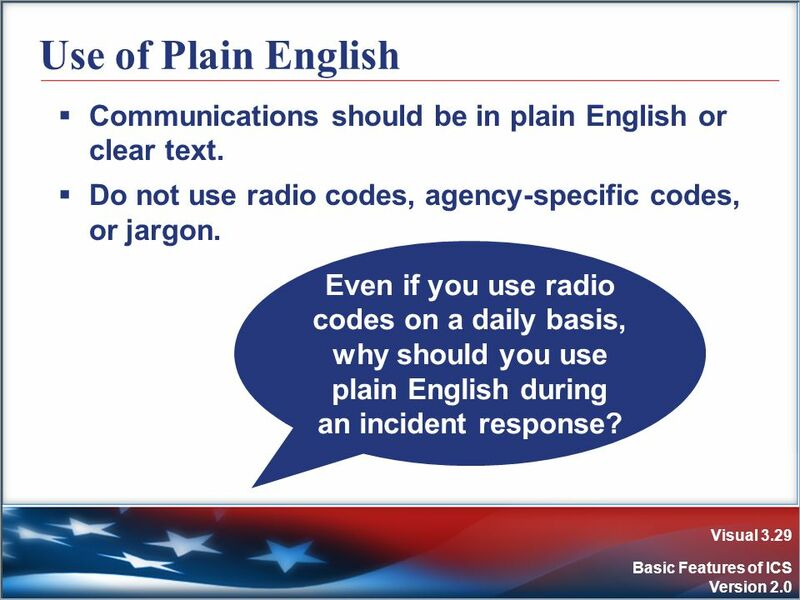 Even if you use radio codes on a daily basis, why should you use plain English during an incident response? 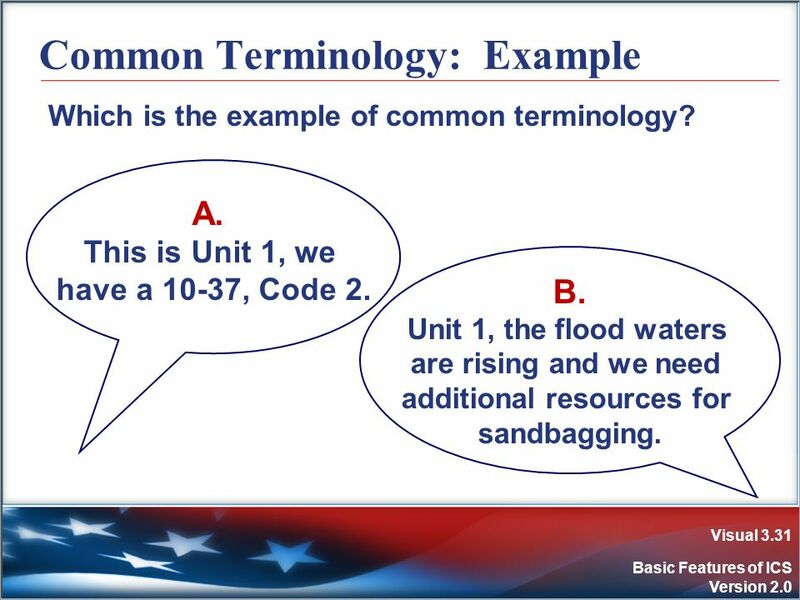 Which is the example of common terminology? A. This is Unit 1, we have a 10-37, Code 2. B. Unit 1, the flood waters are rising and we need additional resources for sandbagging. 33 Command: Definition Command: The act of directing, ordering, or controlling by virtue of explicit statutory, regulatory, or delegated authority. 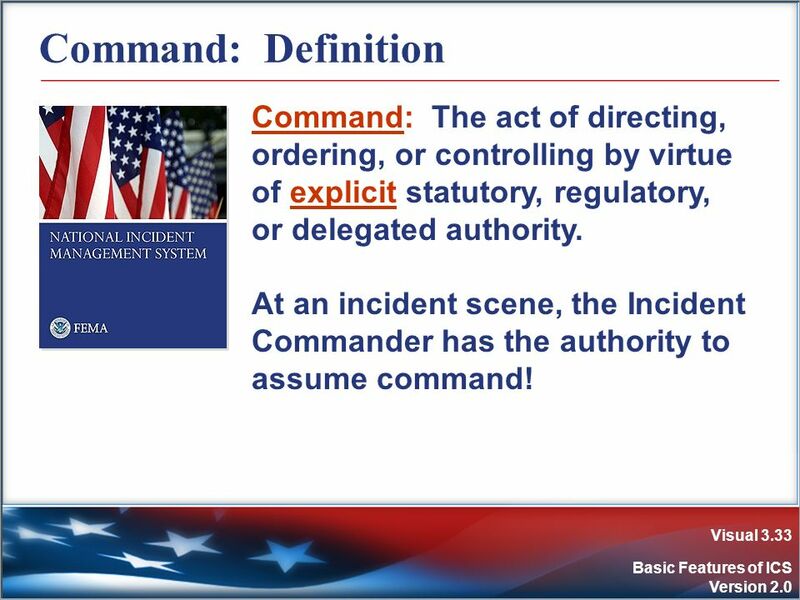 At an incident scene, the Incident Commander has the authority to assume command! 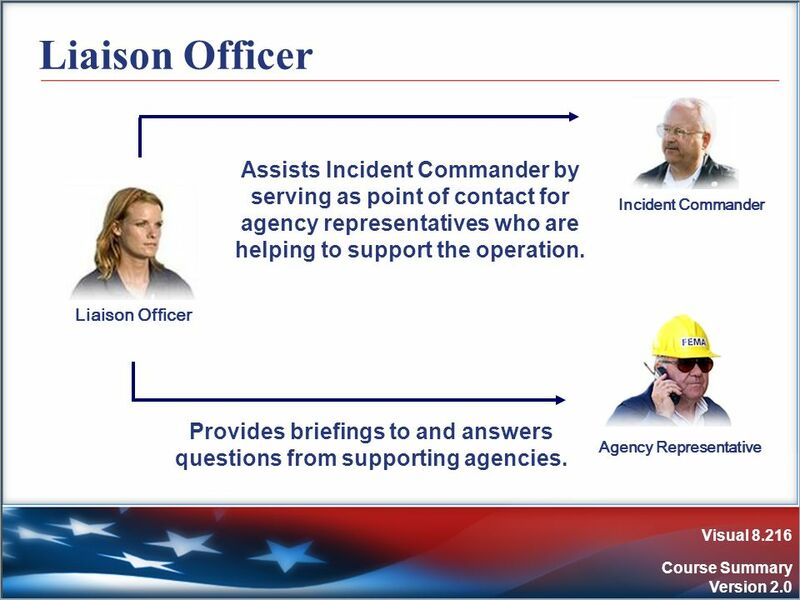 Moves the responsibility for incident command from one Incident Commander to another. 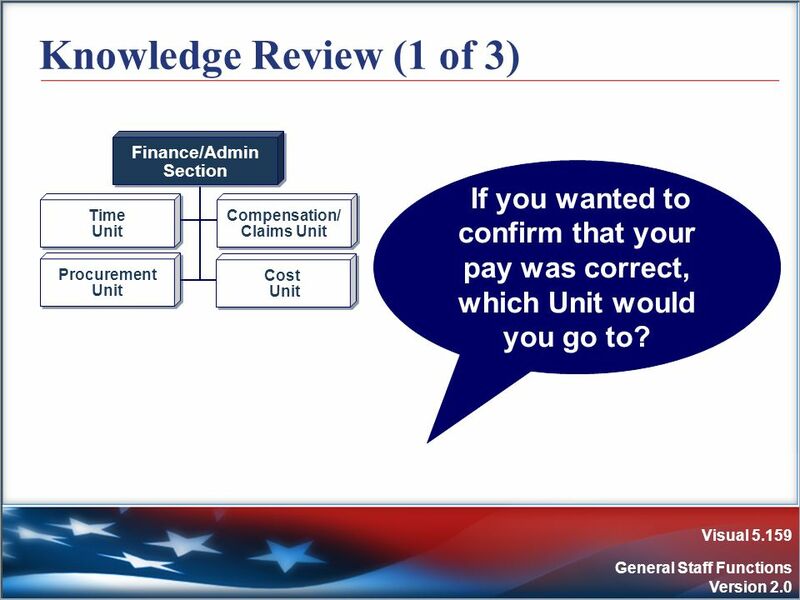 Must include a transfer of command briefing (which may be oral, written, or both). 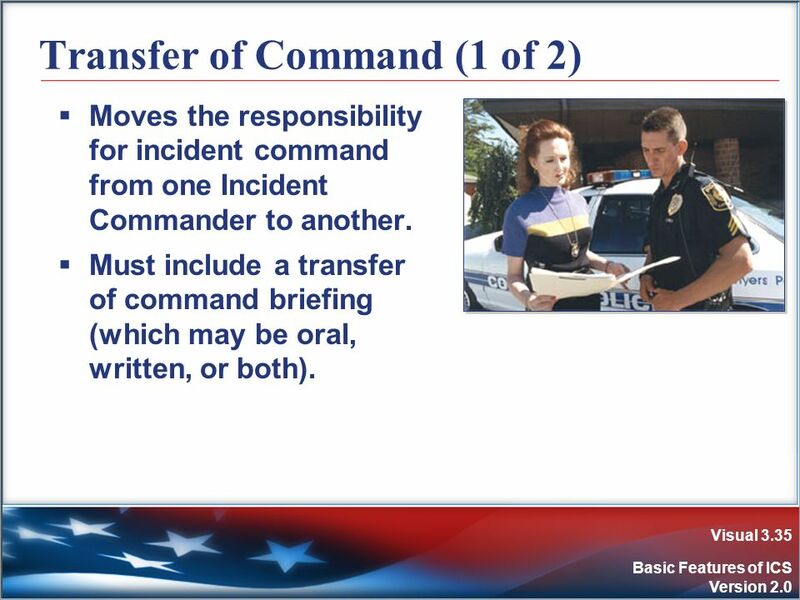 Transfer of command occurs when: A more qualified person assumes command. 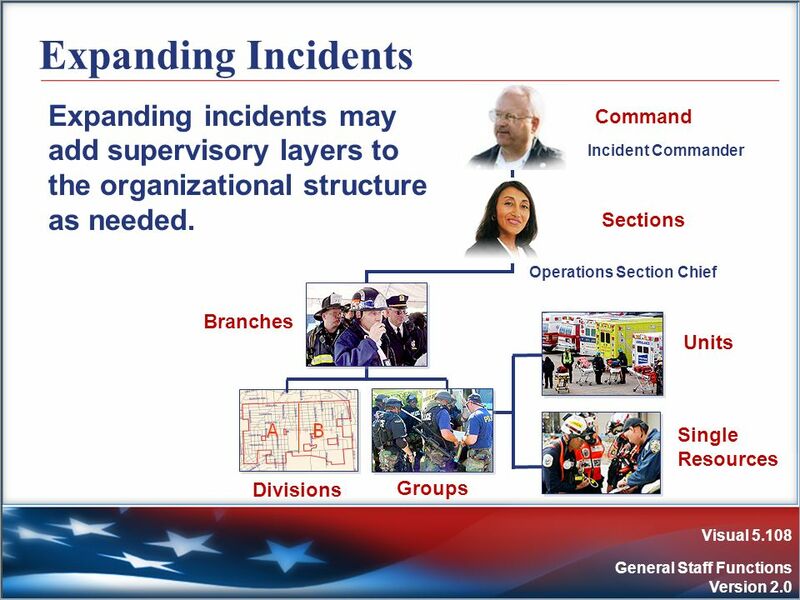 The incident situation changes over time, resulting in a legal requirement to change command. There is normal turnover of personnel on extended incidents. The incident response is concluded and responsibility is transferred to the home agency. 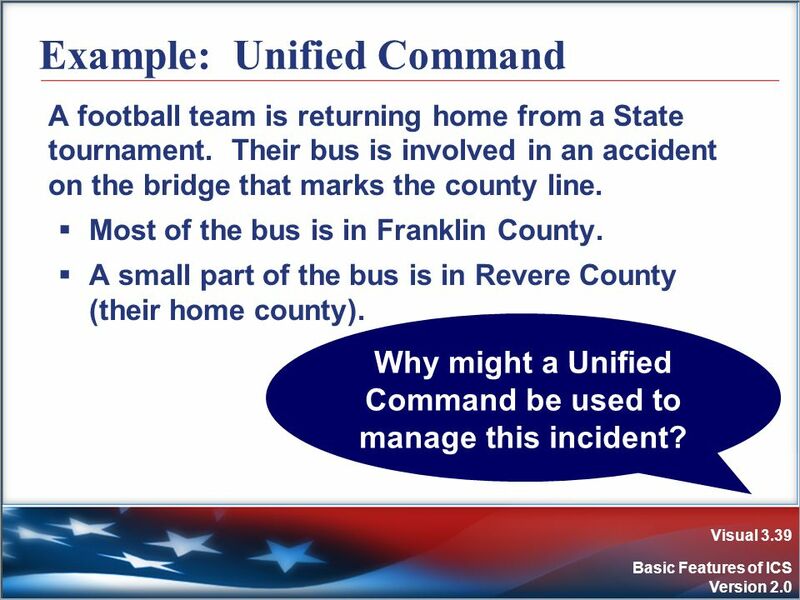 37 Don’t confuse unity of command with Unified Command! 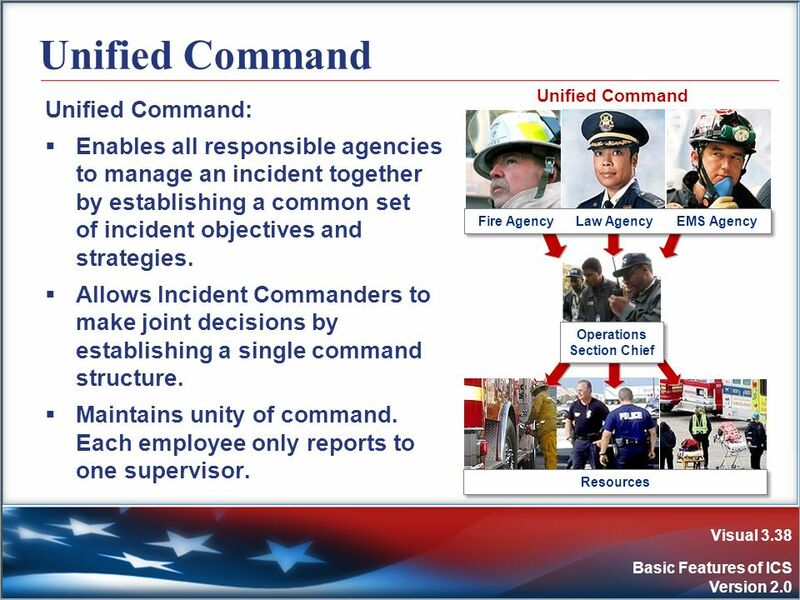 Under unity of command, personnel: Report to only one supervisor. Receive work assignments only from their supervisors. 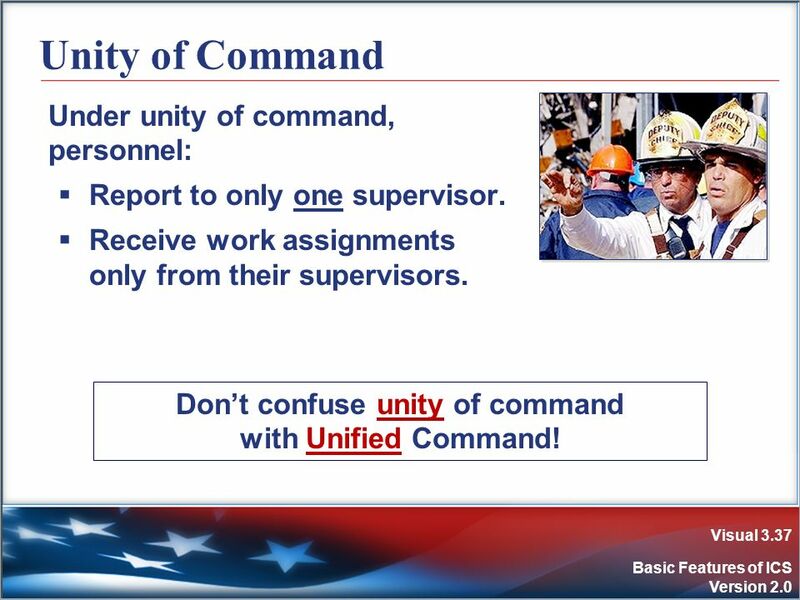 Don’t confuse unity of command with Unified Command! A football team is returning home from a State tournament. Their bus is involved in an accident on the bridge that marks the county line. Most of the bus is in Franklin County. A small part of the bus is in Revere County (their home county). 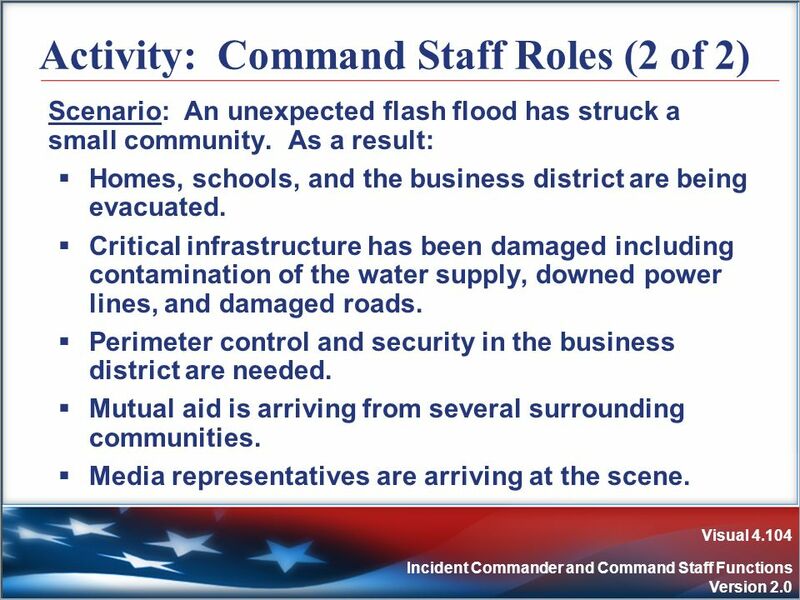 Why might a Unified Command be used to manage this incident? 40 Knowledge Review (1 of 4) Instructions: Fill in the blank. 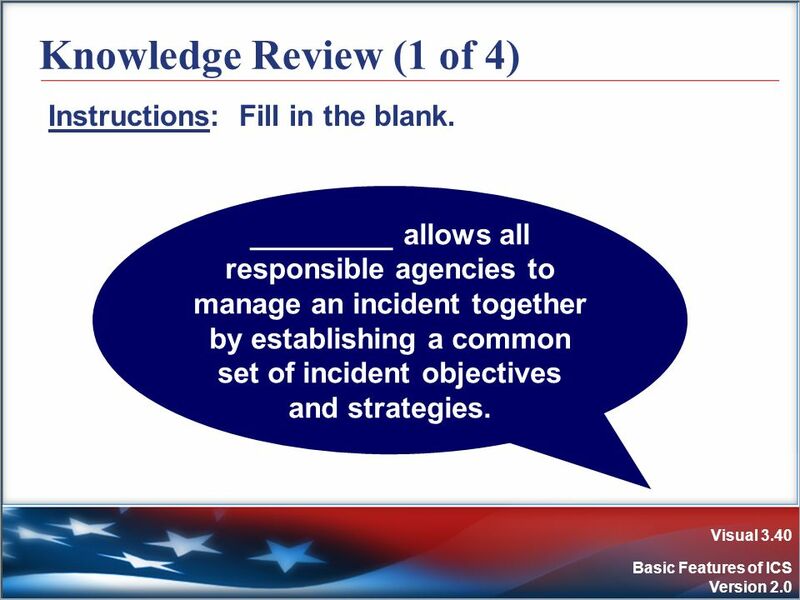 _________ allows all responsible agencies to manage an incident together by establishing a common set of incident objectives and strategies. 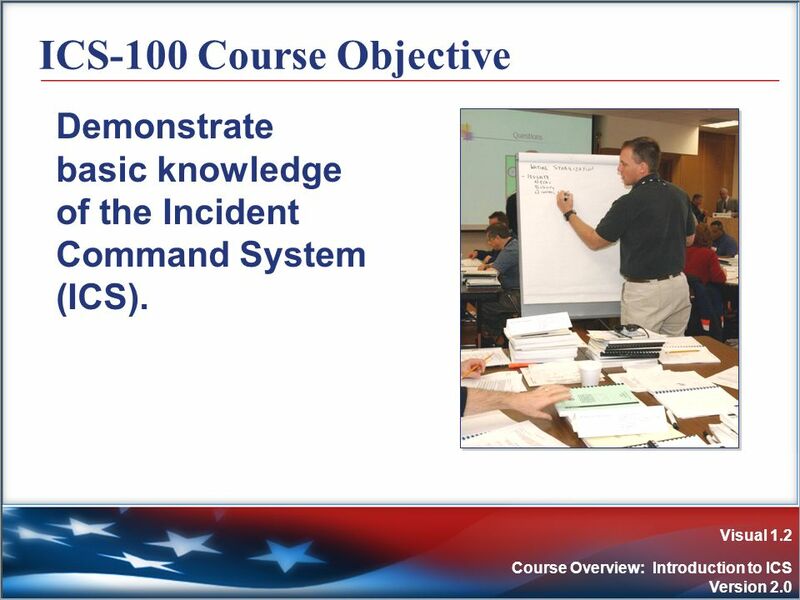 41 Who has complete responsibility for incident management? 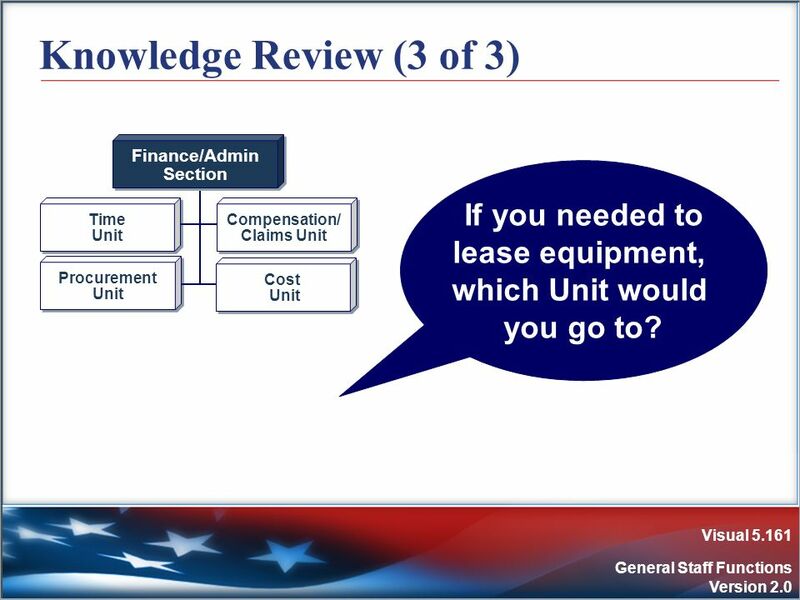 Knowledge Review (2 of 4) Instructions: Answer the question below. 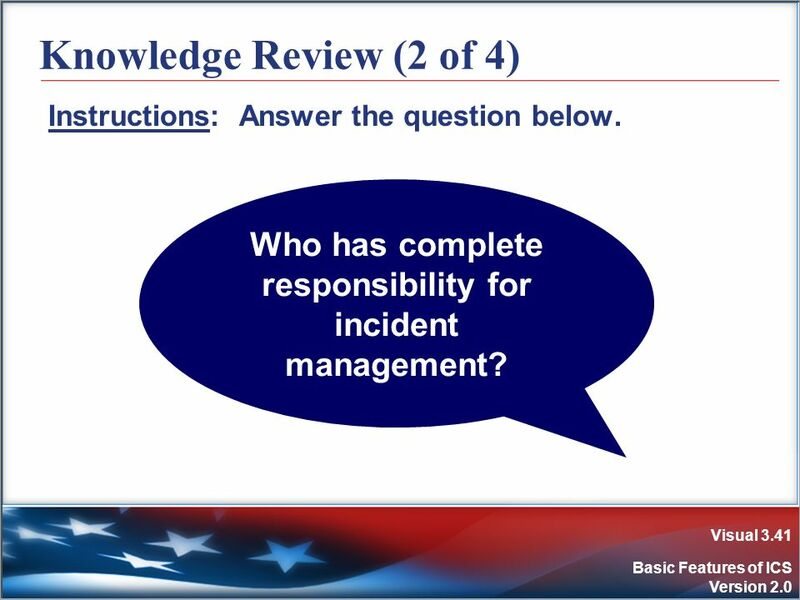 Who has complete responsibility for incident management? 42 Knowledge Review (3 of 4) Instructions: Fill in the blank. 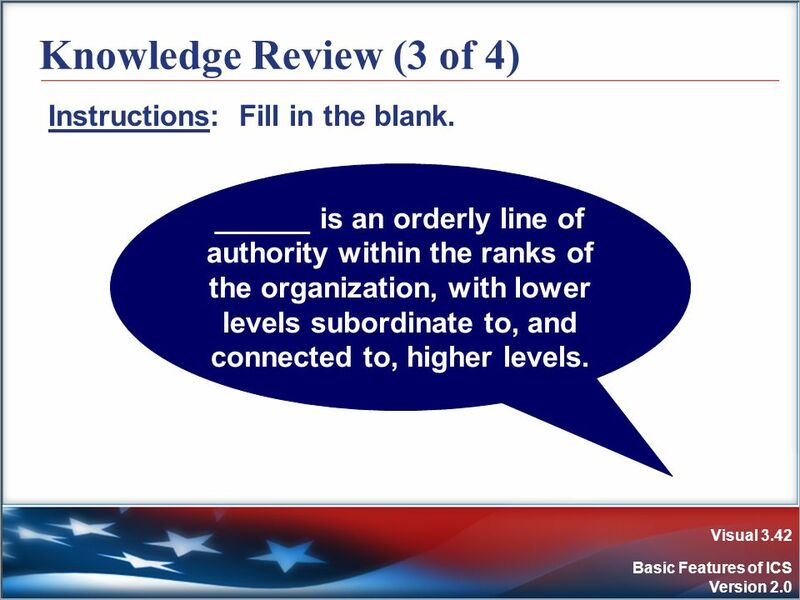 ______ is an orderly line of authority within the ranks of the organization, with lower levels subordinate to, and connected to, higher levels. 43 Knowledge Review (4 of 4) Instructions: Answer the question below. A more qualified responder arrives on the scene and will assume command. What should happen? 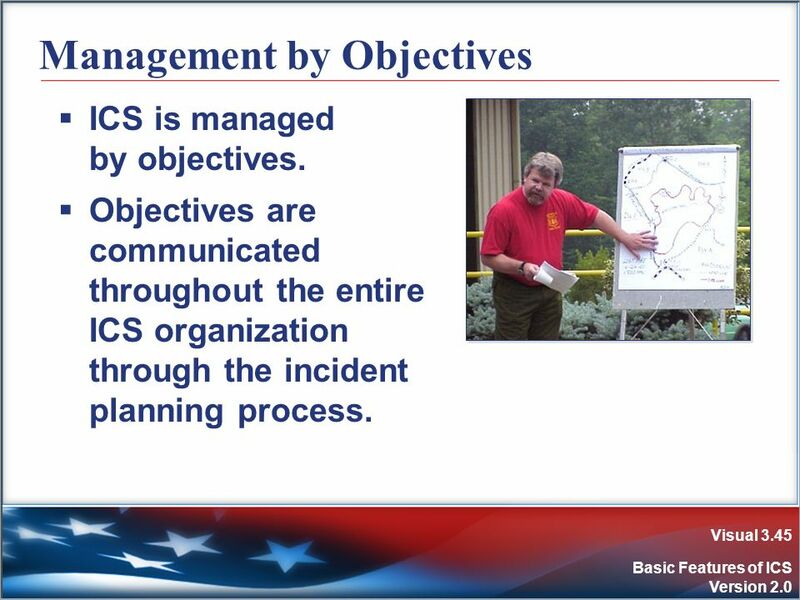 ICS is managed by objectives. 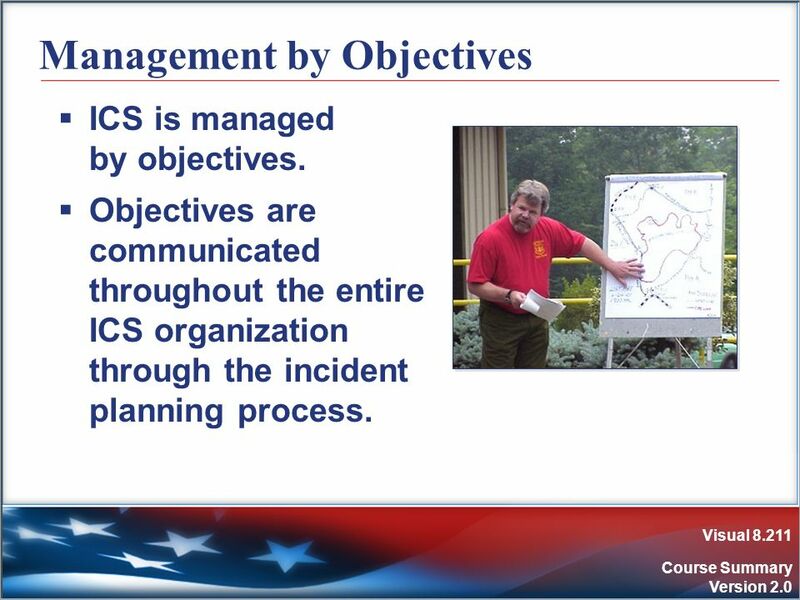 Objectives are communicated throughout the entire ICS organization through the incident planning process. 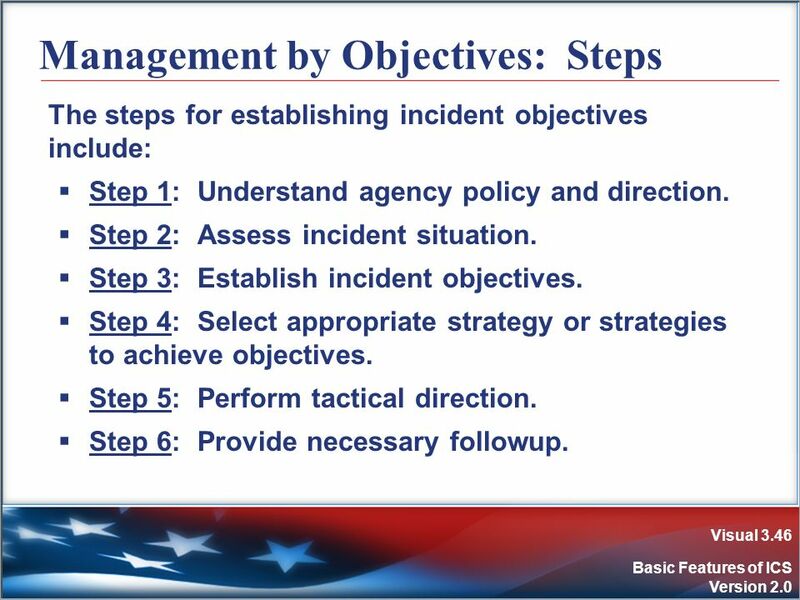 The steps for establishing incident objectives include: Step 1: Understand agency policy and direction. 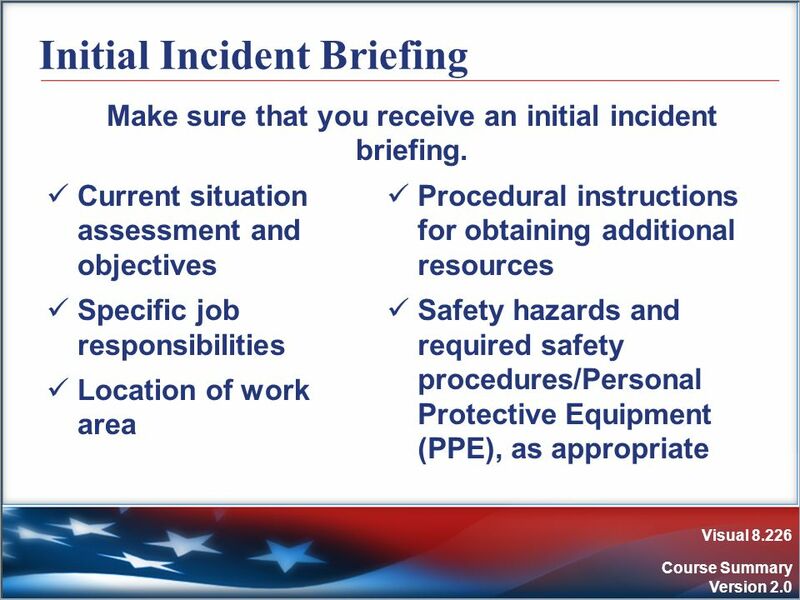 Step 2: Assess incident situation. Step 3: Establish incident objectives. 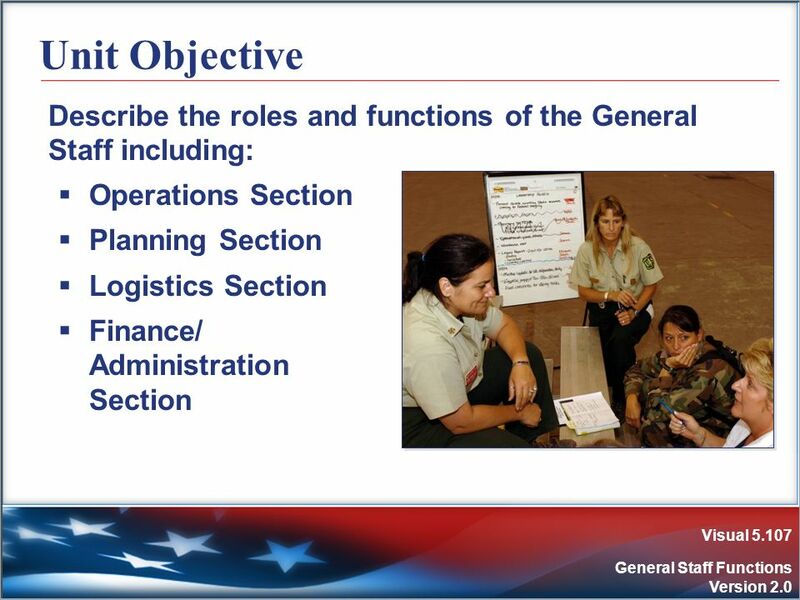 Step 4: Select appropriate strategy or strategies to achieve objectives. Step 5: Perform tactical direction. Step 6: Provide necessary followup. 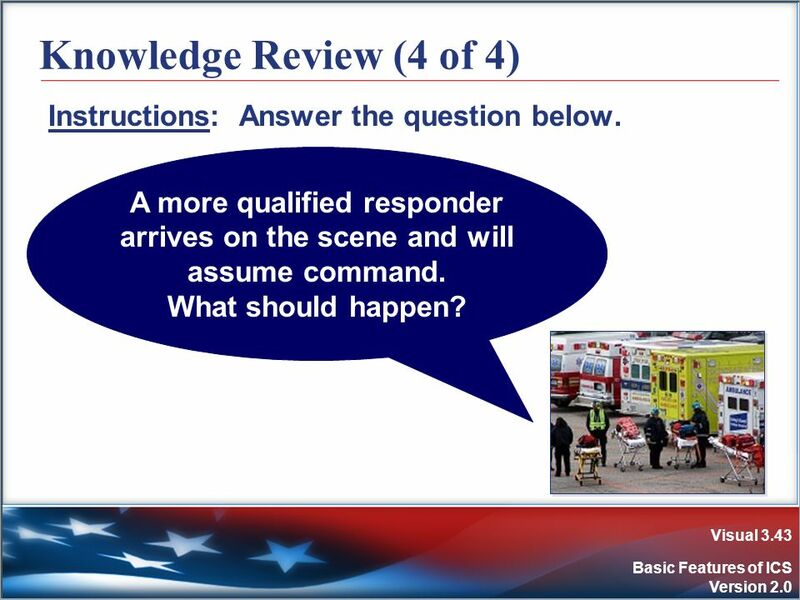 Instructions: Working as a team, review the scenario presented on the next visual. 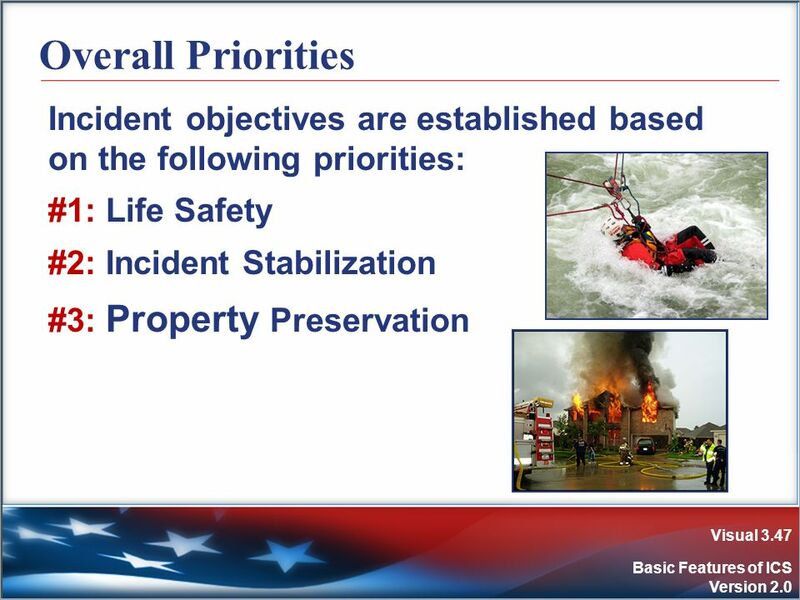 Based on the information provided, identify the top three incident management objectives. Write these objectives on chart paper. Select a spokesperson. Be prepared to present in 5 minutes. 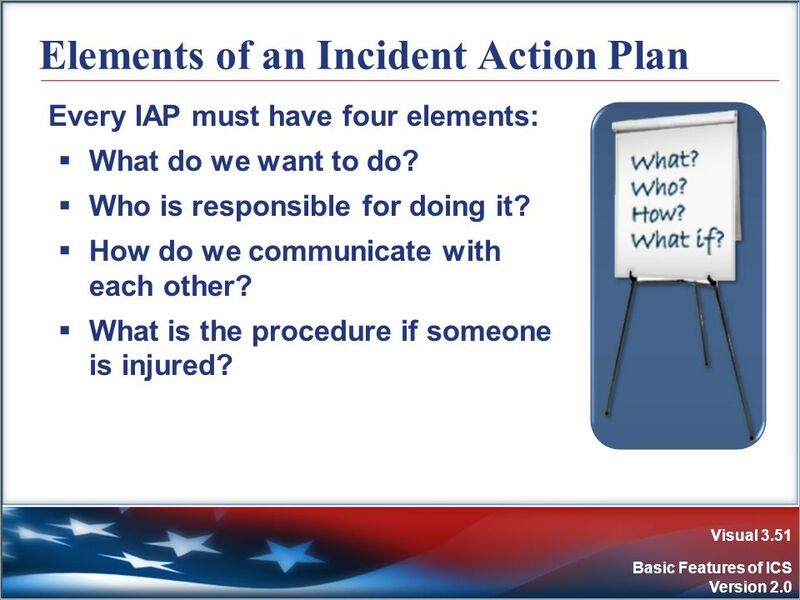 Every incident must have an Incident Action Plan (IAP) that: Specifies the incident objectives. States the activities to be completed. 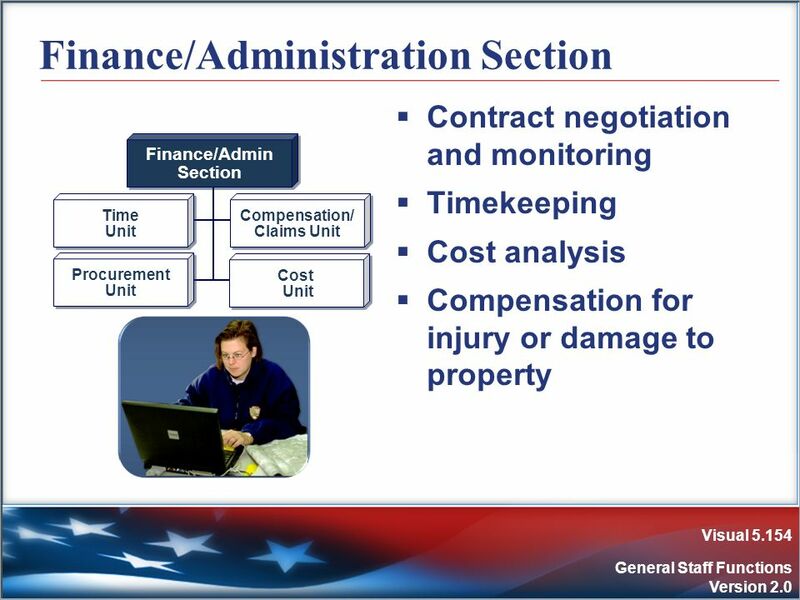 Covers a specified timeframe, called an operational period. 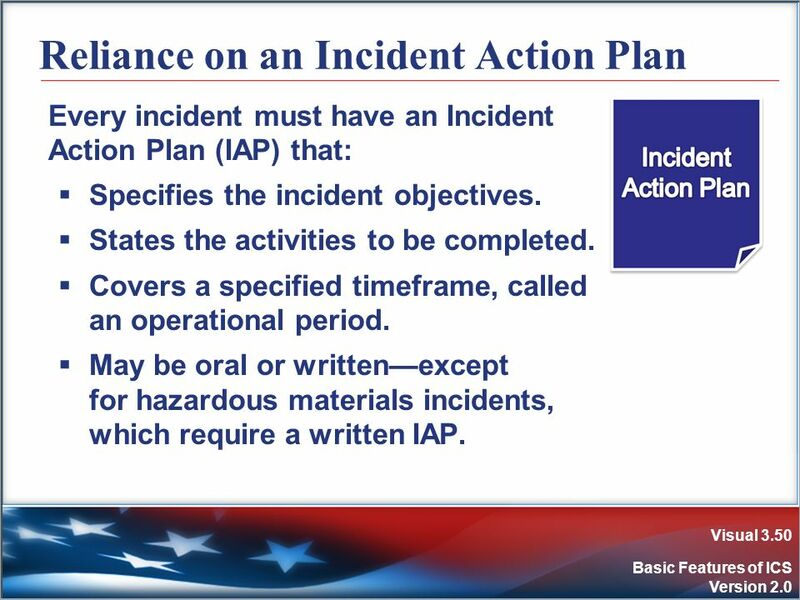 May be oral or written—except for hazardous materials incidents, which require a written IAP. Every IAP must have four elements: What do we want to do? Who is responsible for doing it? How do we communicate with each other? What is the procedure if someone is injured? 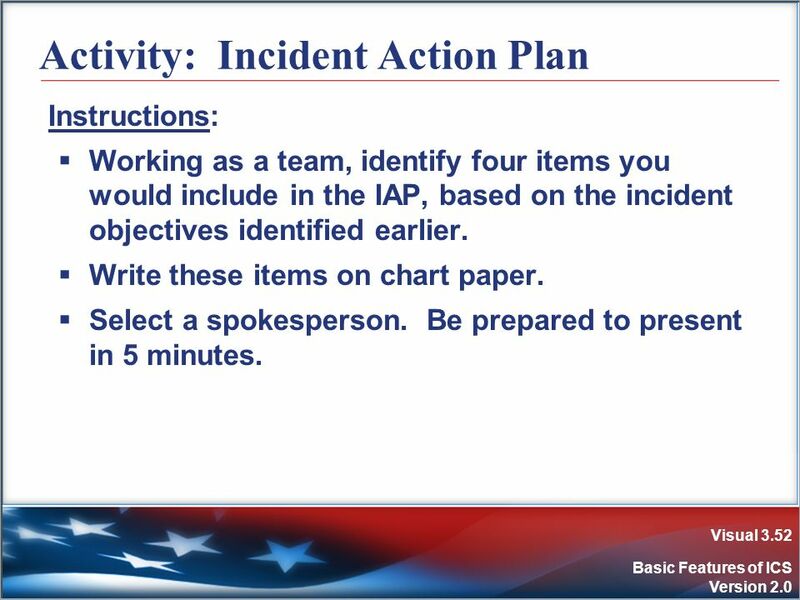 Instructions: Working as a team, identify four items you would include in the IAP, based on the incident objectives identified earlier. Write these items on chart paper. Select a spokesperson. Be prepared to present in 5 minutes. Develops in a top-down, modular fashion. Is based on the size and complexity of the incident. Is based on the hazard environment created by the incident. 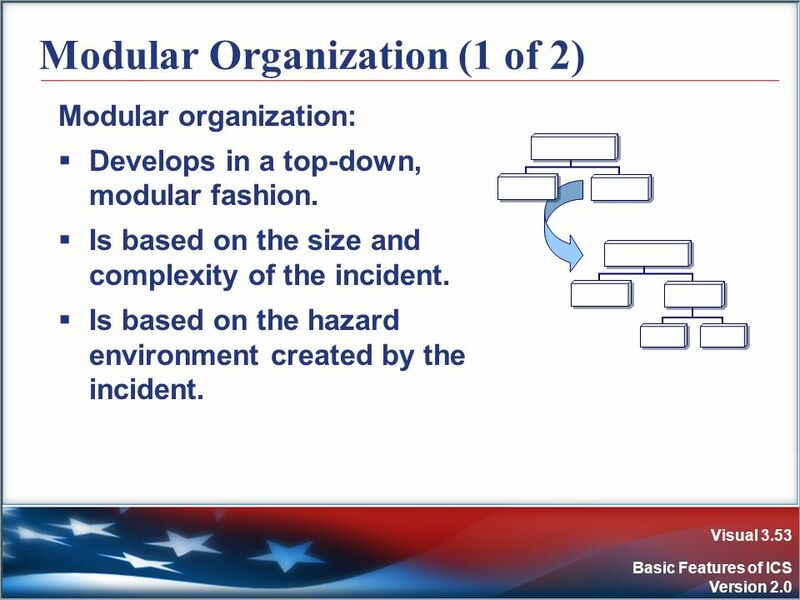 With modular organization: Incident objectives determine the organizational size. Only functions/positions that are necessary will be filled. Each element must have a person in charge. 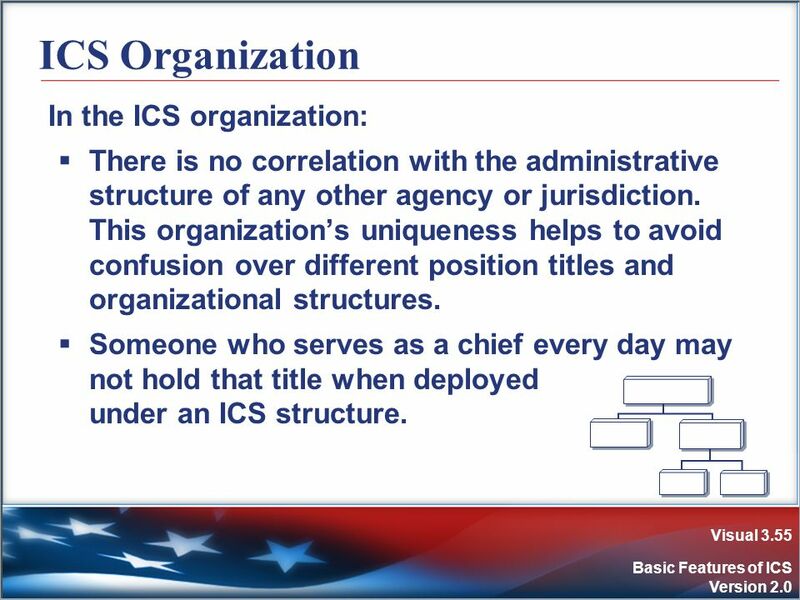 There is no correlation with the administrative structure of any other agency or jurisdiction. This organization’s uniqueness helps to avoid confusion over different position titles and organizational structures. 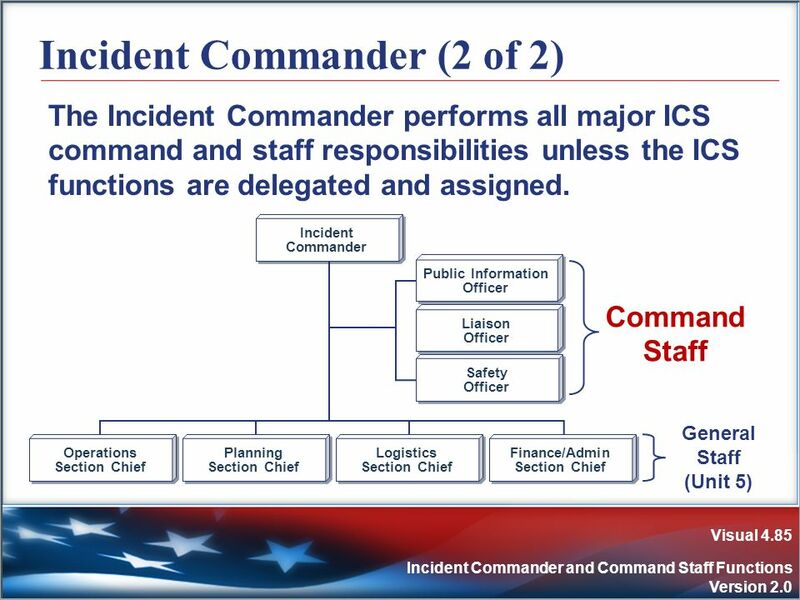 Someone who serves as a chief every day may not hold that title when deployed under an ICS structure. 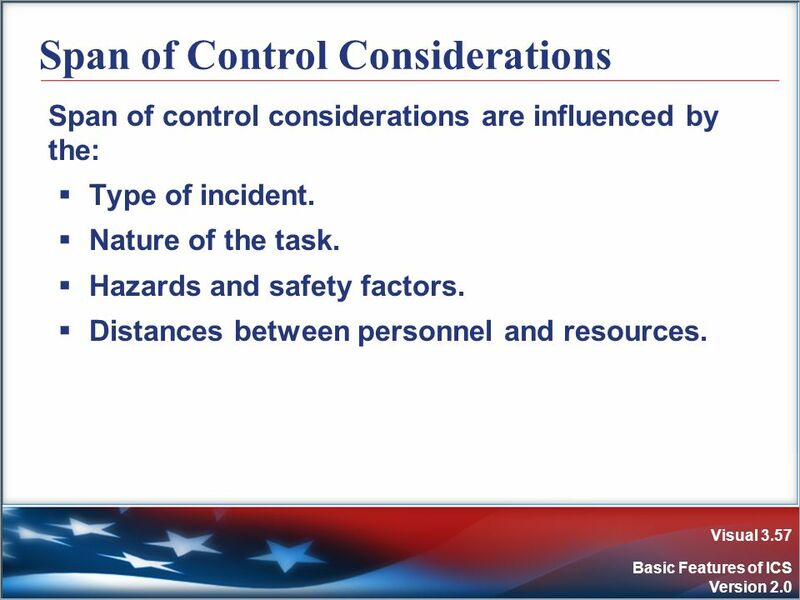 Span of control considerations are influenced by the: Type of incident. Nature of the task. Hazards and safety factors. Distances between personnel and resources. 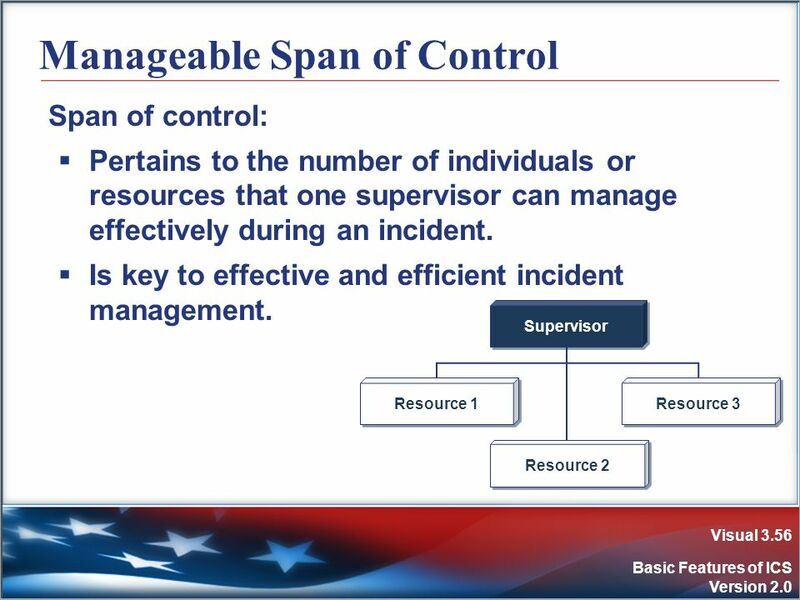 ICS span of control for any supervisor: Is between 3 and 7 subordinates. 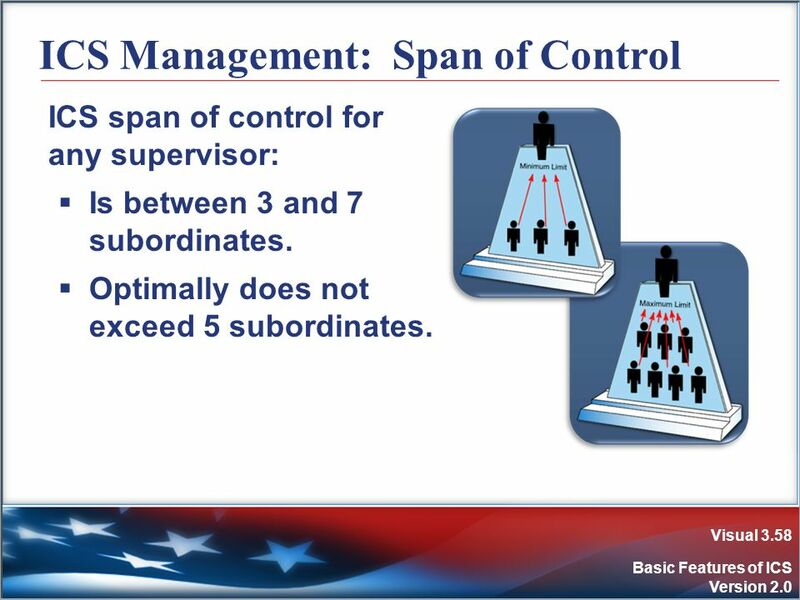 Optimally does not exceed 5 subordinates. 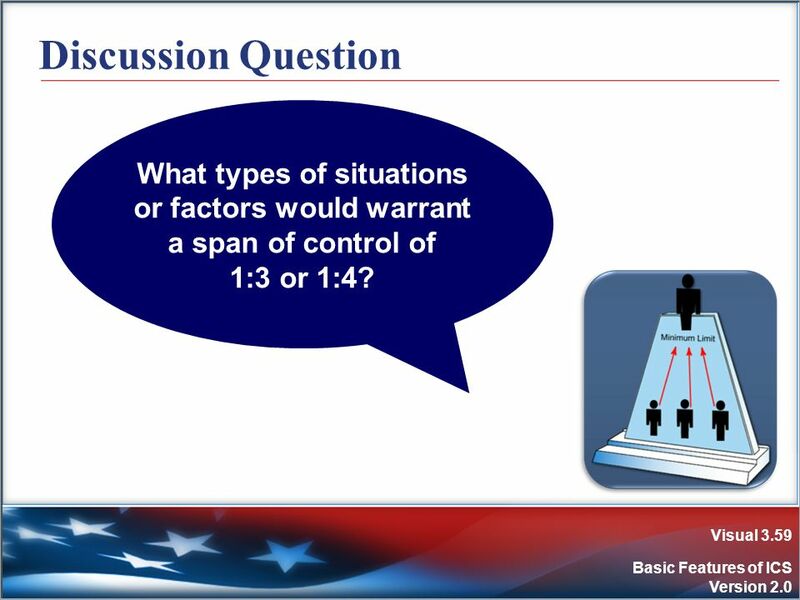 59 Discussion Question What types of situations or factors would warrant a span of control of 1:3 or 1:4? 61 Remember . 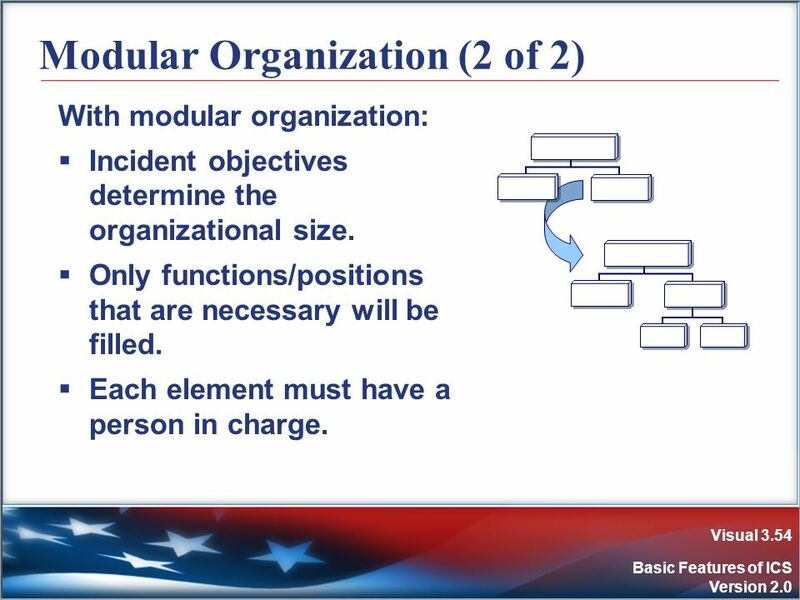 . . Modular Organization! 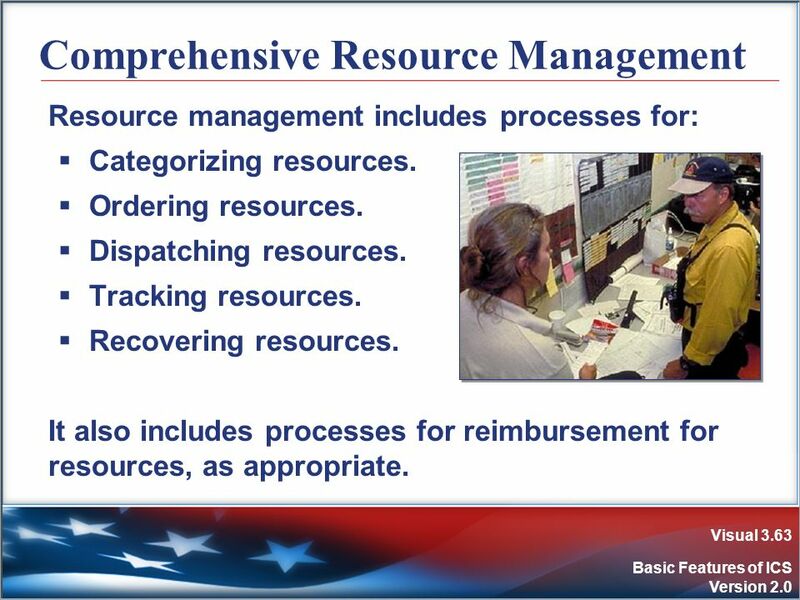 Resource management includes processes for: Categorizing resources. Ordering resources. Dispatching resources. Tracking resources. Recovering resources. 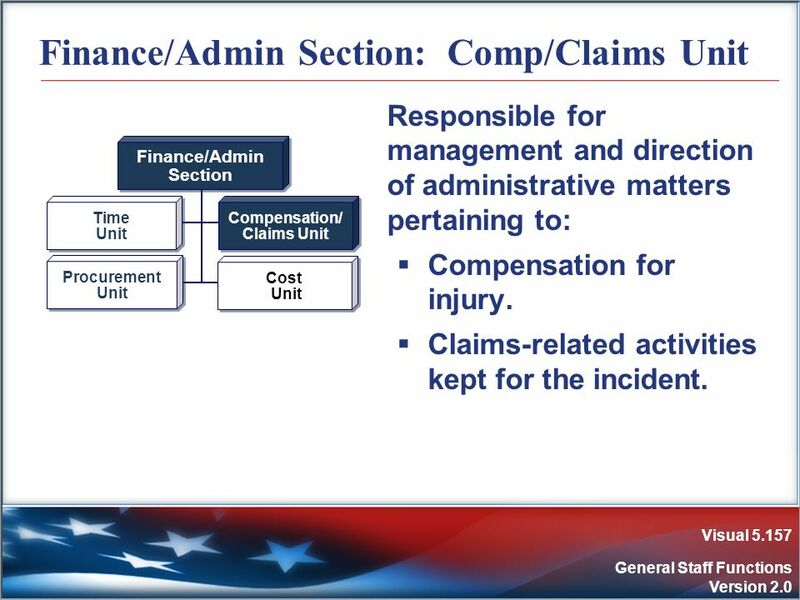 It also includes processes for reimbursement for resources, as appropriate. Assigned: Currently working on an assignment under the direction of a supervisor. Available: Ready for immediate assignment and has been issued all required equipment. Out of Service: Not available or ready to be assigned (e.g., maintenance issues, rest periods). 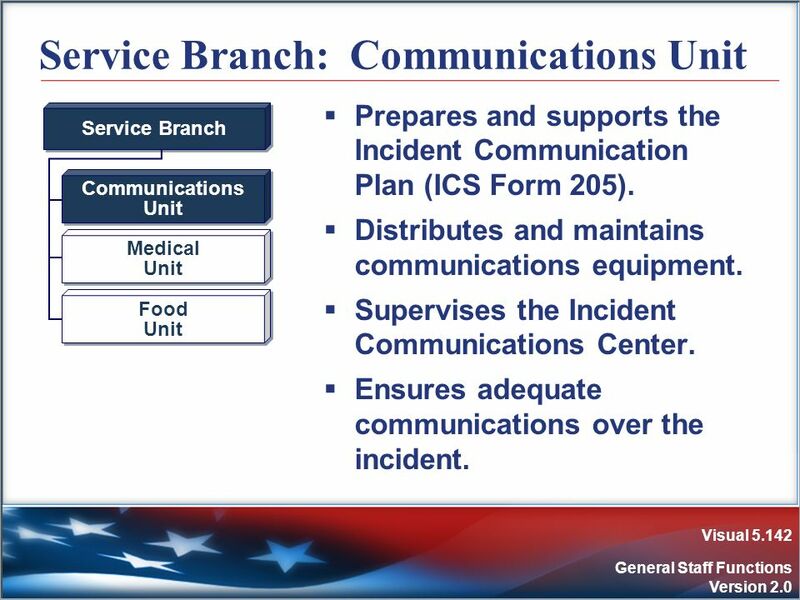 Incident communications are facilitated through: The development and use of a common communications plan. 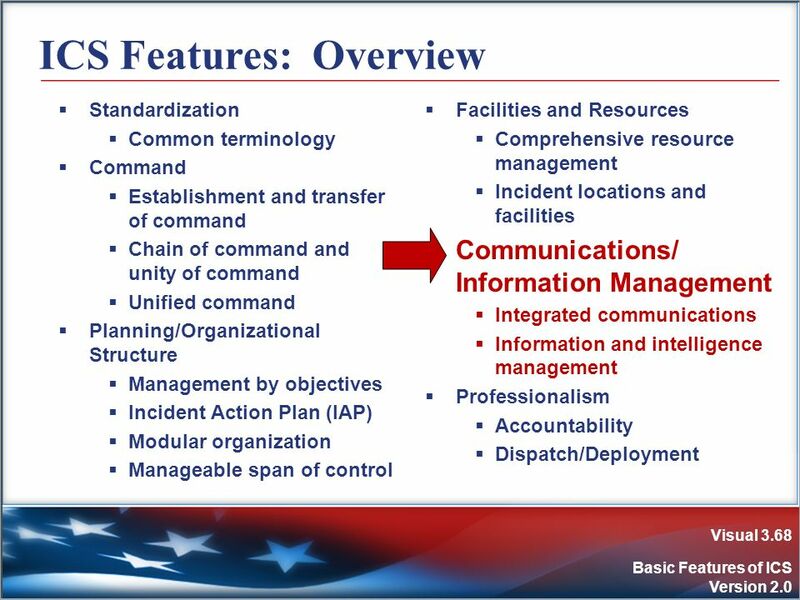 The interoperability of communication equipment, procedures, and systems. 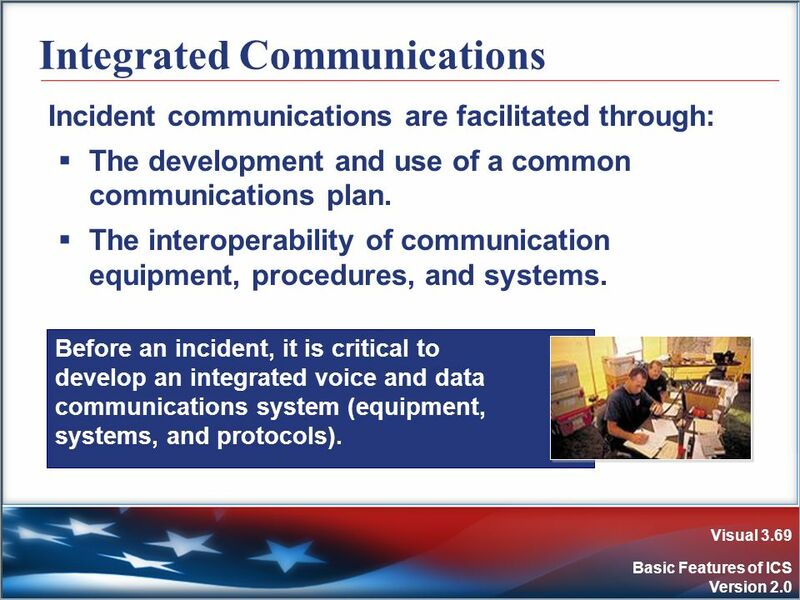 Before an incident, it is critical to develop an integrated voice and data communications system (equipment, systems, and protocols). Jan. 13, 1982: Air Florida Flight 90 crashed into the 14th St. Bridge in Washington, DC, during a snowstorm. More than 70 people lost their lives. Police, fire, and EMS crews responded quickly to the scene but discovered that they couldn't coordinate their efforts because they couldn't talk to each other by radio. Sept. 11, 2001: When American Airlines Flight 77 crashed into the Pentagon, 900 users from 50 different agencies were able to communicate with one another. Response agencies had learned an invaluable lesson from the Air Florida tragedy. 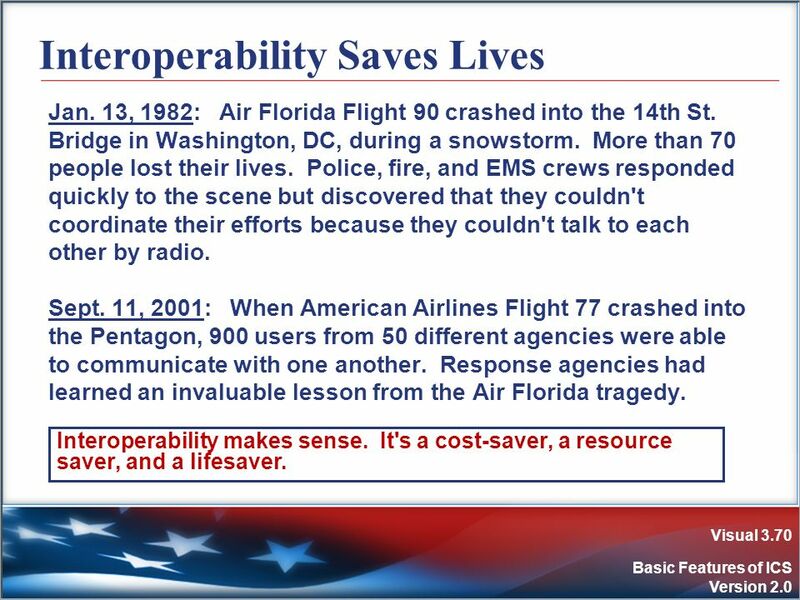 Interoperability makes sense. It's a cost-saver, a resource saver, and a lifesaver. 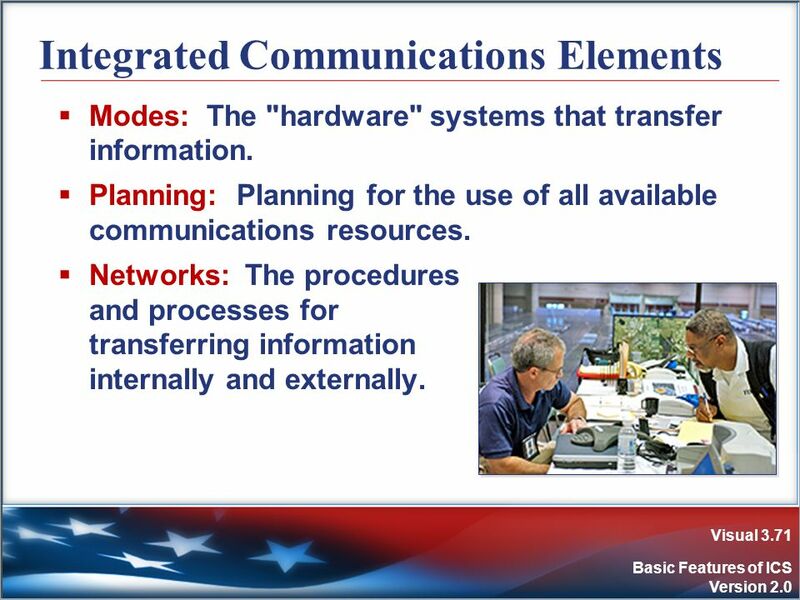 Modes: The "hardware" systems that transfer information. Planning: Planning for the use of all available communications resources. Networks: The procedures and processes for transferring information internally and externally. 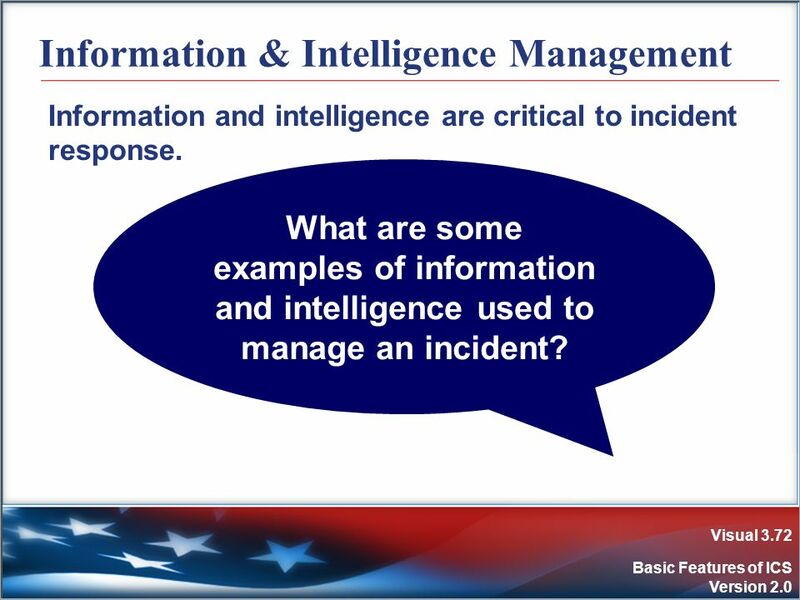 Information and intelligence are critical to incident response. 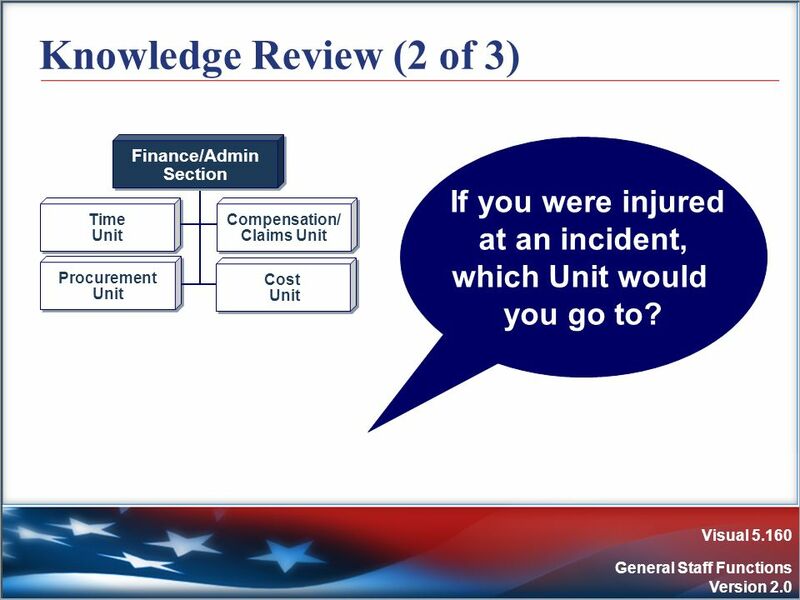 What are some examples of information and intelligence used to manage an incident? Check-In. 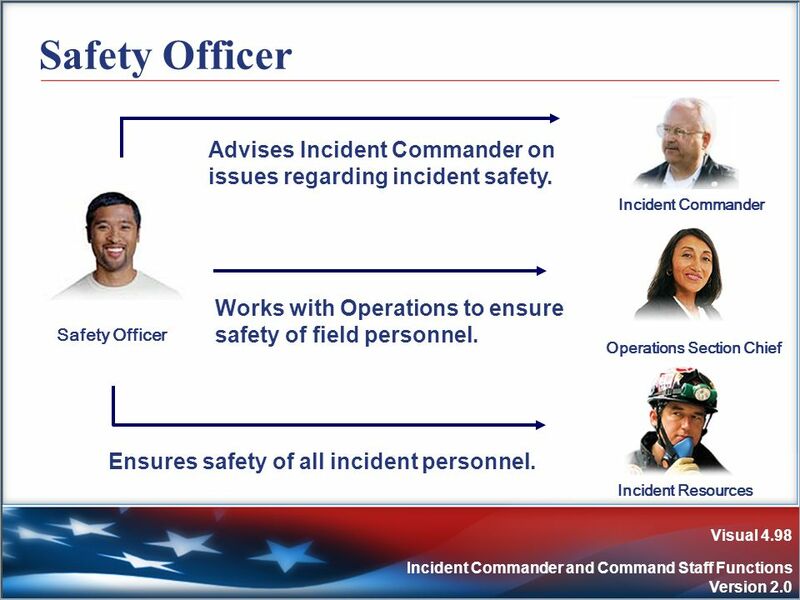 All responders must report in to receive an assignment in accordance with the procedures established by the Incident Commander. 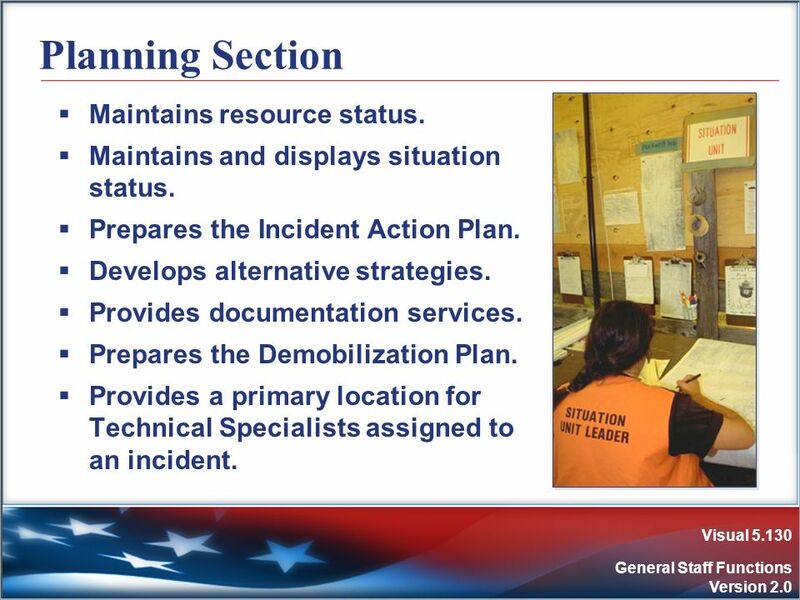 Incident Action Plan. 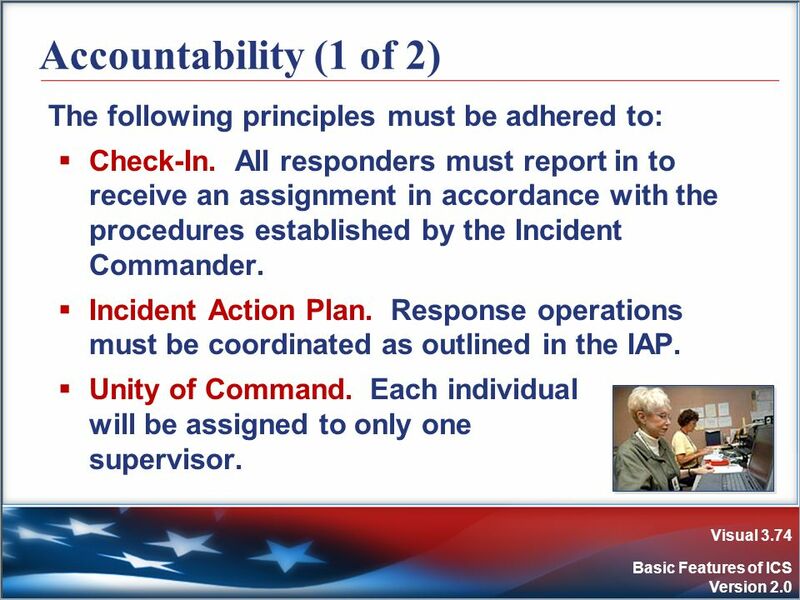 Response operations must be coordinated as outlined in the IAP. Unity of Command. 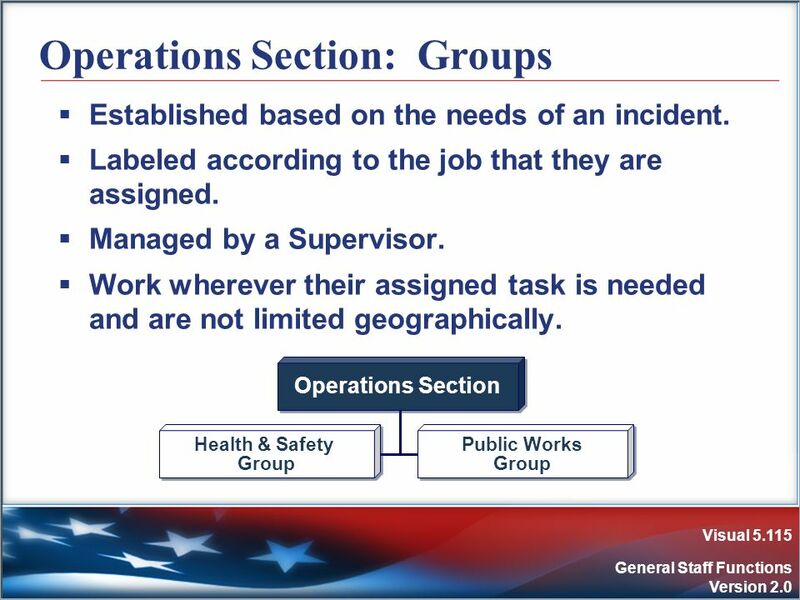 Each individual will be assigned to only one supervisor. 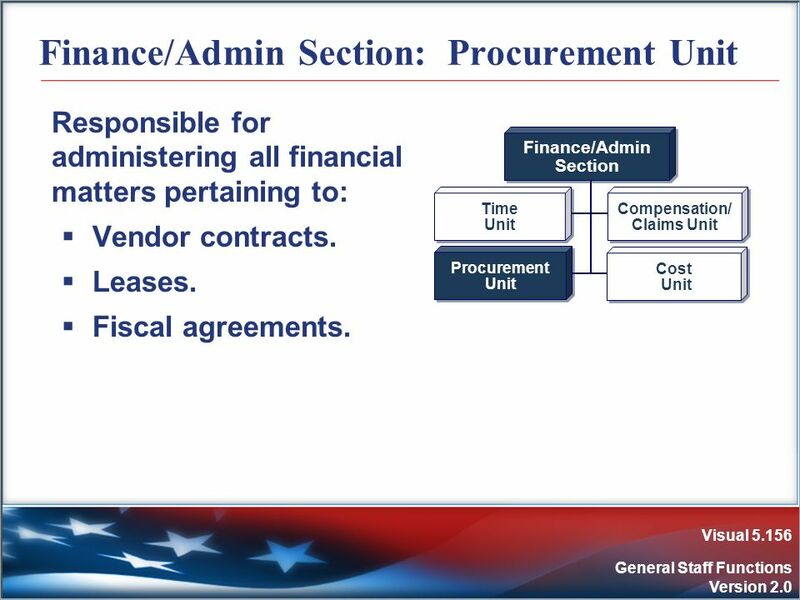 75 Accountability (2 of 2) Span of Control. 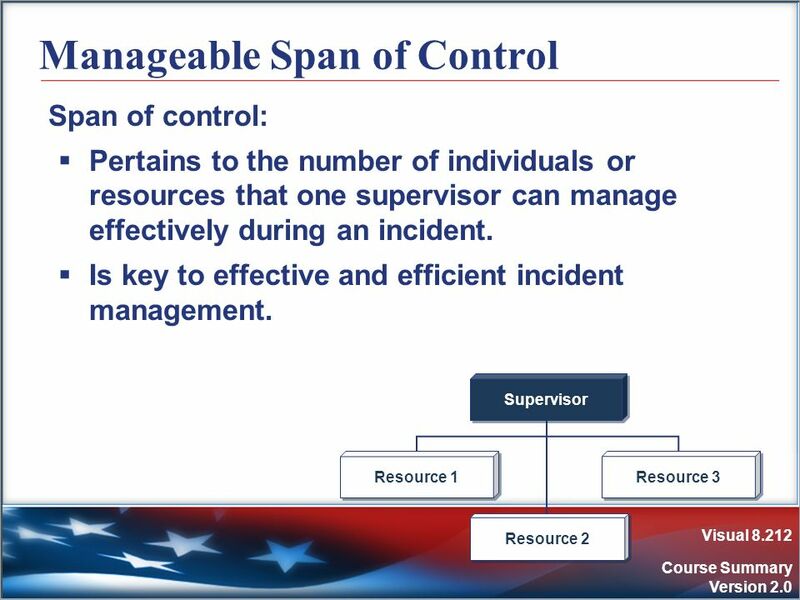 Supervisors must be able to adequately supervise and control their subordinates, as well as communicate with and manage all resources under their supervision. Resource Tracking. 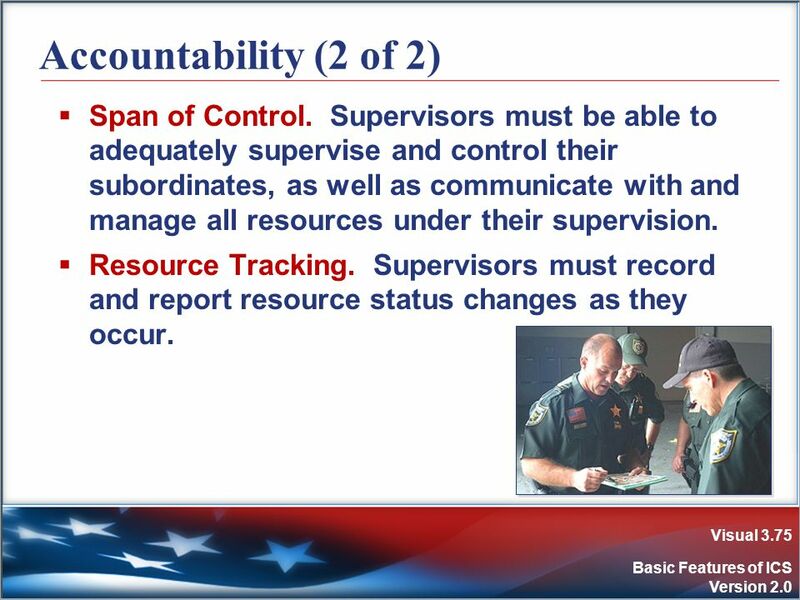 Supervisors must record and report resource status changes as they occur. The situation must be assessed and the response planned. Managing resources safely and effectively is the most important consideration. 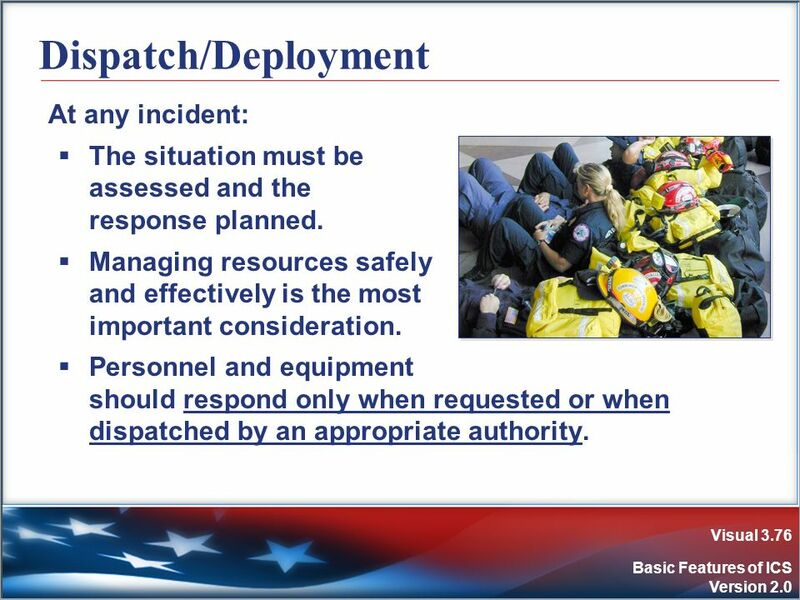 Personnel and equipment should respond only when requested or when dispatched by an appropriate authority. 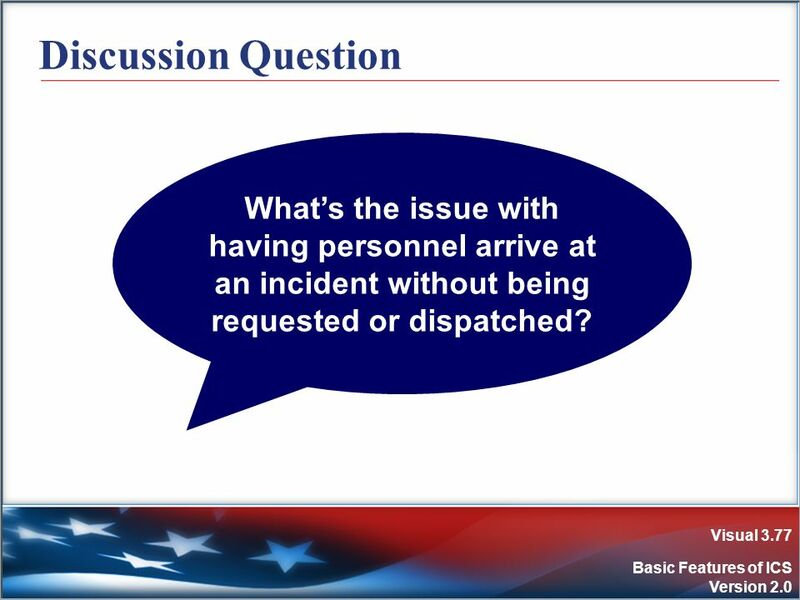 77 Discussion Question What’s the issue with having personnel arrive at an incident without being requested or dispatched? 78 Knowledge Review (1 of 2) Instructions: Decide if the statement is TRUE or FALSE. 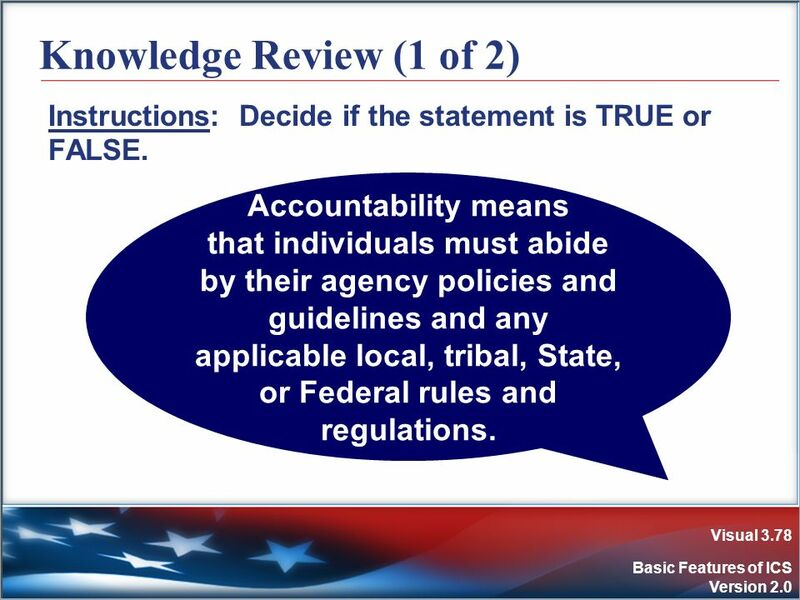 Accountability means that individuals must abide by their agency policies and guidelines and any applicable local, tribal, State, or Federal rules and regulations. 79 Knowledge Review (2 of 2) Instructions: Decide if the statement is TRUE or FALSE. 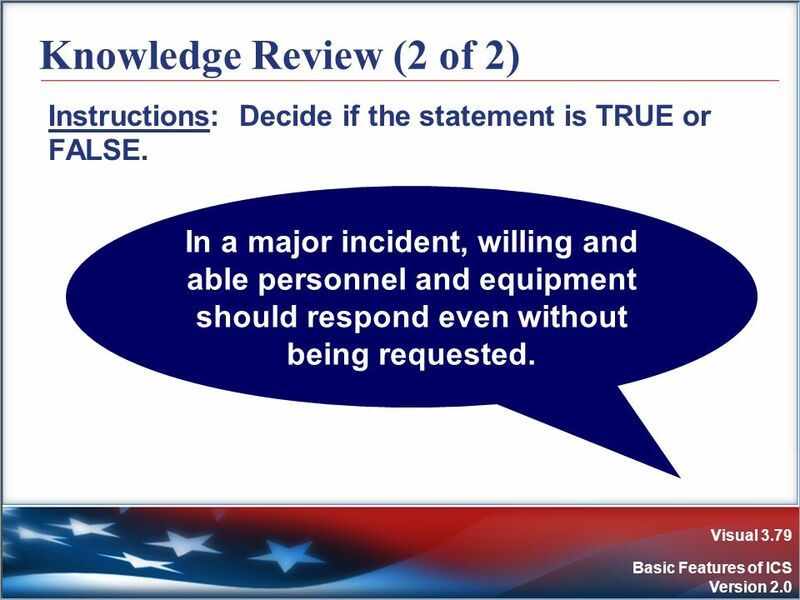 In a major incident, willing and able personnel and equipment should respond even without being requested. 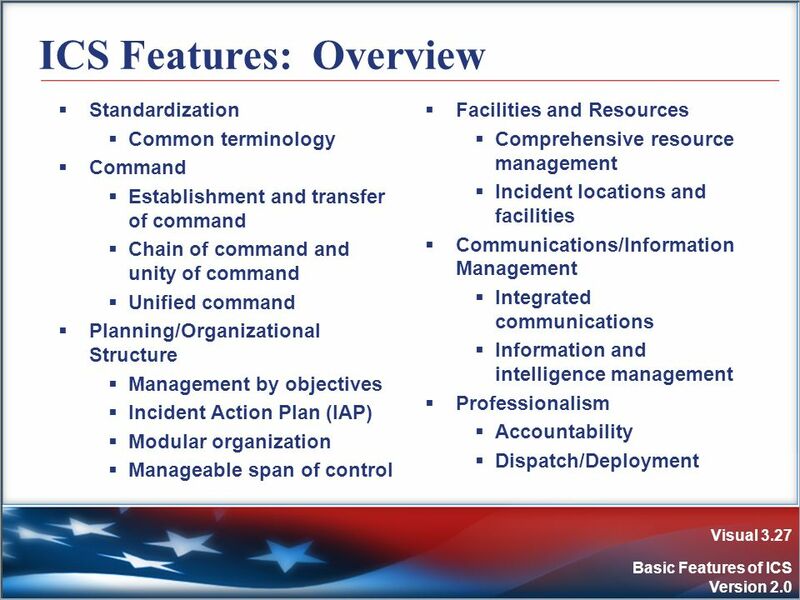 80 Summary (1 of 2) ICS: Utilizes management features including the use of common terminology and a modular organizational structure. 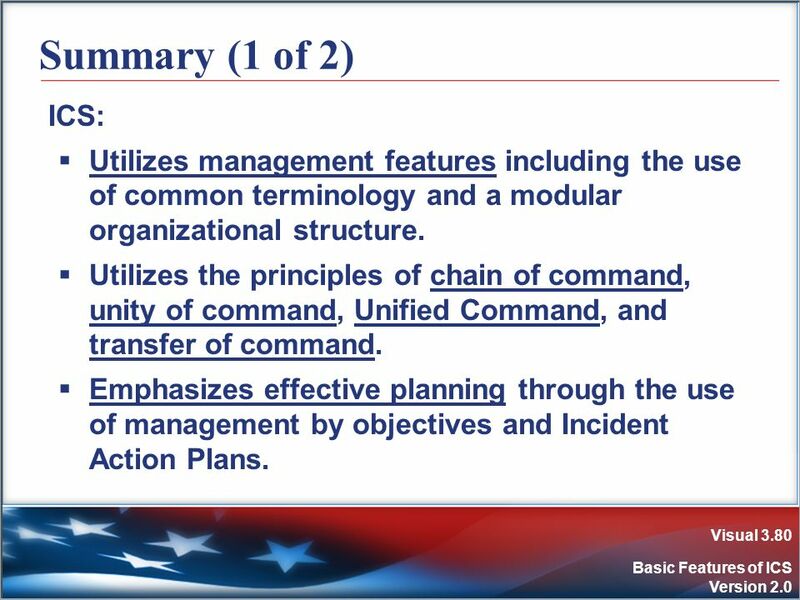 Utilizes the principles of chain of command, unity of command, Unified Command, and transfer of command. 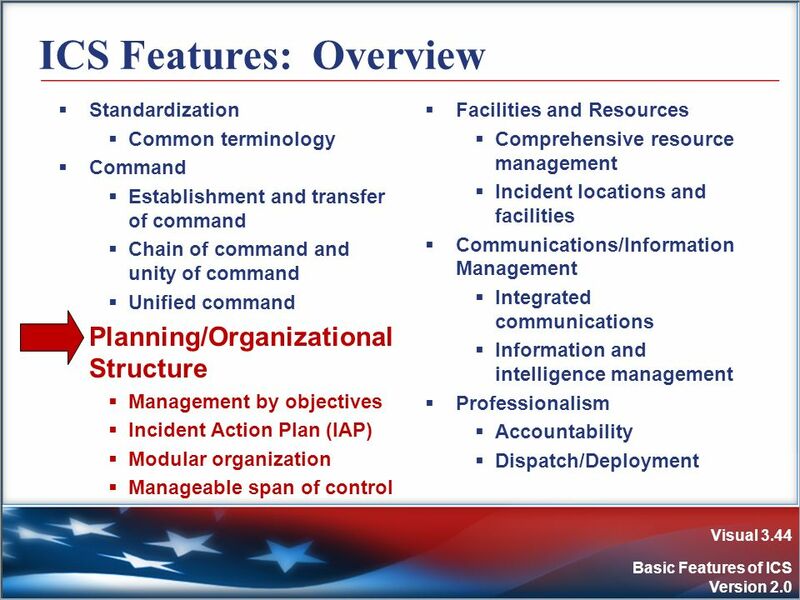 Emphasizes effective planning through the use of management by objectives and Incident Action Plans. 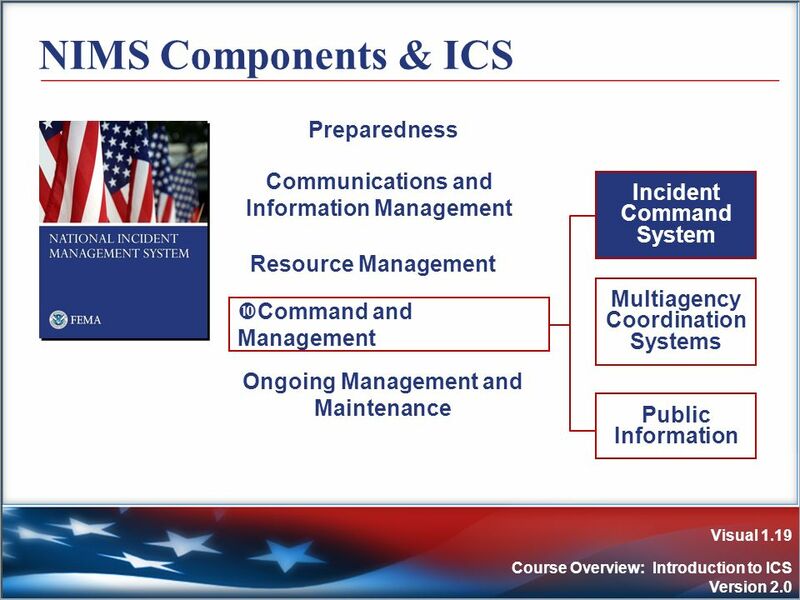 81 Summary (2 of 2) ICS: Supports responders by providing data they need through effective information and intelligence management. 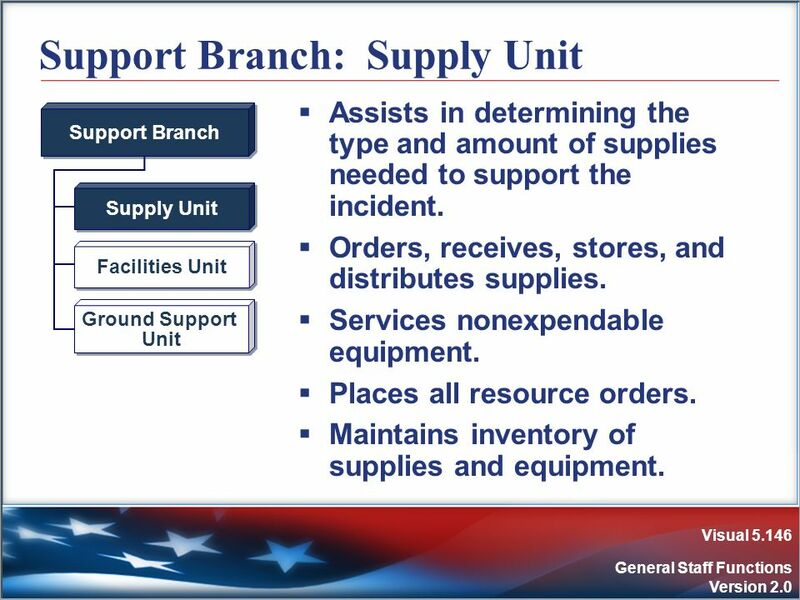 Helps ensure that resources are ready through accountability and dispatch/deployment processes. Ensures full utilization of incident resources by maintaining a manageable span of control, implementing resource management practices, and ensuring integrated communications. 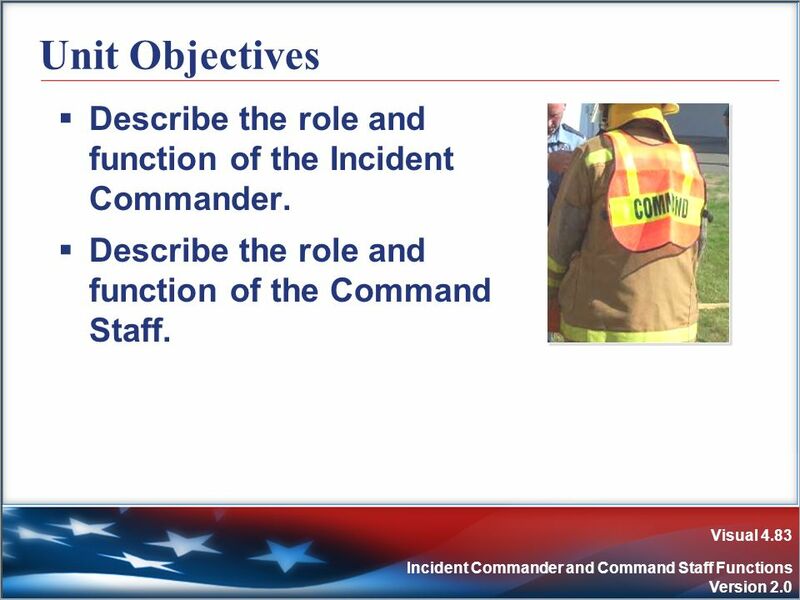 83 Unit Objectives Describe the role and function of the Incident Commander. 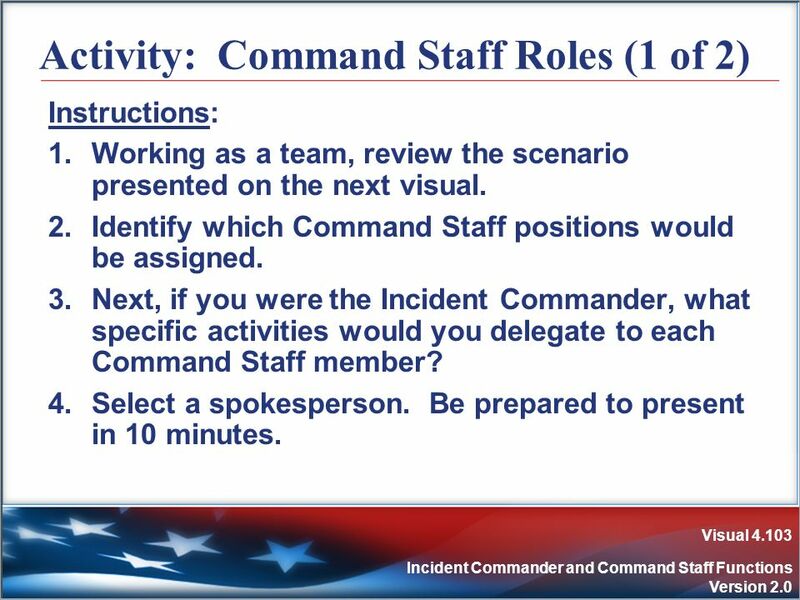 Describe the role and function of the Command Staff. 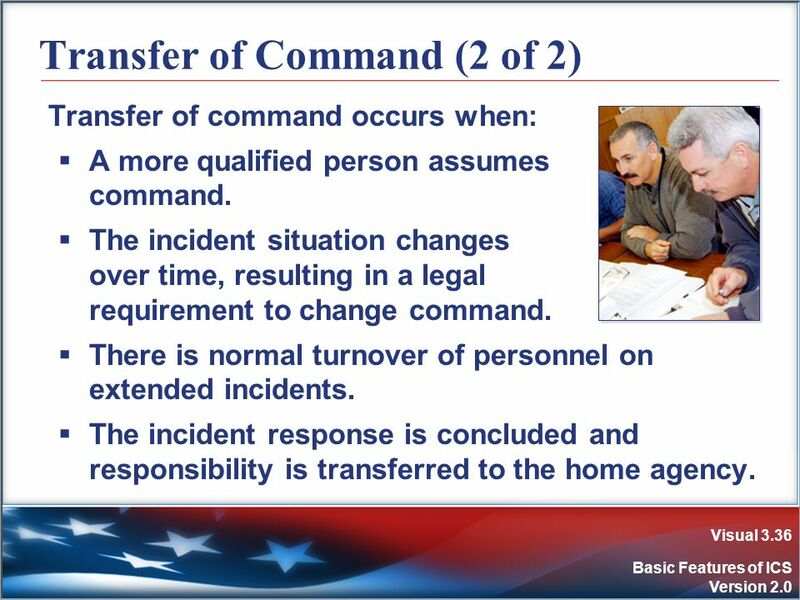 Upon arriving at an incident, the higher ranking person will either assume command, maintain command as is, or transfer command to a third party. 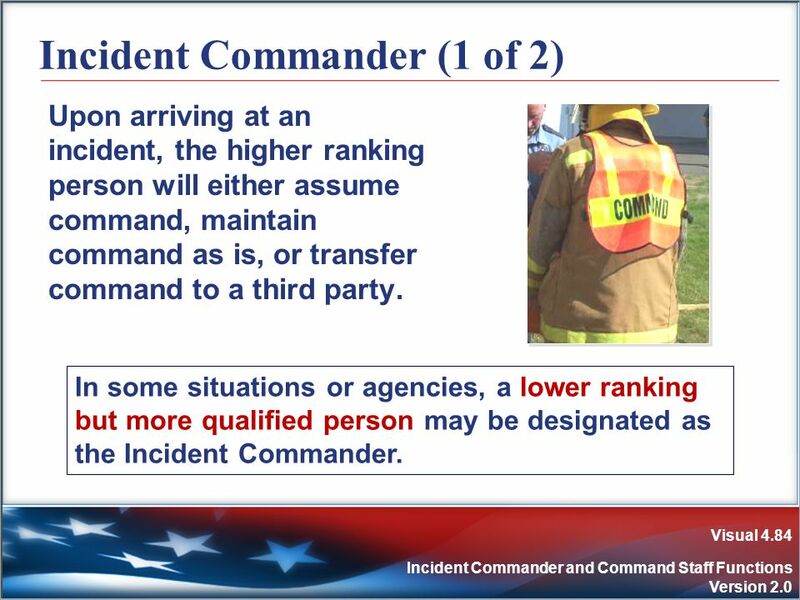 In some situations or agencies, a lower ranking but more qualified person may be designated as the Incident Commander. 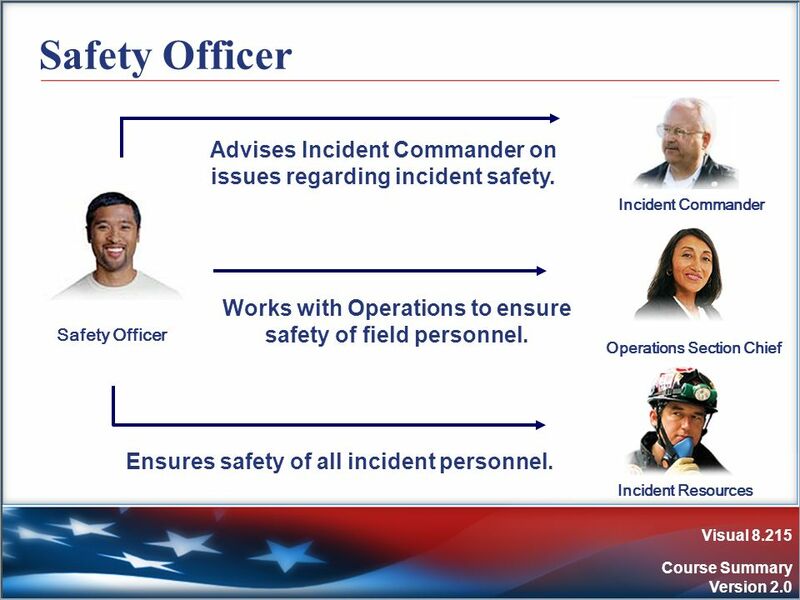 The Incident Commander is specifically responsible for: Ensuring incident safety. Providing information services to internal and external stakeholders. Establishing and maintaining liaison with other agencies participating in the incident. 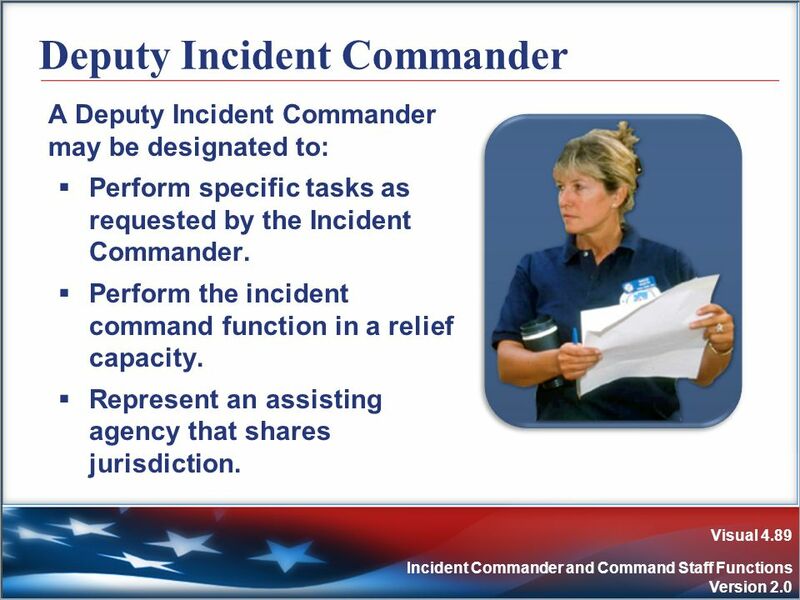 A Deputy Incident Commander may be designated to: Perform specific tasks as requested by the Incident Commander. 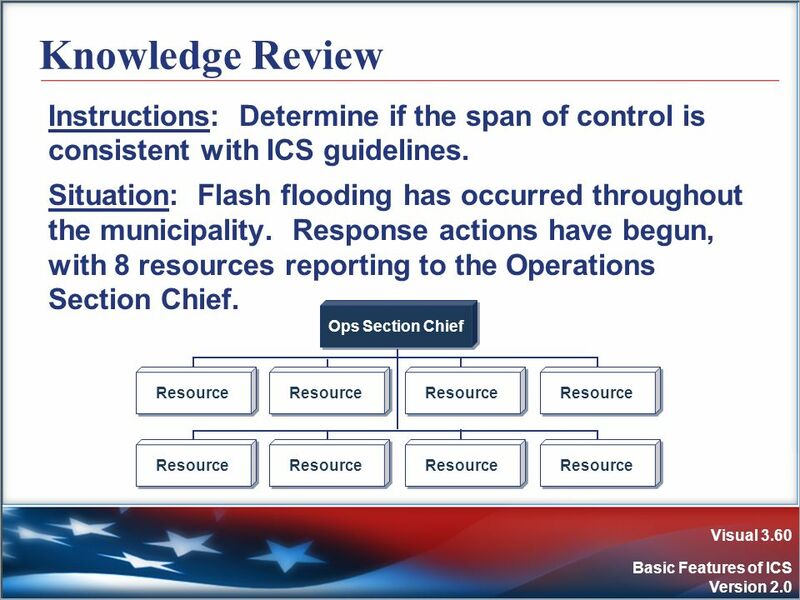 Perform the incident command function in a relief capacity. Represent an assisting agency that shares jurisdiction. 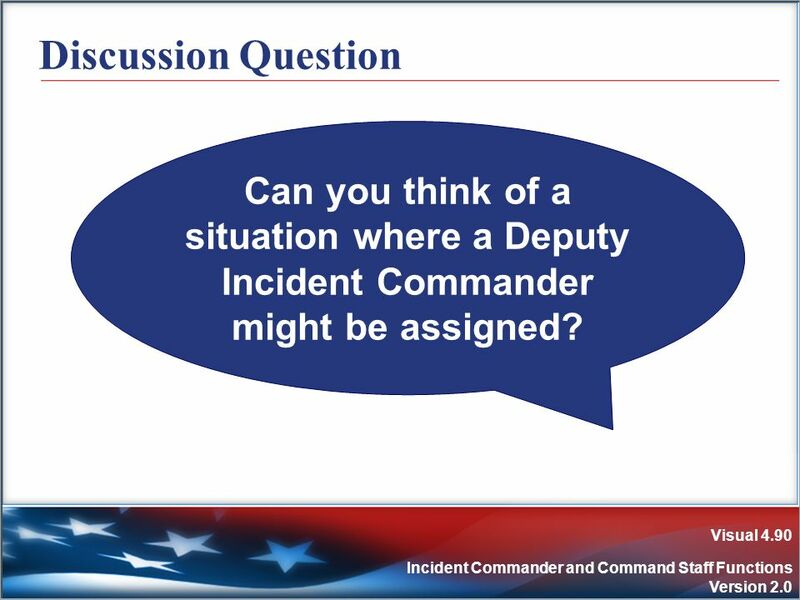 90 Discussion Question Can you think of a situation where a Deputy Incident Commander might be assigned? 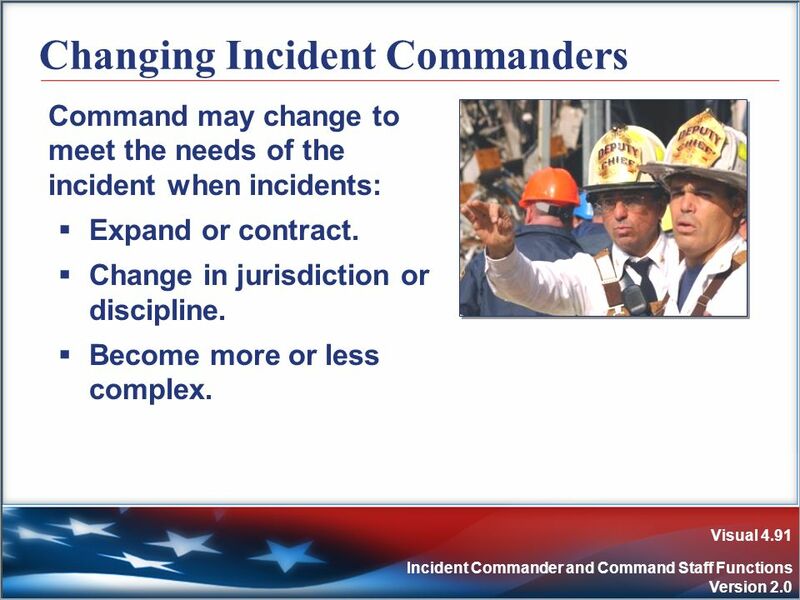 Command may change to meet the needs of the incident when incidents: Expand or contract. Change in jurisdiction or discipline. Become more or less complex. 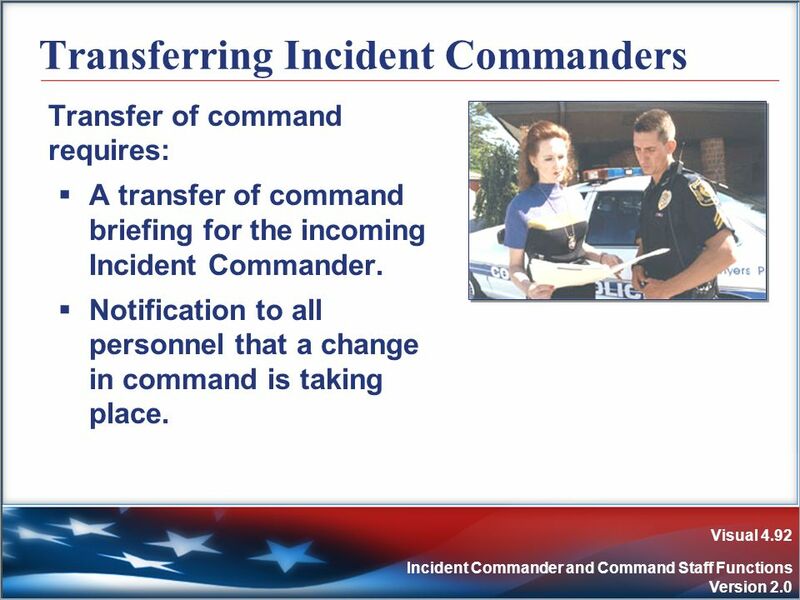 Transfer of command requires: A transfer of command briefing for the incoming Incident Commander. Notification to all personnel that a change in command is taking place. 93 Who has overall responsibility at an incident? 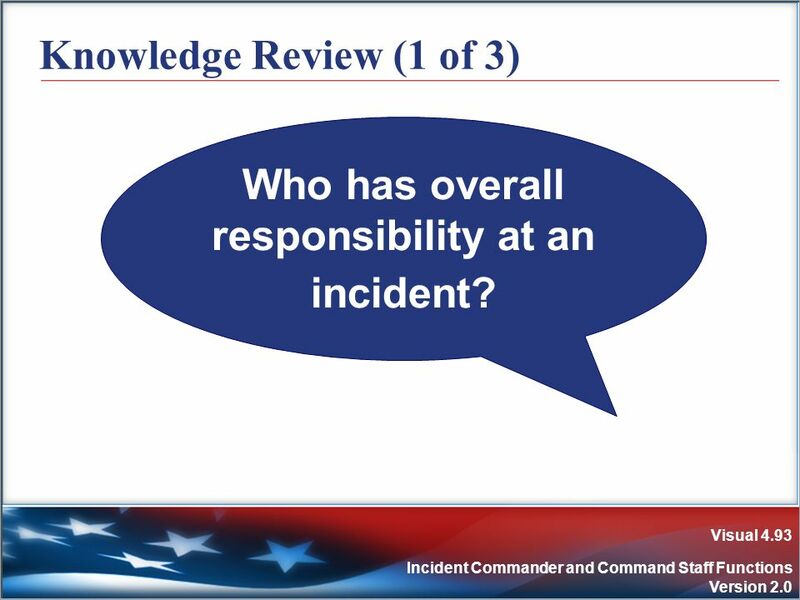 Knowledge Review (1 of 3) Who has overall responsibility at an incident? 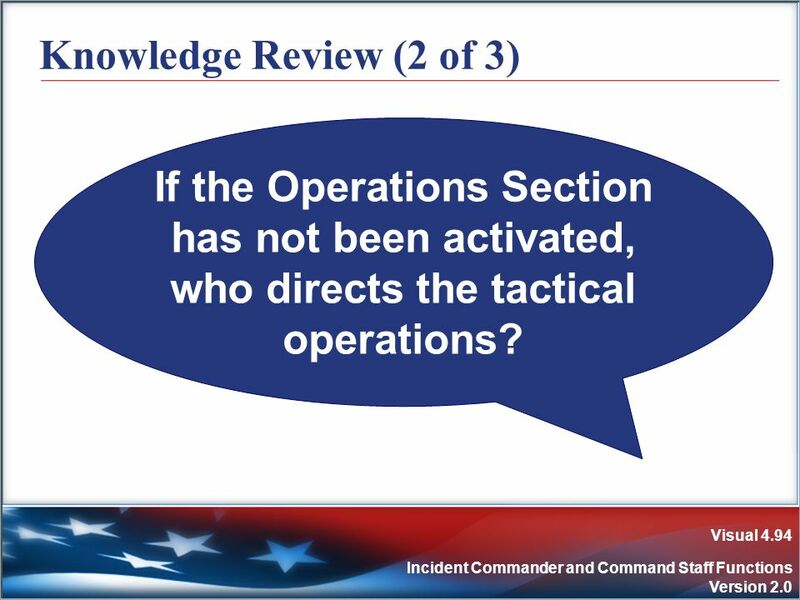 94 Knowledge Review (2 of 3) If the Operations Section has not been activated, who directs the tactical operations? 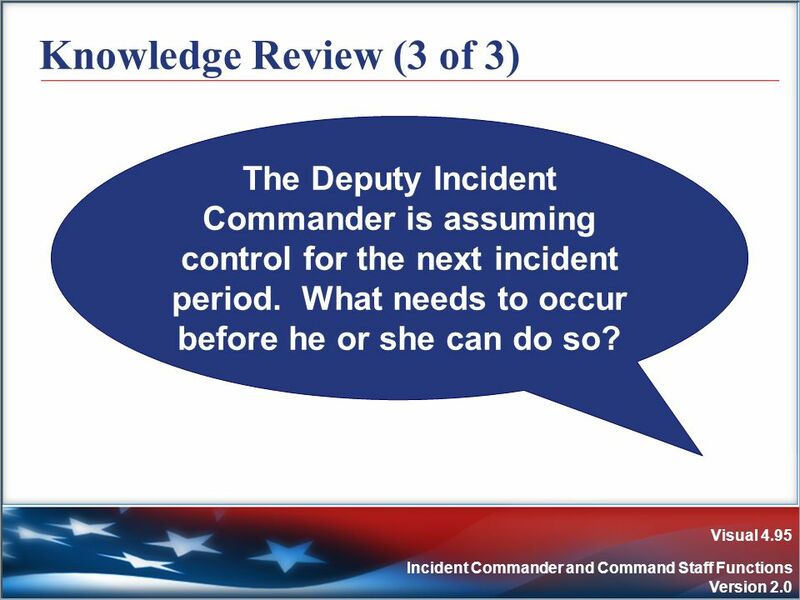 95 Knowledge Review (3 of 3) The Deputy Incident Commander is assuming control for the next incident period. What needs to occur before he or she can do so? 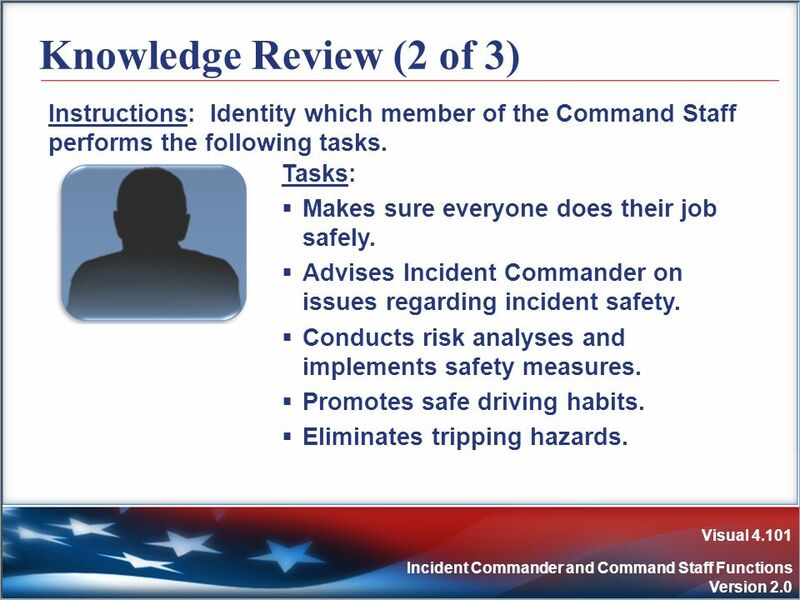 100 Knowledge Review (1 of 3) Instructions: Identity which member of the Command Staff performs the following tasks. 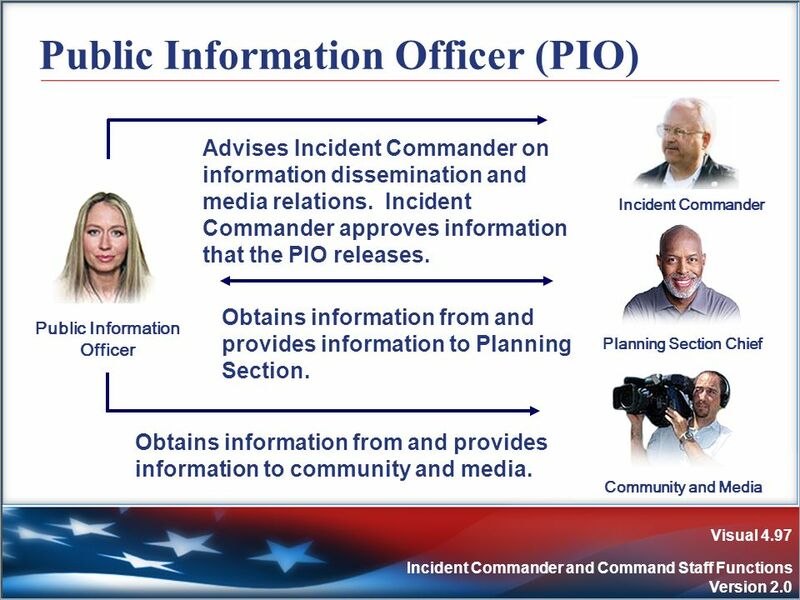 Tasks: Advises Incident Commander on issues related to information dissemination and media relations. Serves as primary contact for anyone who wants information about the incident. Serves external and internal audiences. Obtains information from Planning Section. 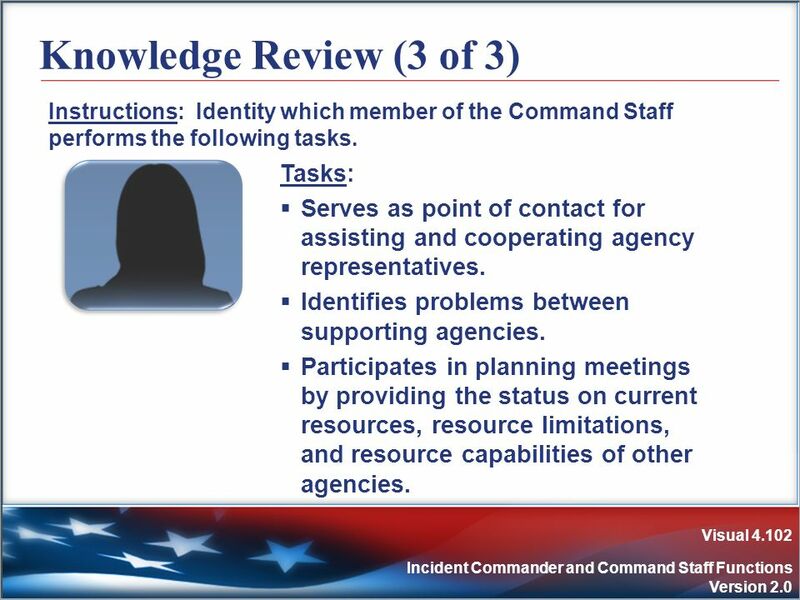 101 Knowledge Review (2 of 3) Instructions: Identity which member of the Command Staff performs the following tasks. Tasks: Makes sure everyone does their job safely. 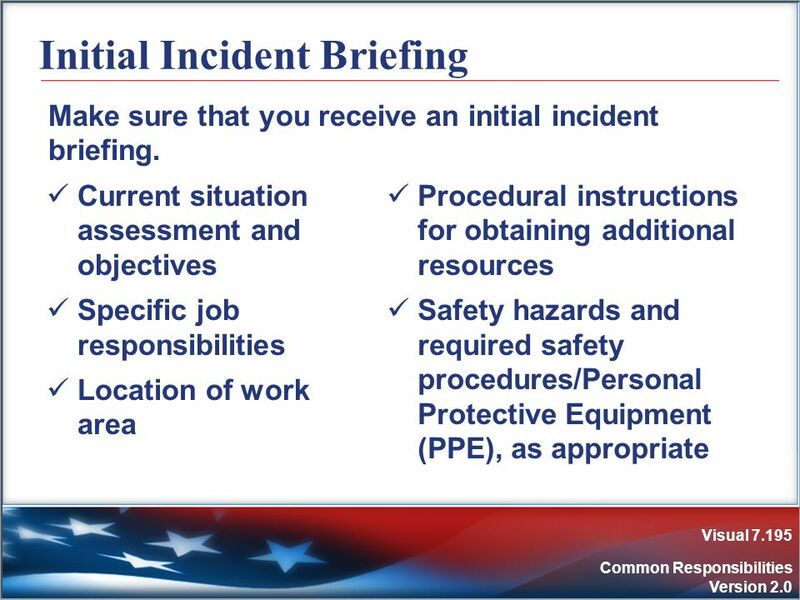 Advises Incident Commander on issues regarding incident safety. Conducts risk analyses and implements safety measures. Promotes safe driving habits. Eliminates tripping hazards. 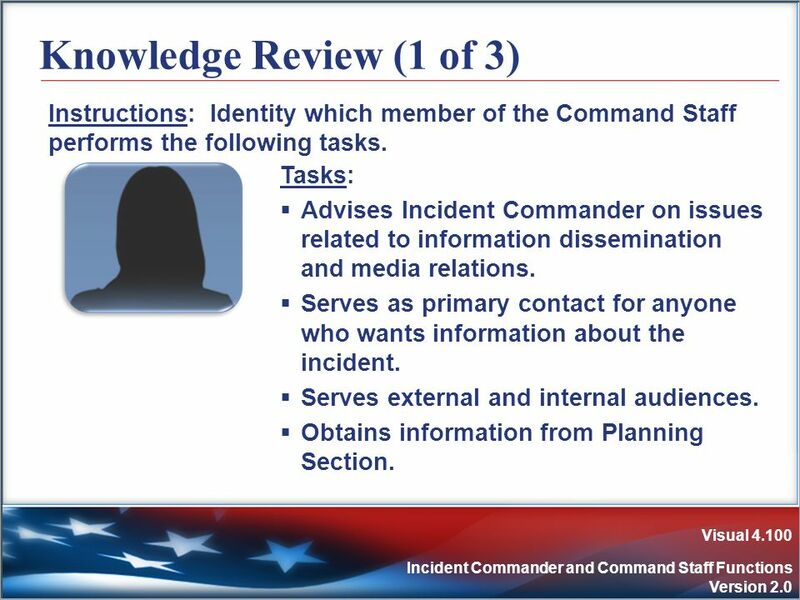 Instructions: Identity which member of the Command Staff performs the following tasks. 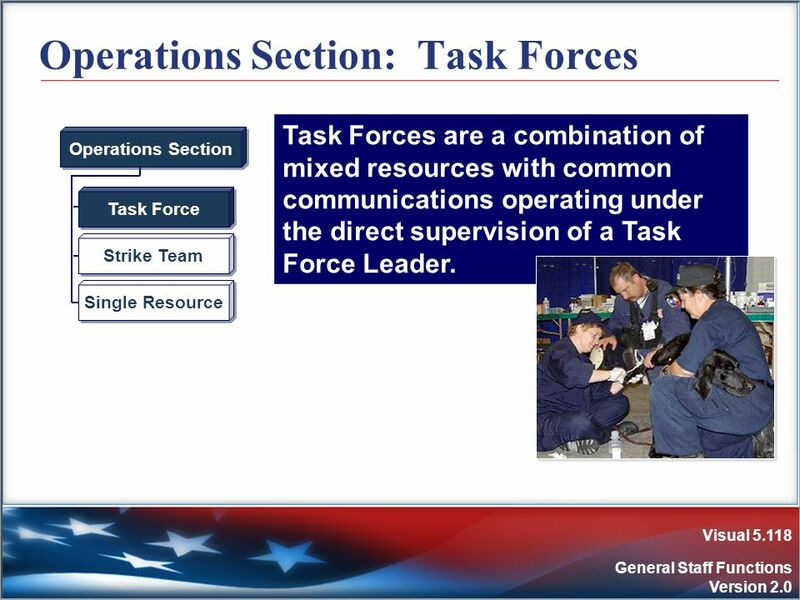 Tasks: Serves as point of contact for assisting and cooperating agency representatives. Identifies problems between supporting agencies. 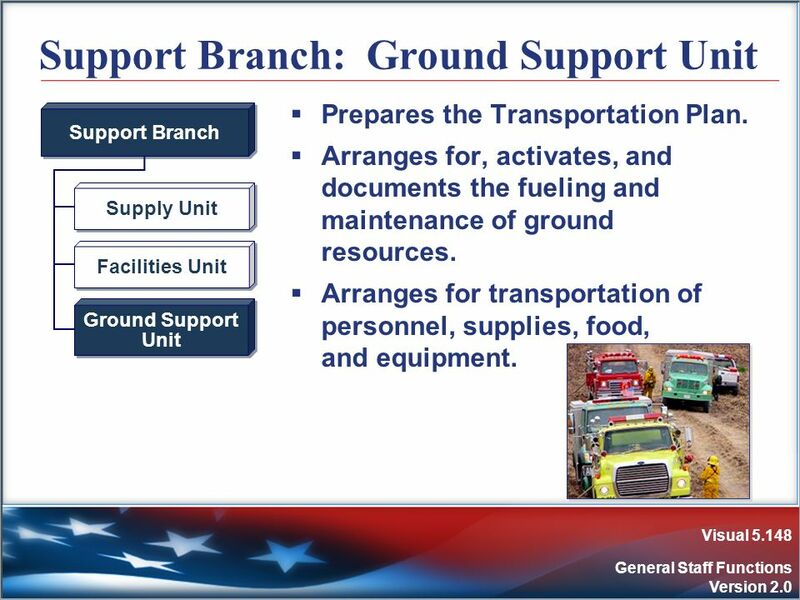 Participates in planning meetings by providing the status on current resources, resource limitations, and resource capabilities of other agencies. 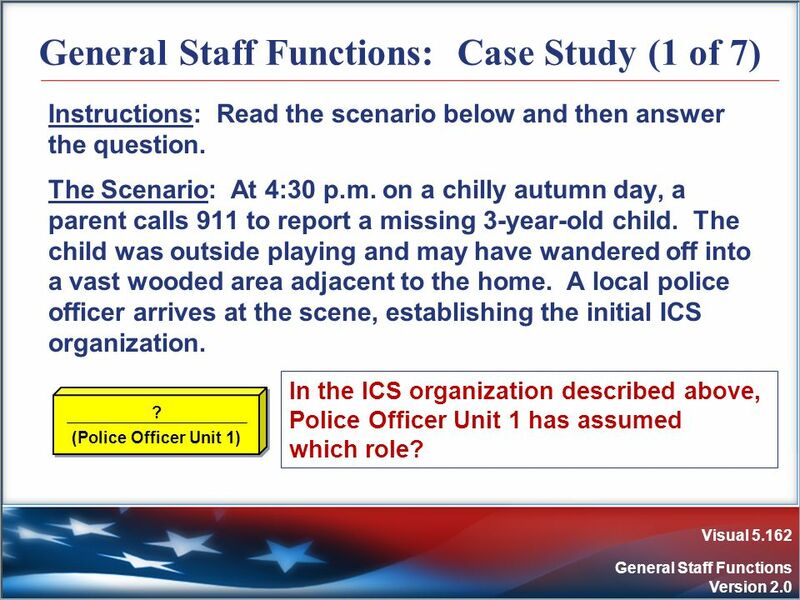 Instructions: Working as a team, review the scenario presented on the next visual. 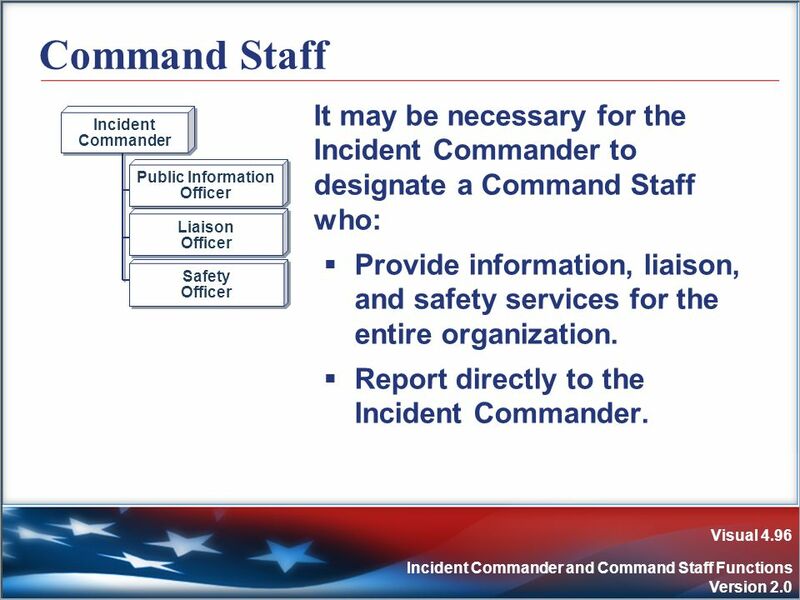 Identify which Command Staff positions would be assigned. 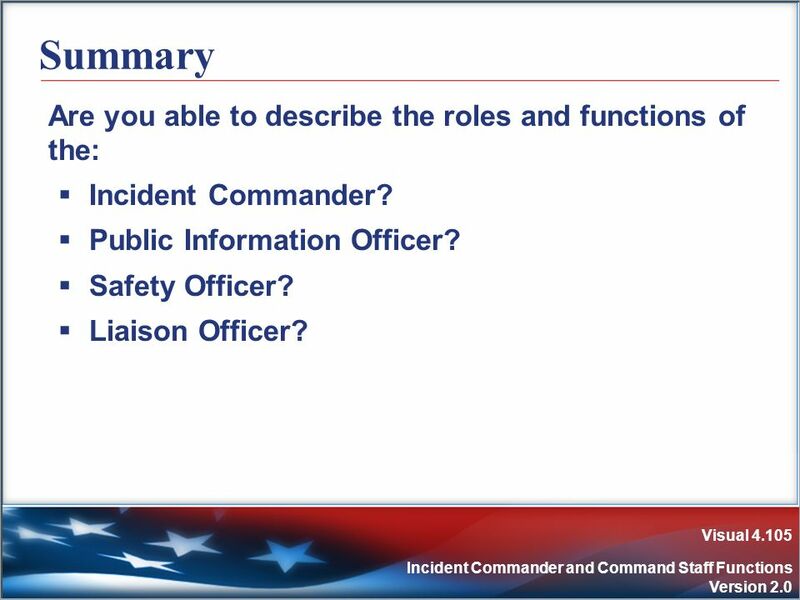 Next, if you were the Incident Commander, what specific activities would you delegate to each Command Staff member? Select a spokesperson. Be prepared to present in 10 minutes. Scenario: An unexpected flash flood has struck a small community. 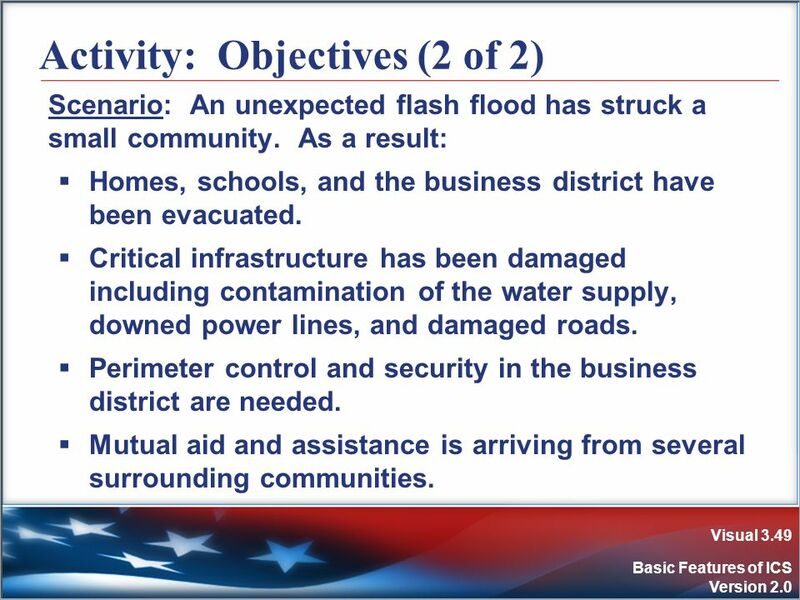 As a result: Homes, schools, and the business district are being evacuated. Critical infrastructure has been damaged including contamination of the water supply, downed power lines, and damaged roads. Perimeter control and security in the business district are needed. Mutual aid is arriving from several surrounding communities. Media representatives are arriving at the scene. 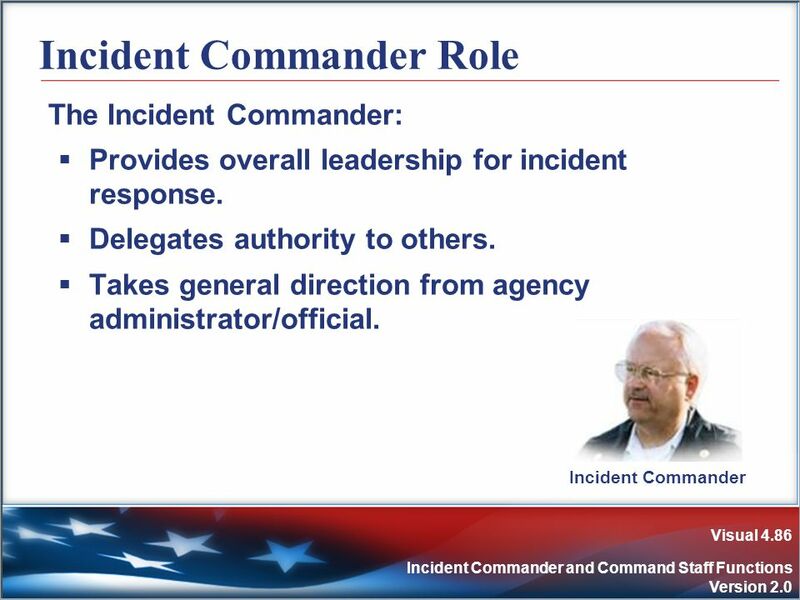 Incident Commander? 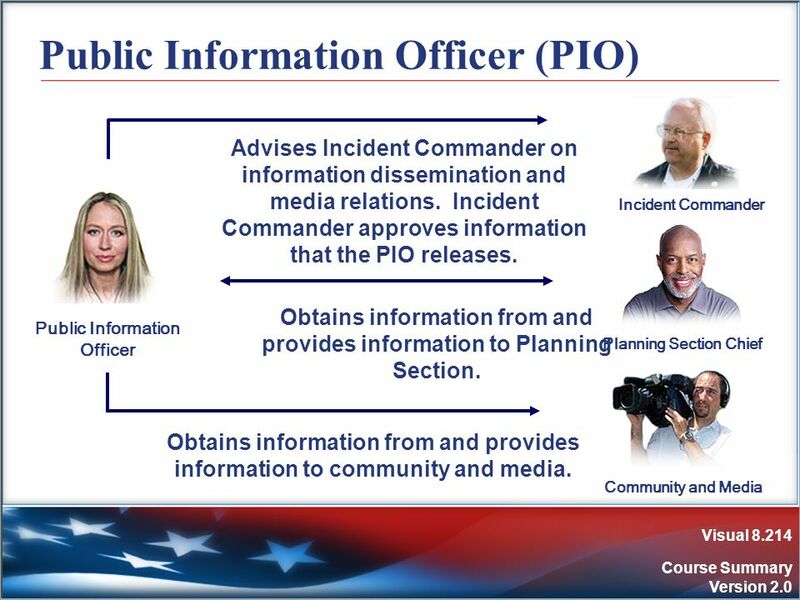 Public Information Officer? Safety Officer? Liaison Officer? 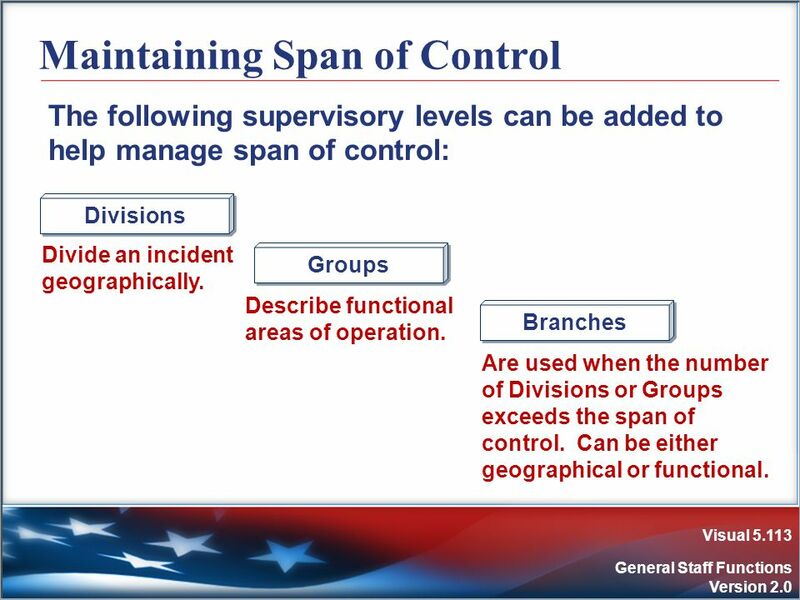 The following supervisory levels can be added to help manage span of control: Divisions Divide an incident geographically. 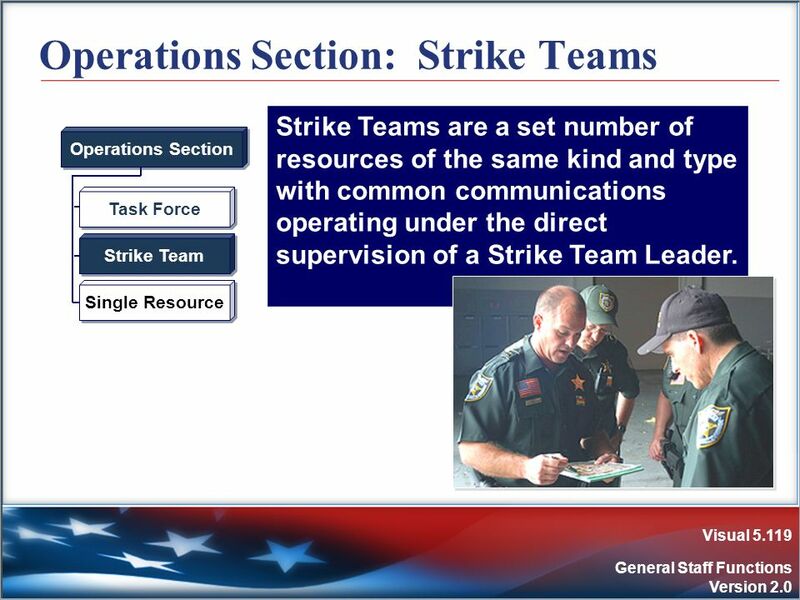 Groups Describe functional areas of operation. 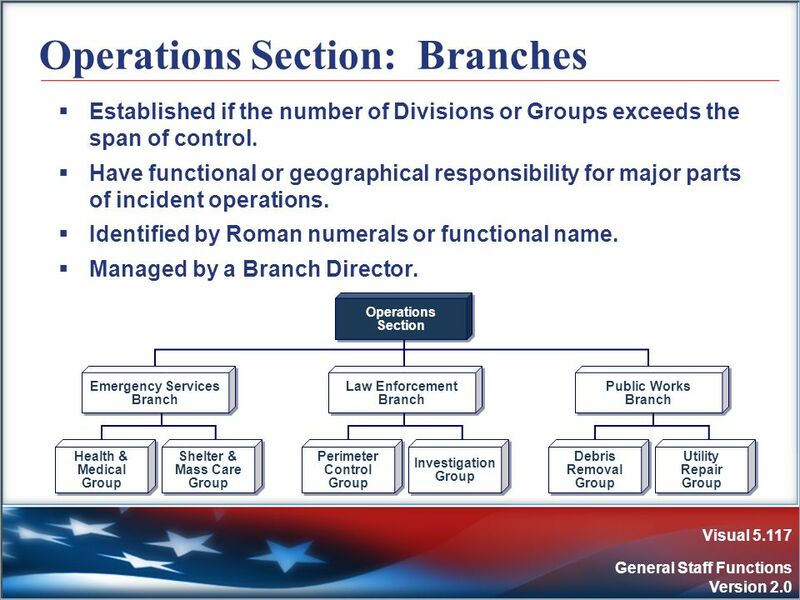 Branches Are used when the number of Divisions or Groups exceeds the span of control. Can be either geographical or functional. 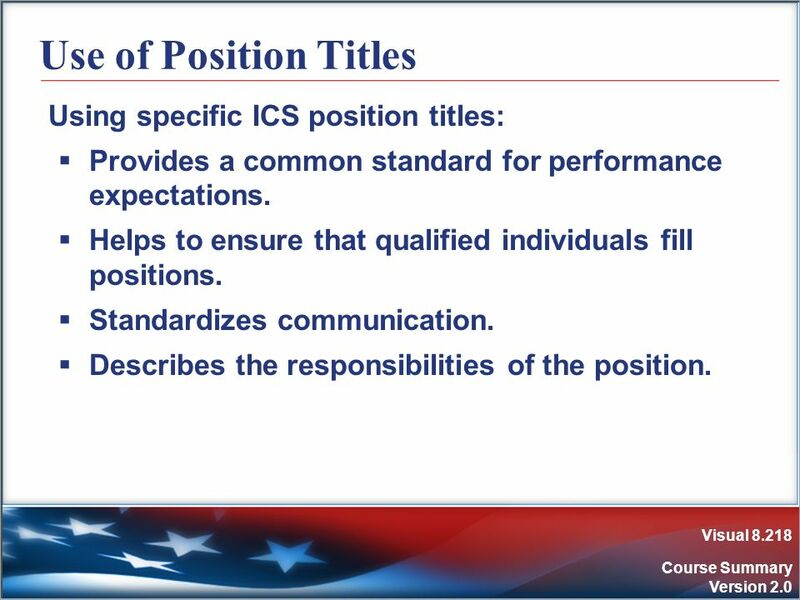 Provides a common standard for performance expectations. Helps to ensure that qualified individuals fill positions. 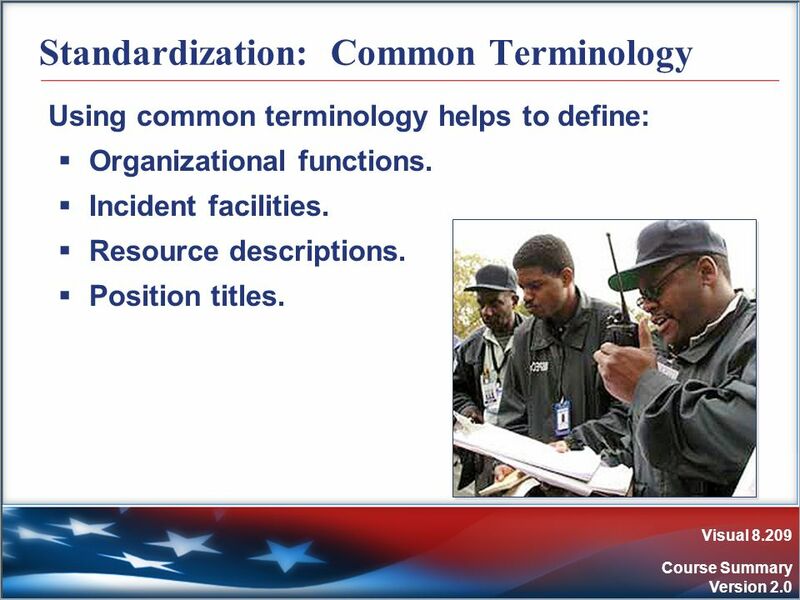 Standardizes communication. Describes the responsibilities of the position. 124 Knowledge Review (1 of 5) Two Supervisors have been dispatched with resources (personnel and equipment) to evacuate homes within the potential hazard zone. 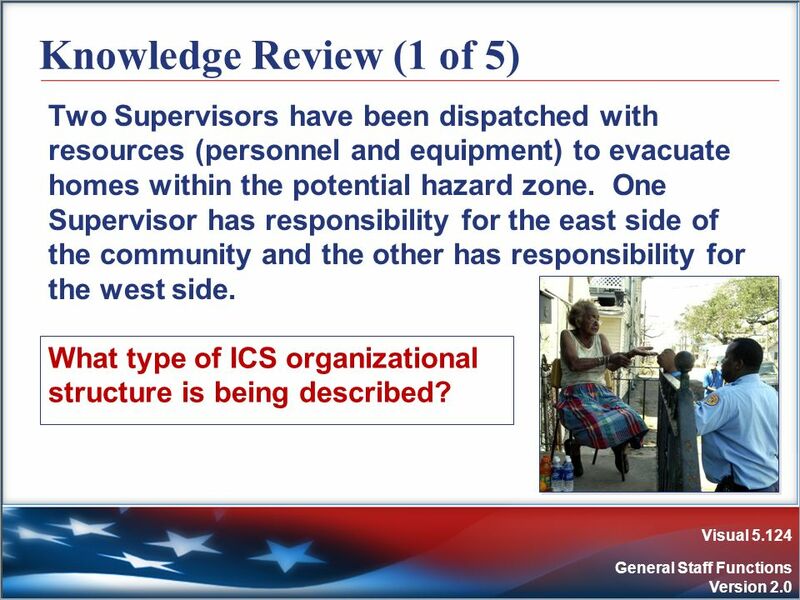 One Supervisor has responsibility for the east side of the community and the other has responsibility for the west side. 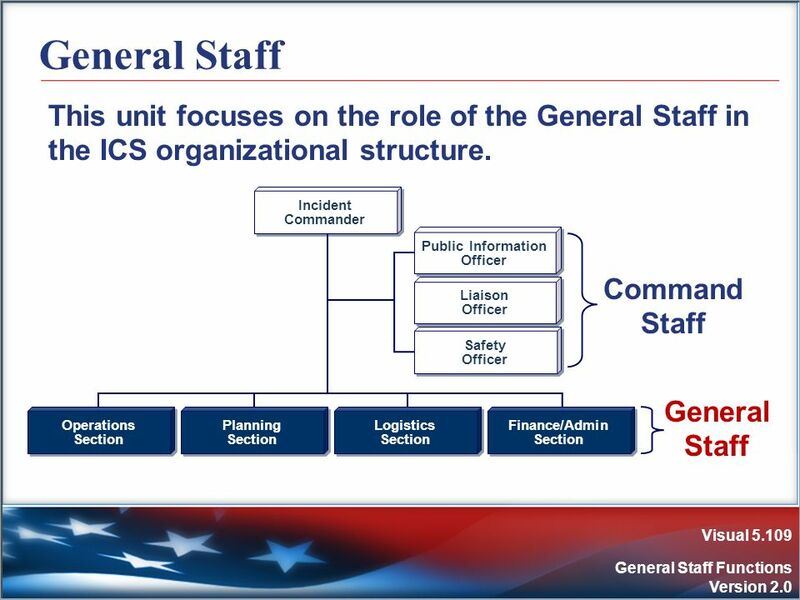 What type of ICS organizational structure is being described? 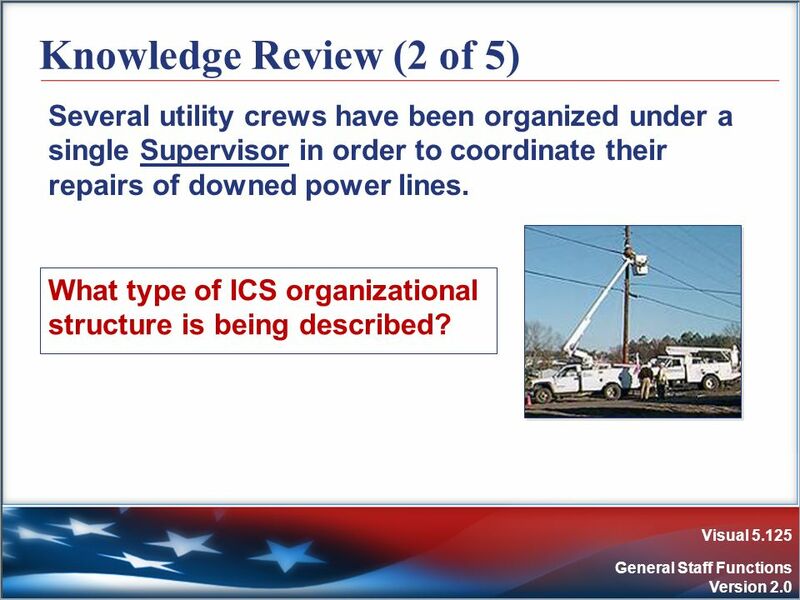 125 Knowledge Review (2 of 5) Several utility crews have been organized under a single Supervisor in order to coordinate their repairs of downed power lines. 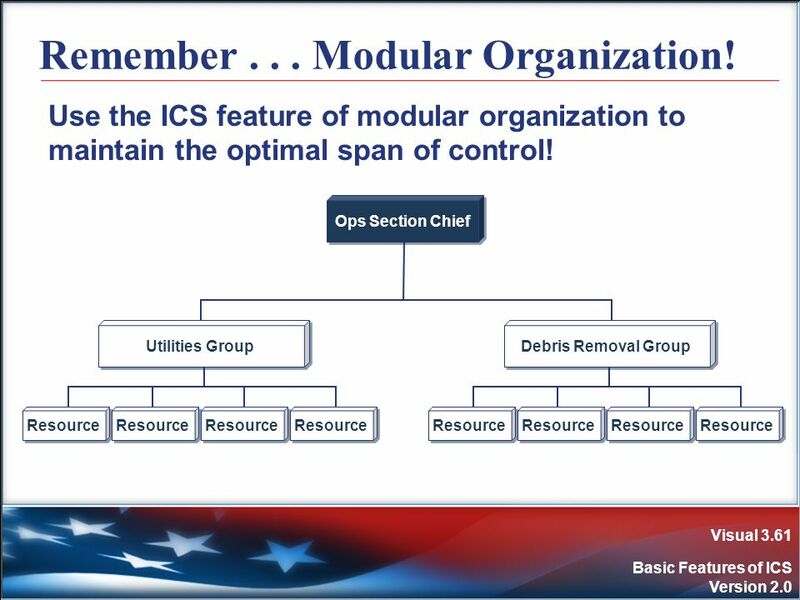 What type of ICS organizational structure is being described? 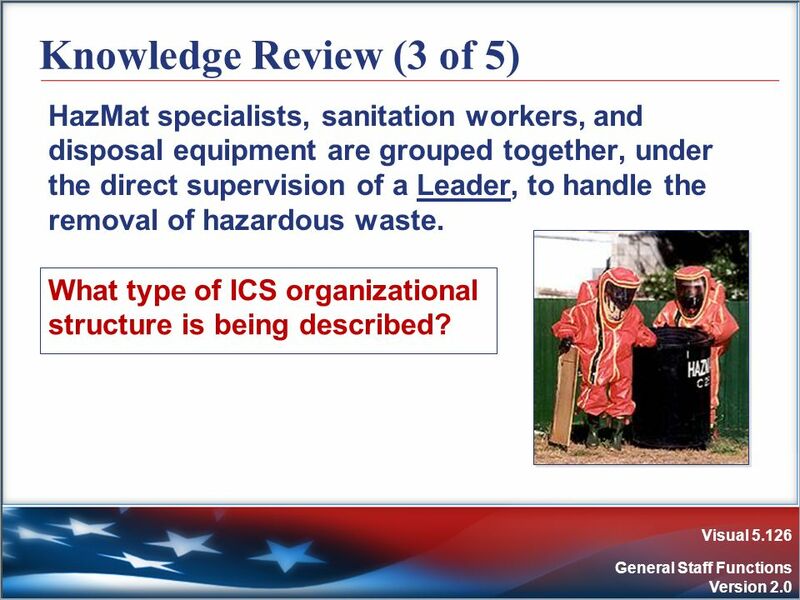 126 Knowledge Review (3 of 5) HazMat specialists, sanitation workers, and disposal equipment are grouped together, under the direct supervision of a Leader, to handle the removal of hazardous waste. 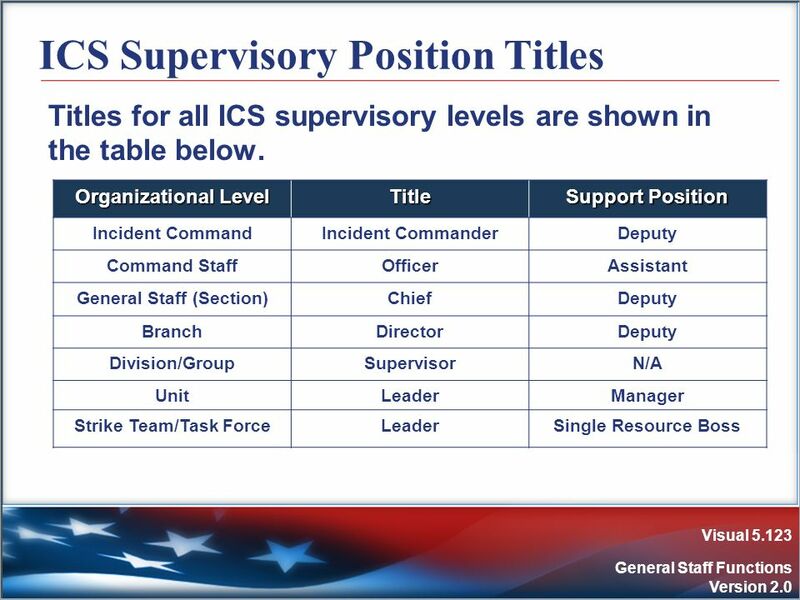 What type of ICS organizational structure is being described? 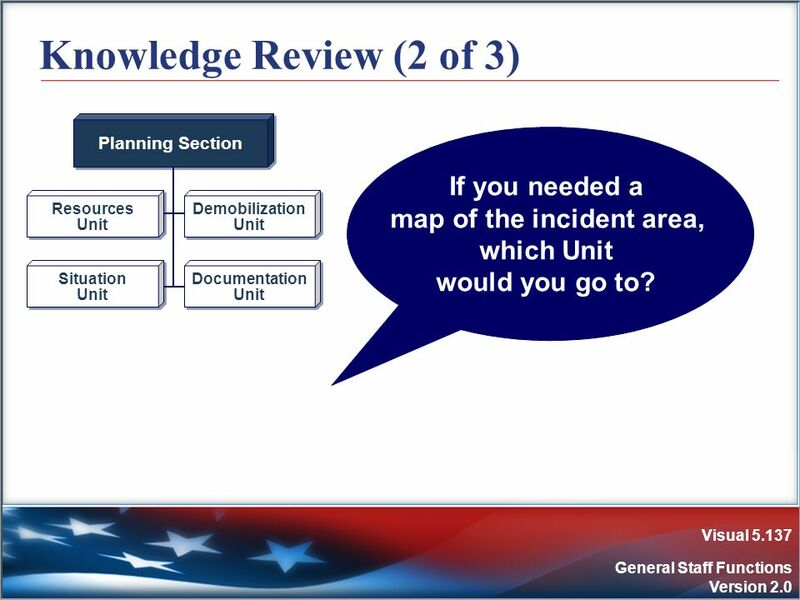 127 Knowledge Review (4 of 5) As incident objectives and resources expand, the Operations Section Chief begins organizing resources into functional areas that are managed by a Supervisor. 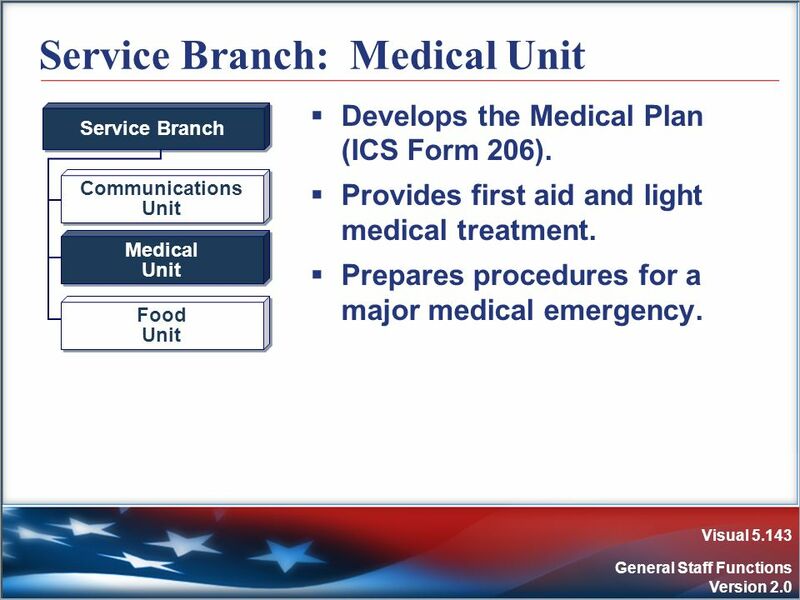 Operations Section Medical (EMS) ? HazMat ? 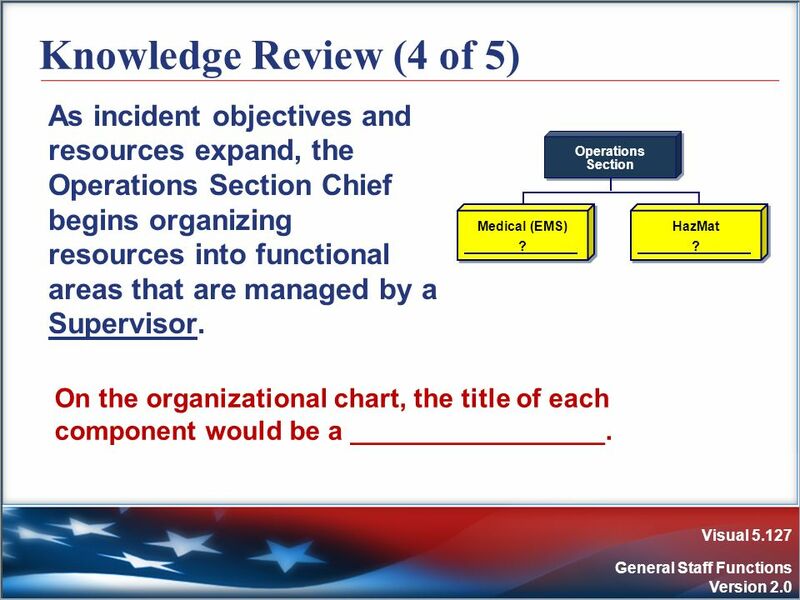 On the organizational chart, the title of each component would be a _________________. 128 Knowledge Review (5 of 5) As the operation expands even further, the Operations Section Chief appoints a Director to manage the Groups. 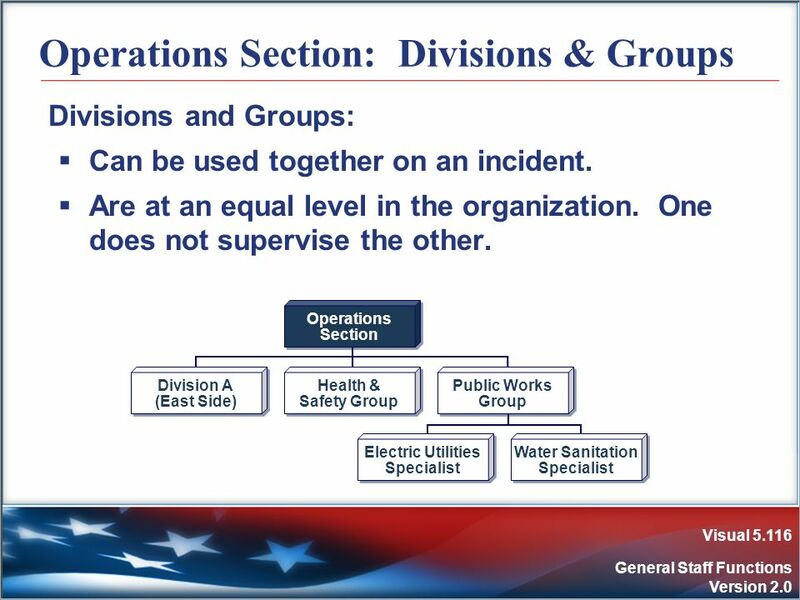 Operations Section Emergency Services ? 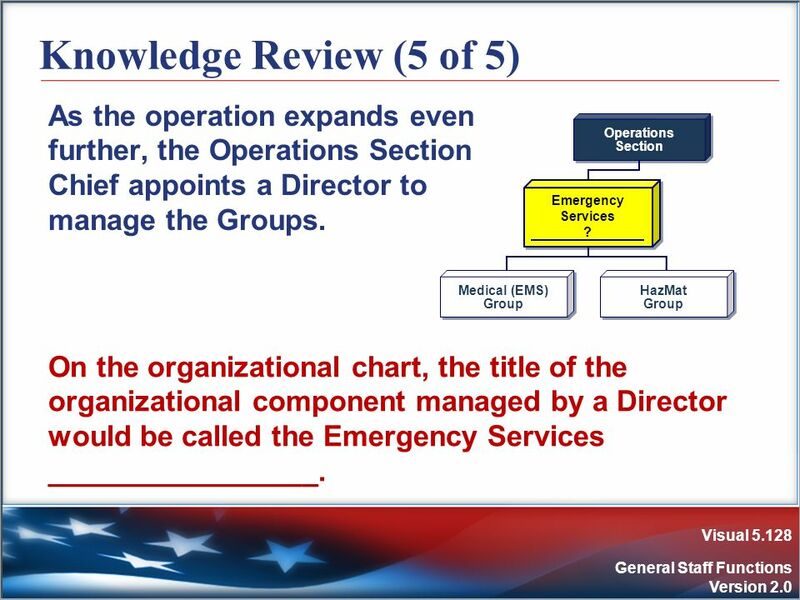 Medical (EMS) Group HazMat Group On the organizational chart, the title of the organizational component managed by a Director would be called the Emergency Services _________________. 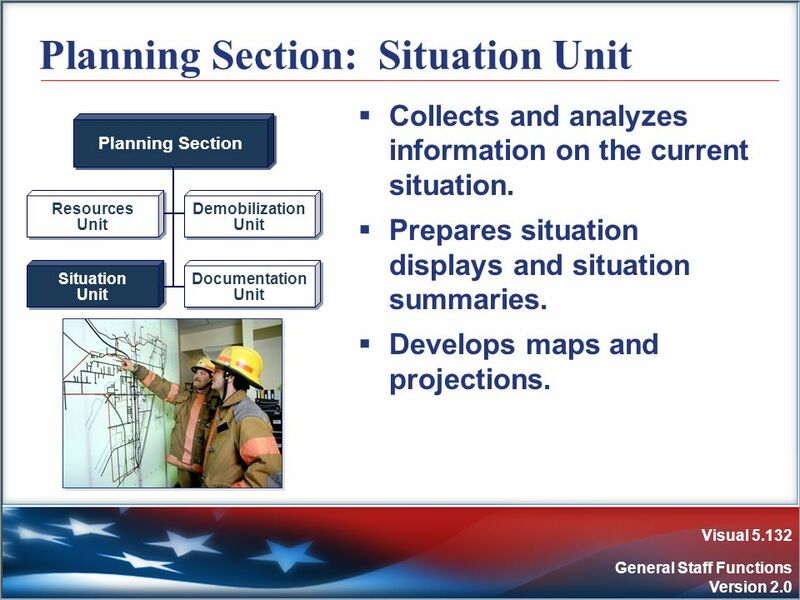 130 Planning Section Maintains resource status. 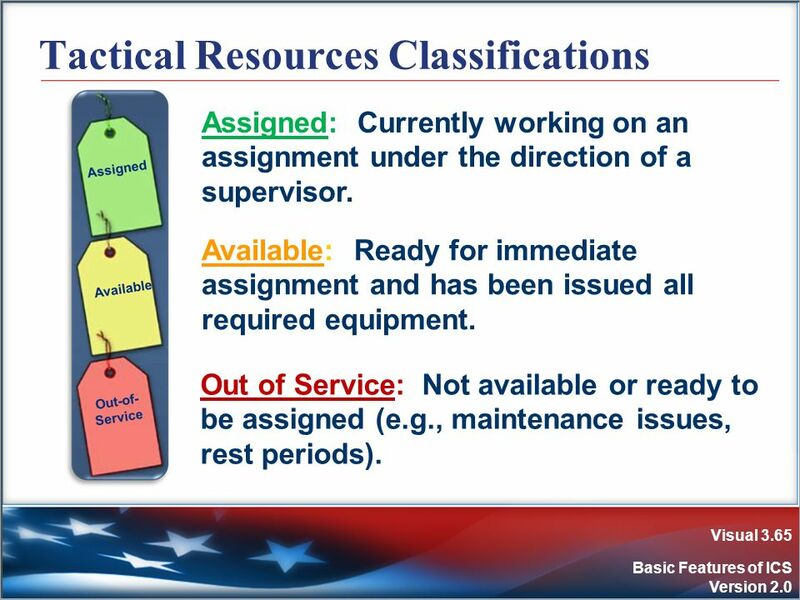 Maintains and displays situation status. 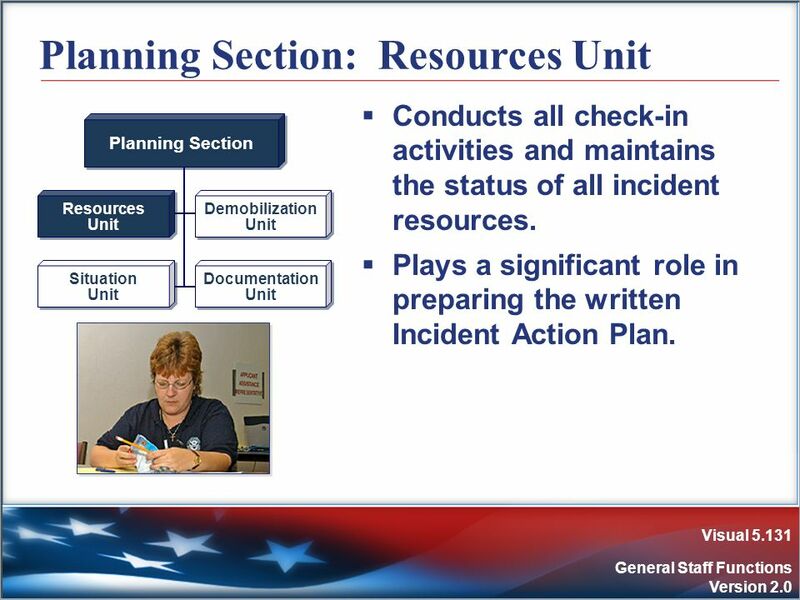 Prepares the Incident Action Plan. Develops alternative strategies. 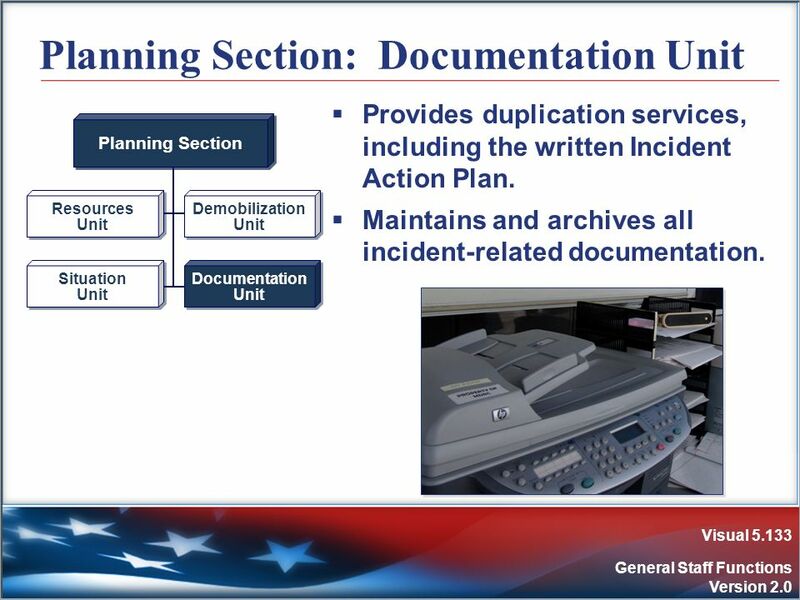 Provides documentation services. 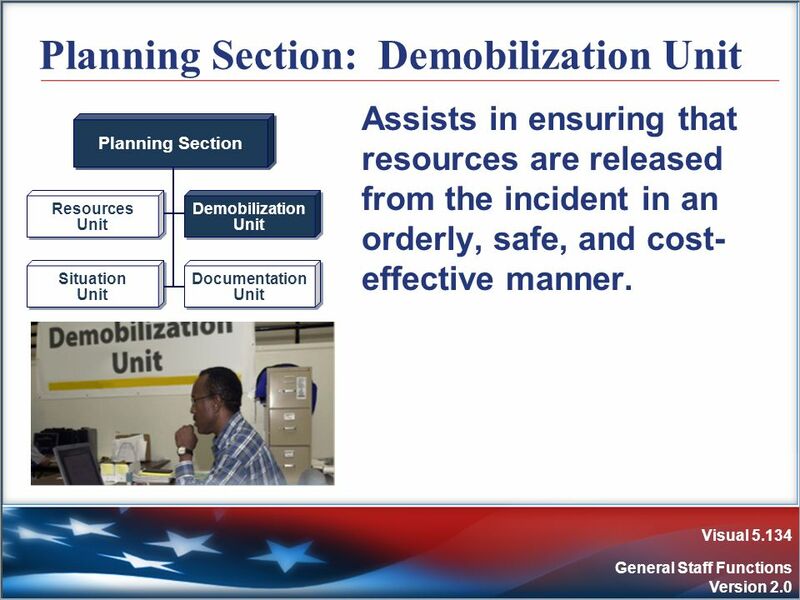 Prepares the Demobilization Plan. 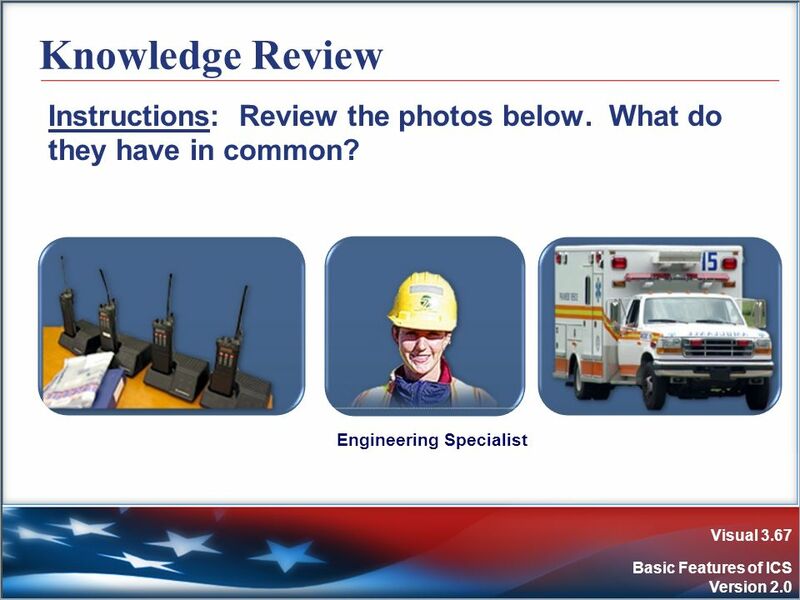 Provides a primary location for Technical Specialists assigned to an incident. 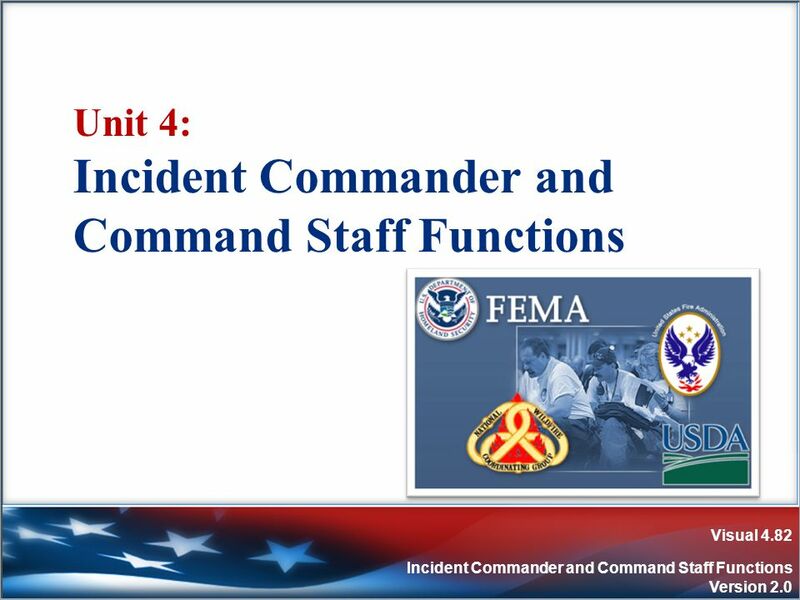 Provide special expertise useful in incident management and response. 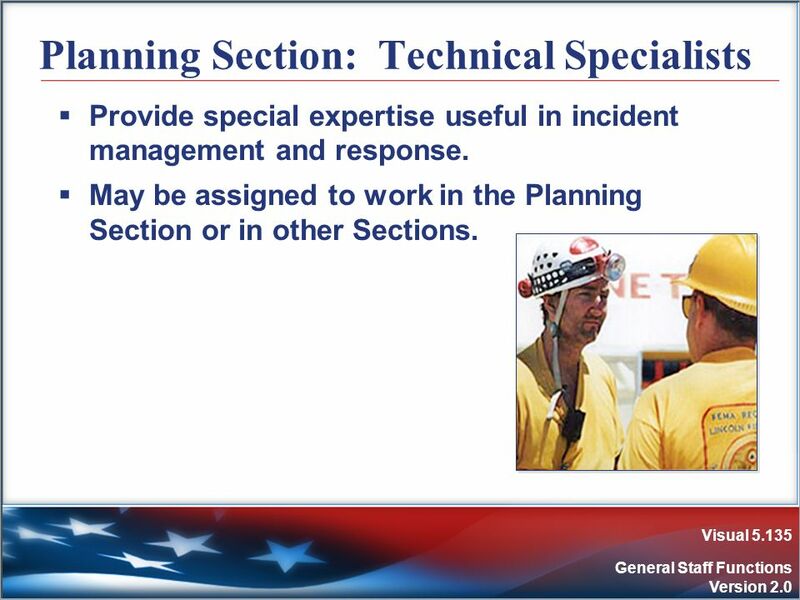 May be assigned to work in the Planning Section or in other Sections. 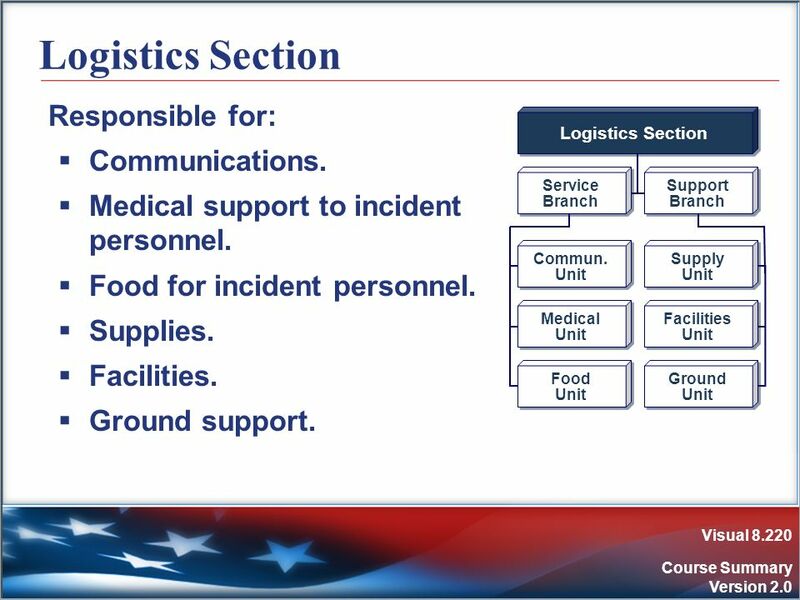 139 Logistics Section Responsible for: Communications. 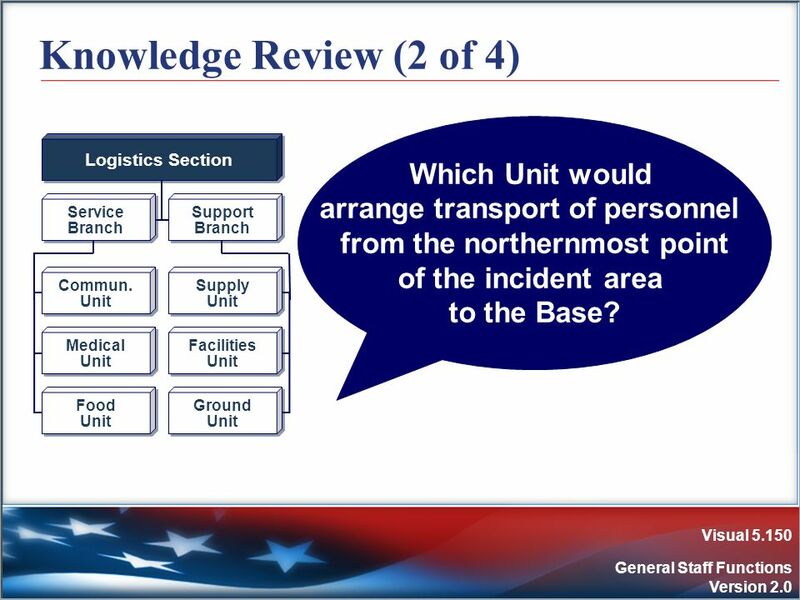 150 of the incident area to the Base? 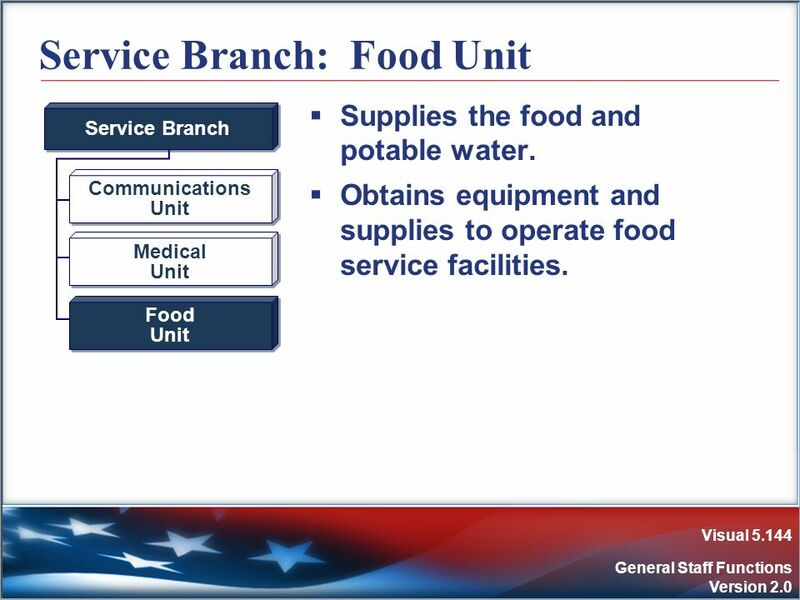 160 Finance/Admin Section which Unit would you go to? The Scenario Continues: A Police Chief arrives at the scene, along with news crews and numerous volunteers. 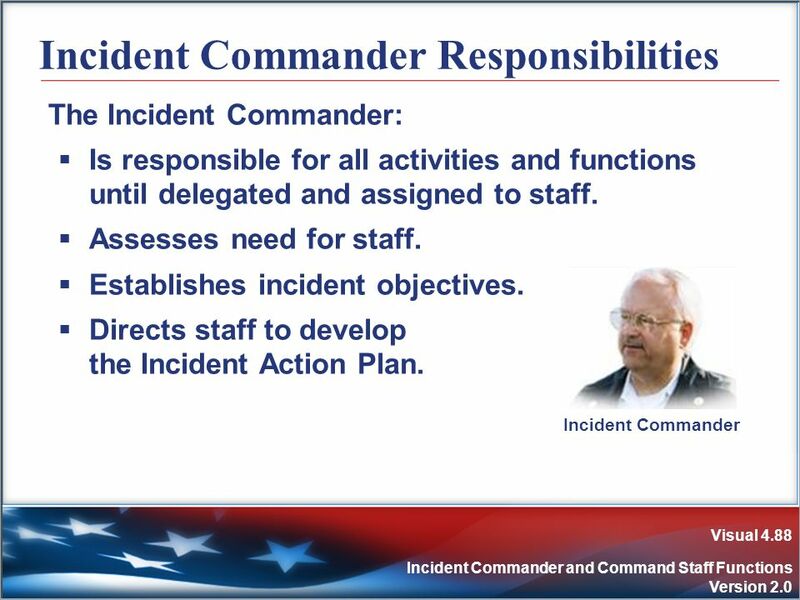 What must happen before the Chief assumes the Incident Commander role? 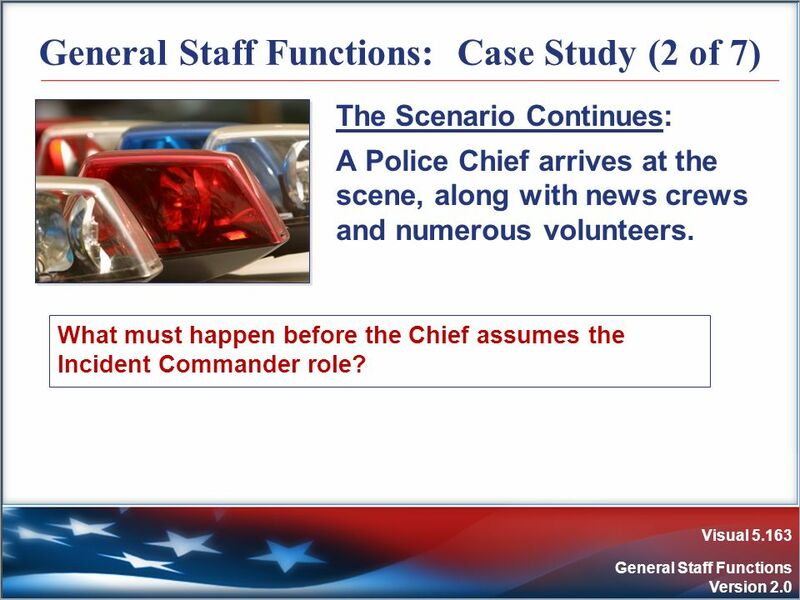 The Scenario Continues: A transfer of command briefing occurs and the Chief assumes the Incident Commander role. All Command Staff positions are filled. 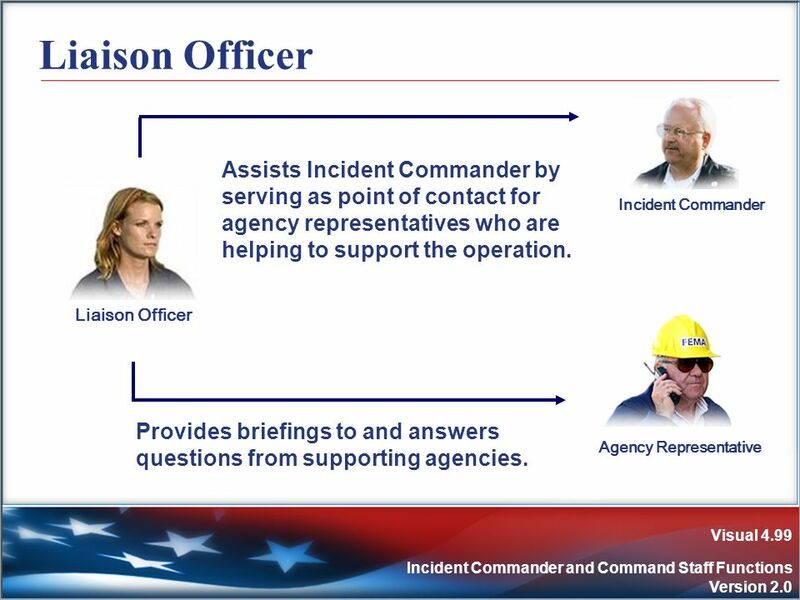 Incident Commander ? 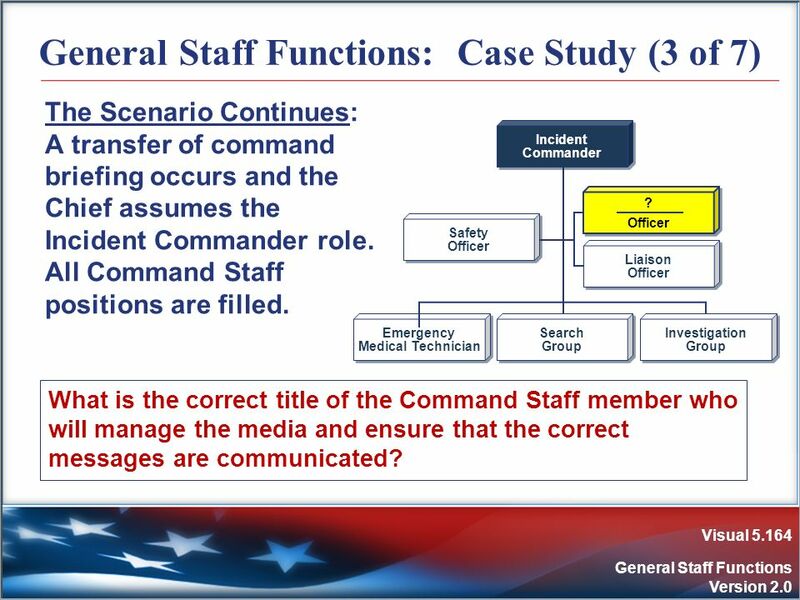 Officer Safety Liaison Search Group Investigation Emergency Medical Technician What is the correct title of the Command Staff member who will manage the media and ensure that the correct messages are communicated? 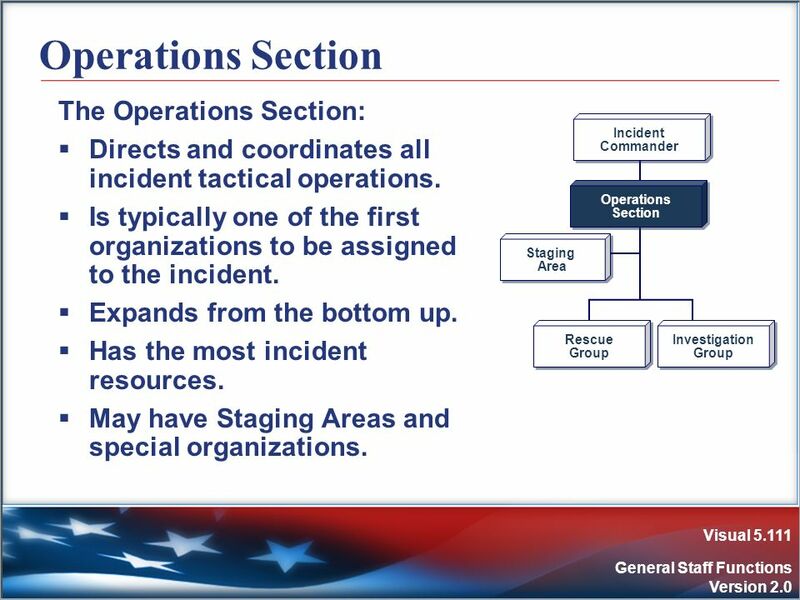 The Scenario Continues: The Incident Commander establishes an Operations Section. Within the Search Group, four canine search teams are assigned. The teams have identical resources. The teams are using common communications and are operating under the direct supervision of a Leader. 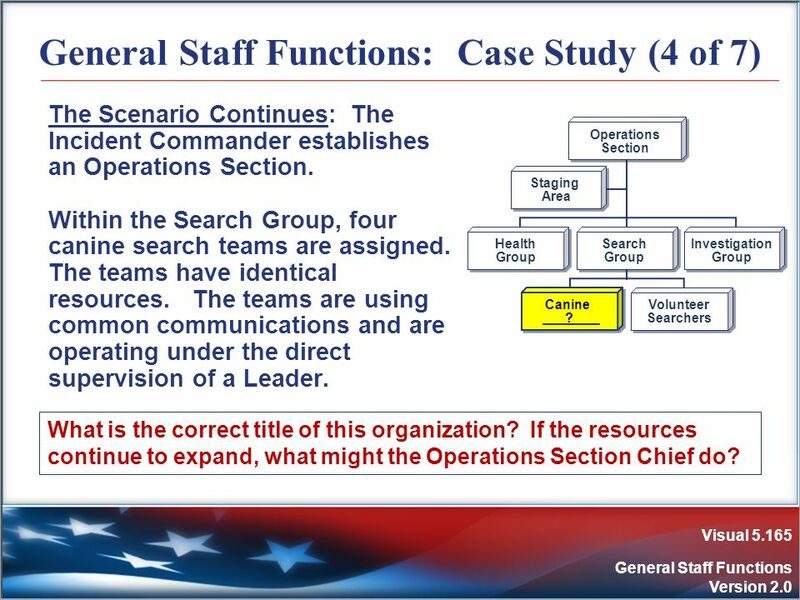 Staging Area Operations Section Search Group Health Investigation Canine ? Volunteer Searchers What is the correct title of this organization? 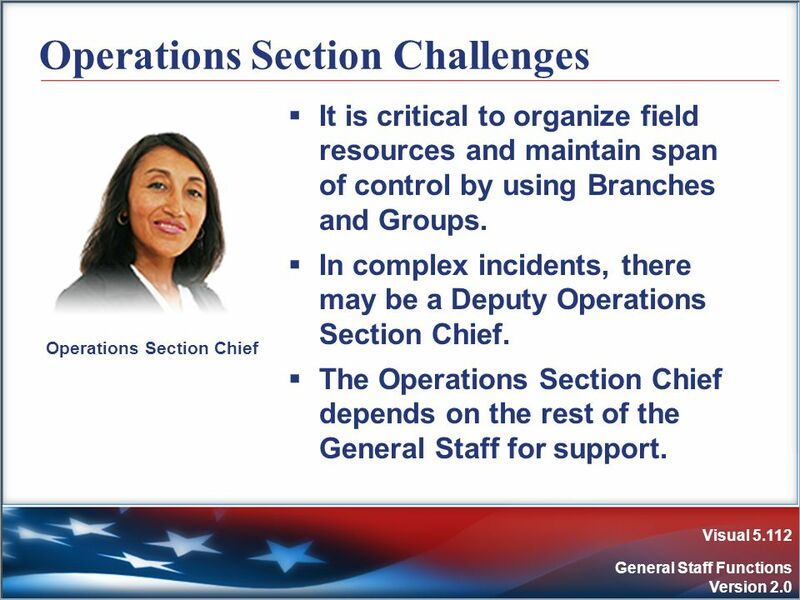 If the resources continue to expand, what might the Operations Section Chief do? 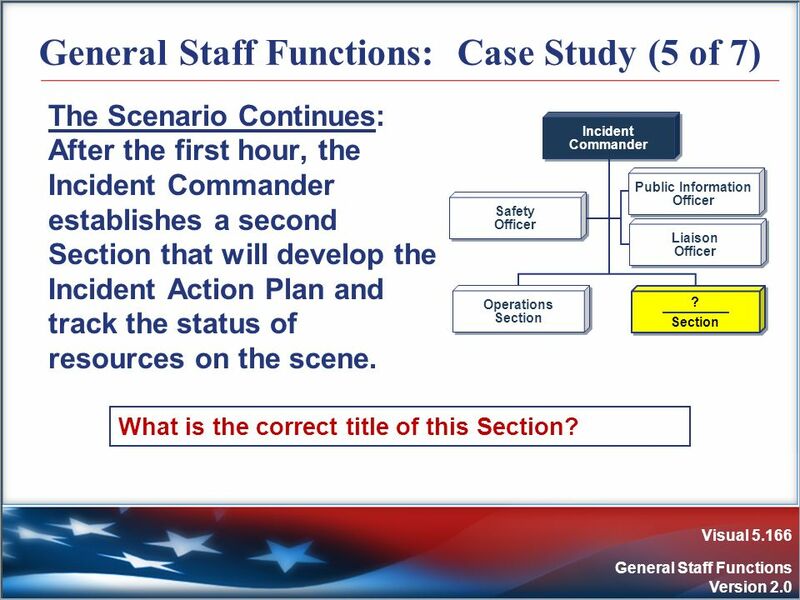 The Scenario Continues: After the first hour, the Incident Commander establishes a second Section that will develop the Incident Action Plan and track the status of resources on the scene. 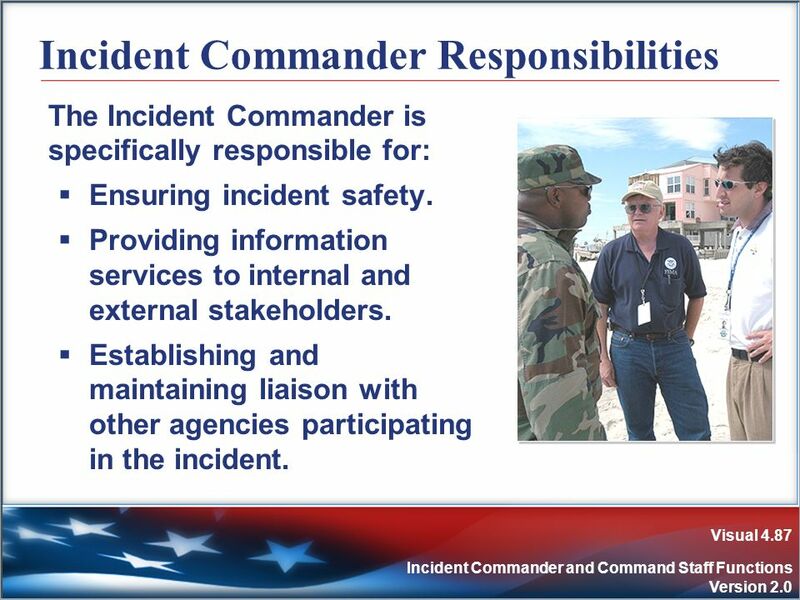 Incident Commander ? 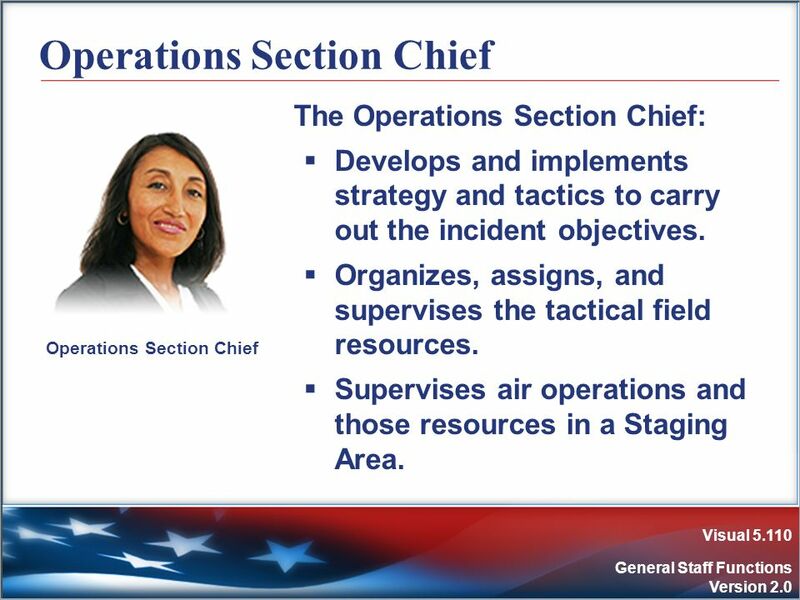 Section Safety Officer Liaison Public Information Operations What is the correct title of this Section? 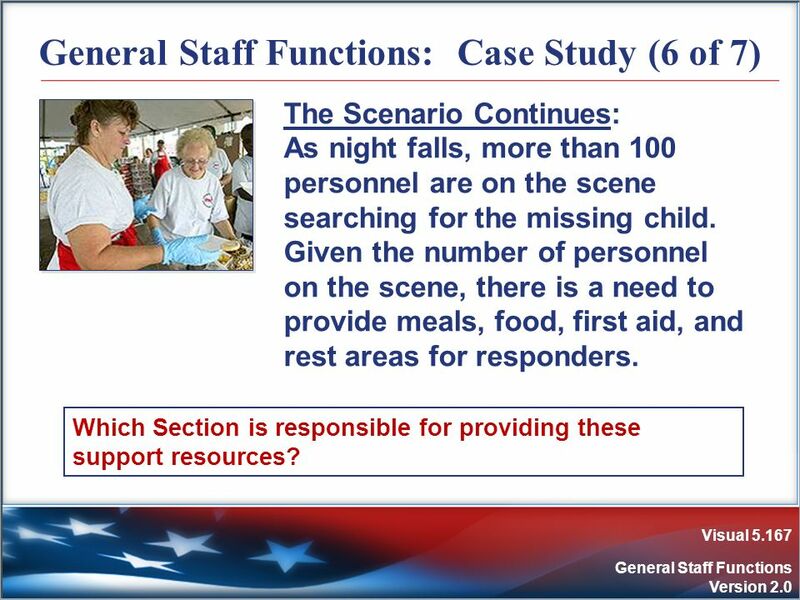 The Scenario Continues: As night falls, more than 100 personnel are on the scene searching for the missing child. Given the number of personnel on the scene, there is a need to provide meals, food, first aid, and rest areas for responders. 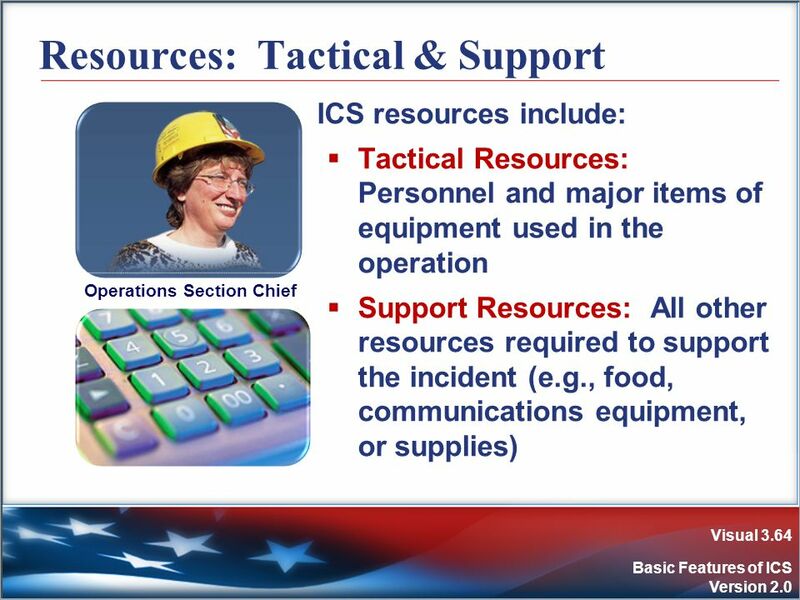 Which Section is responsible for providing these support resources? 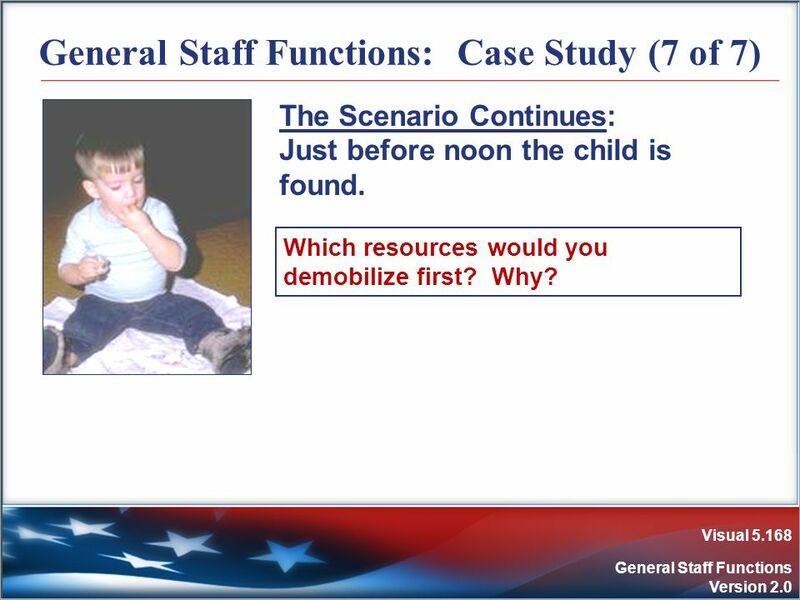 The Scenario Continues: Just before noon the child is found. 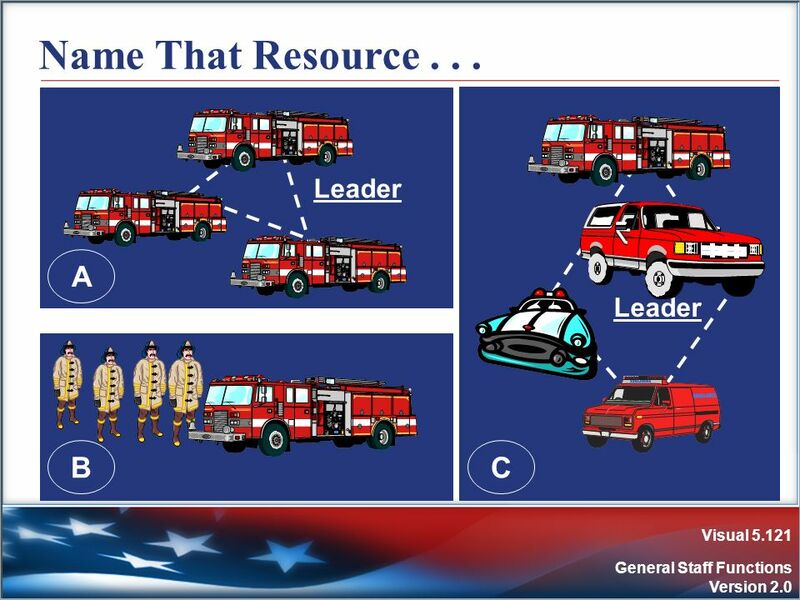 Which resources would you demobilize first? Why? 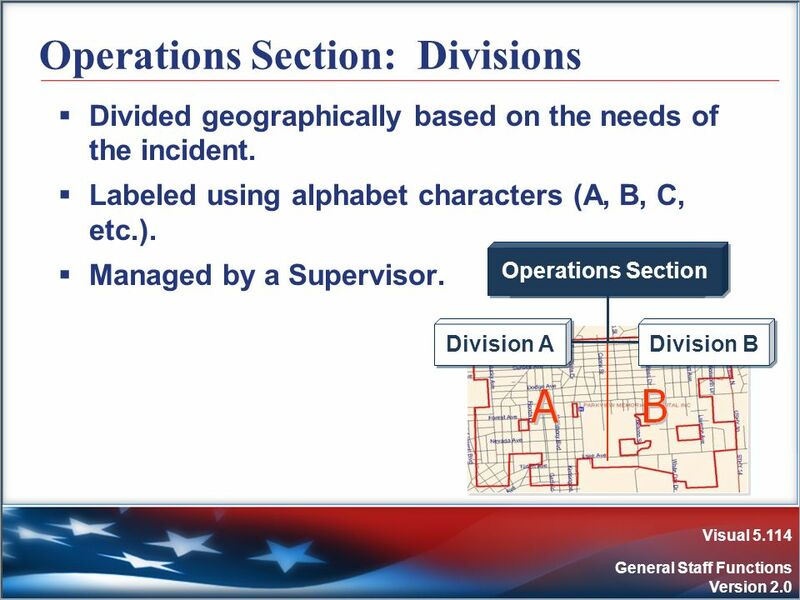 Operations Section? 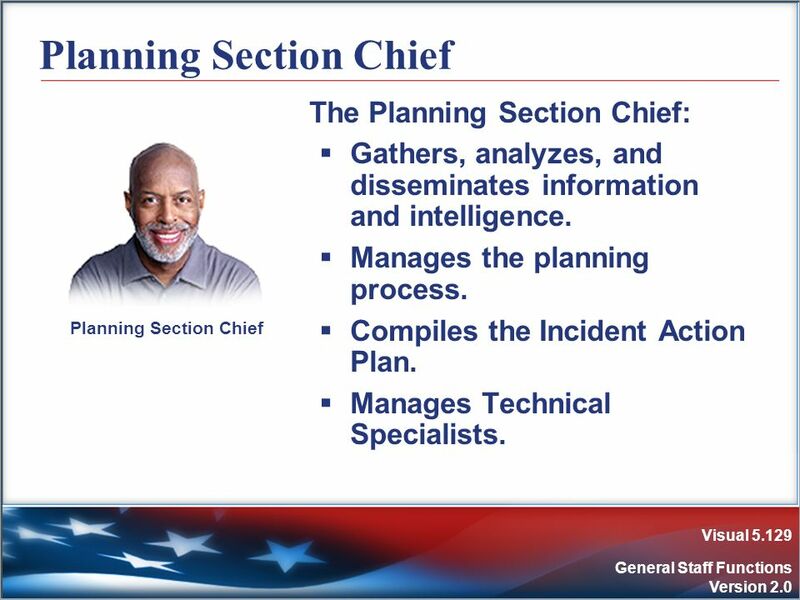 Planning Section? 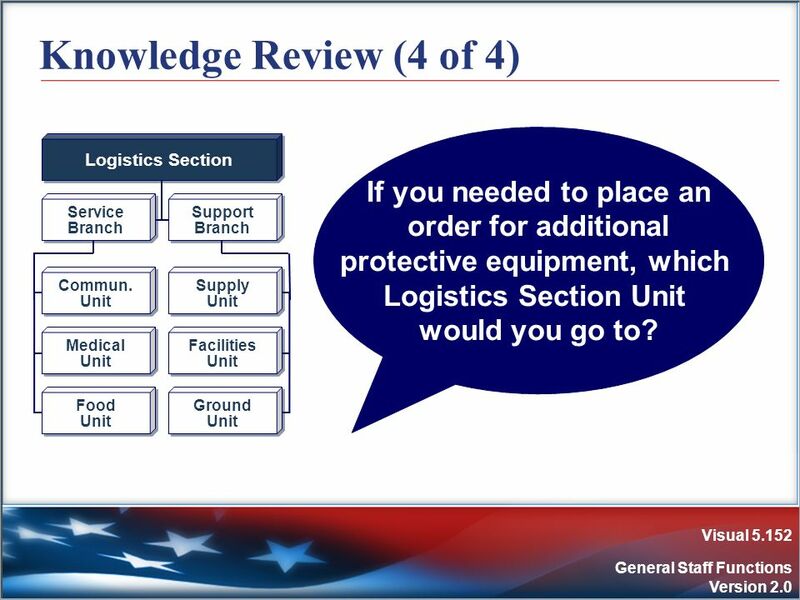 Logistics Section? 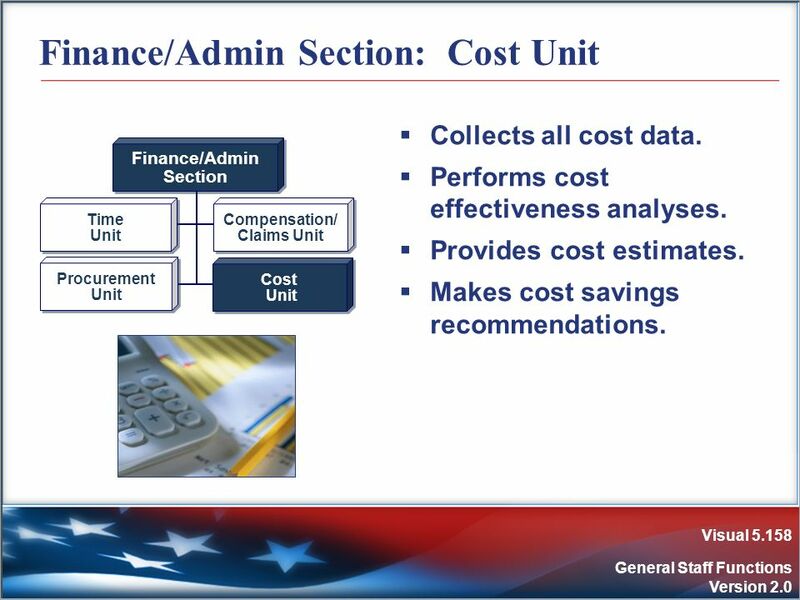 Finance/Administration Section? 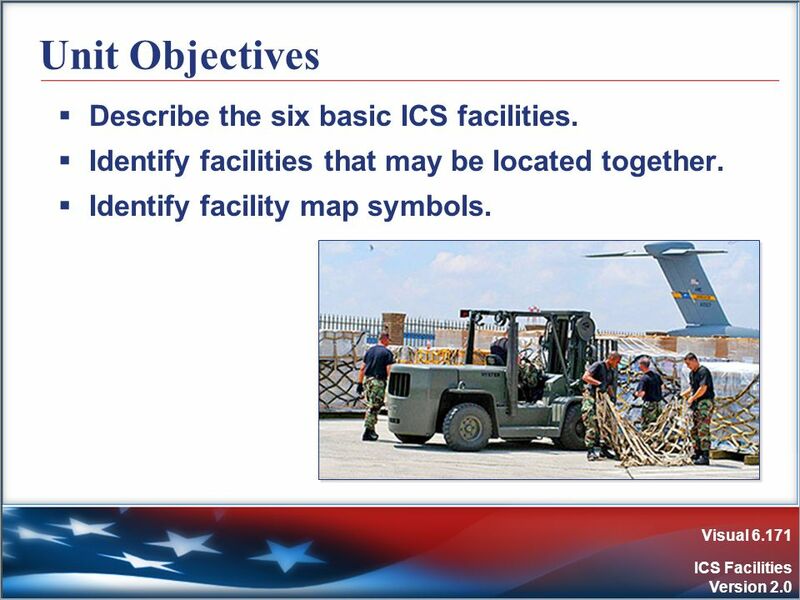 171 Unit Objectives Describe the six basic ICS facilities. Identify facilities that may be located together. Identify facility map symbols. 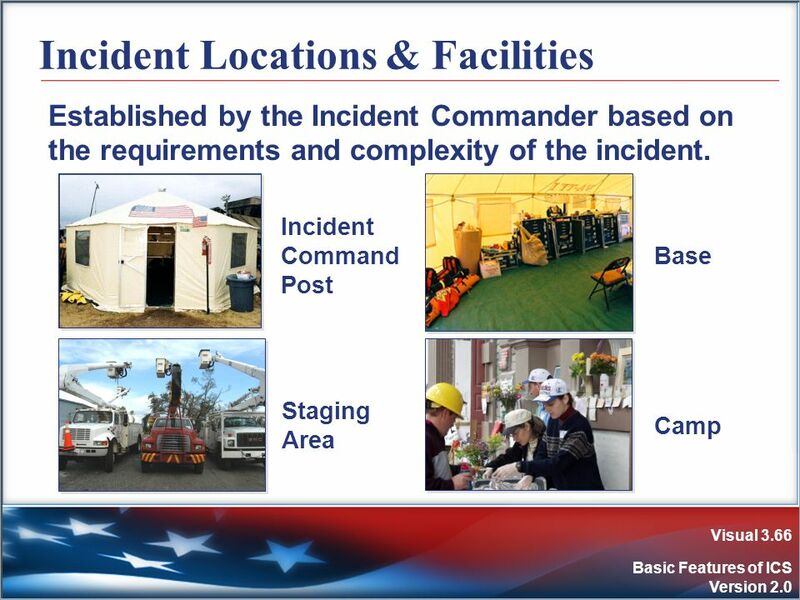 Incident facilities are: Established by the Incident Commander depending on the requirements and complexity of the incident or event. Activated only when needed. 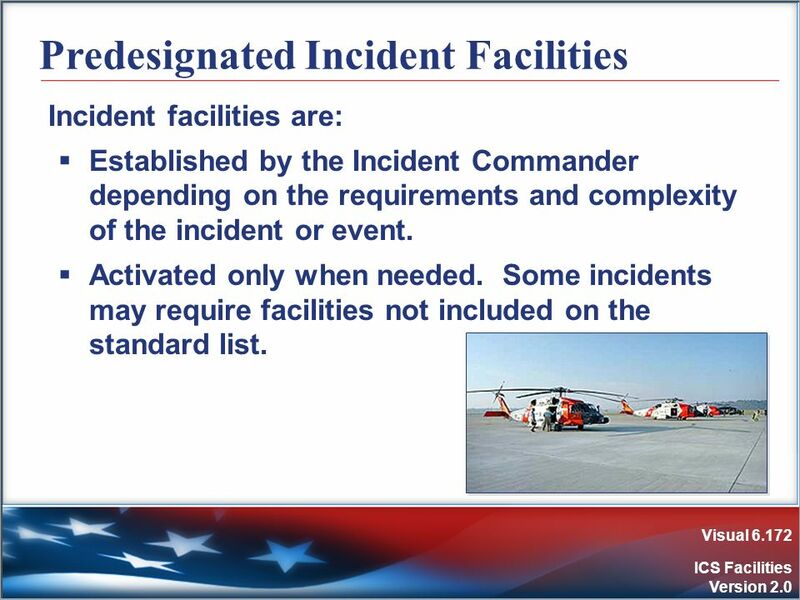 Some incidents may require facilities not included on the standard list. 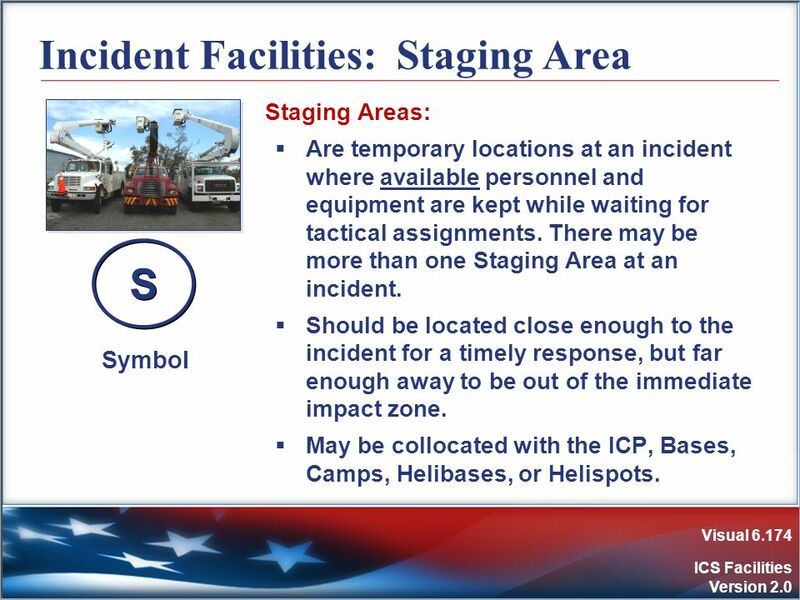 178 H-3 A Staging Area is where incident personnel await tactical assignment. 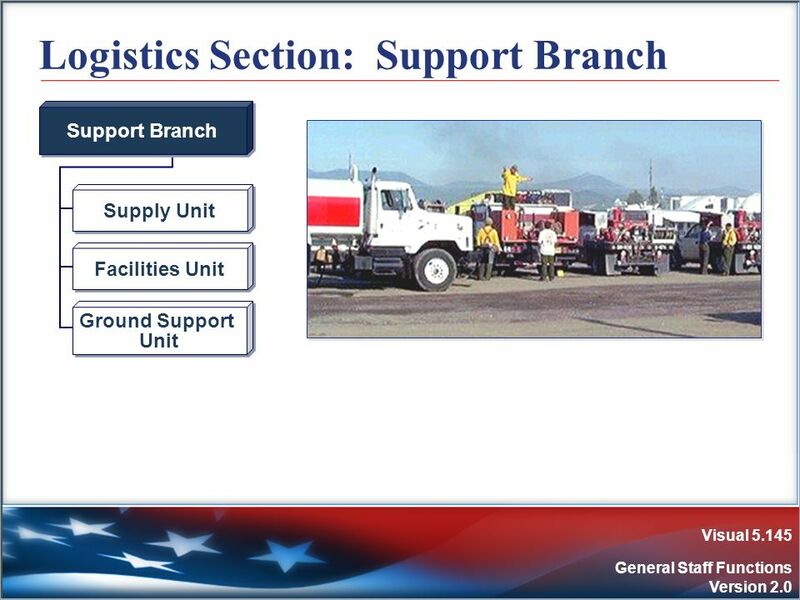 The Base is the location where primary logistics functions are coordinated. 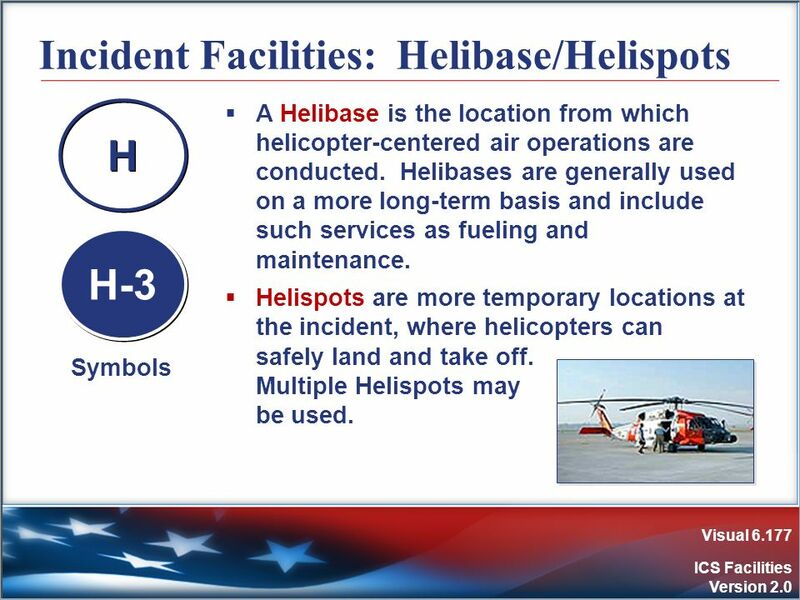 A helibase is where parking, fueling, maintenance, and loading of helicopters occur. 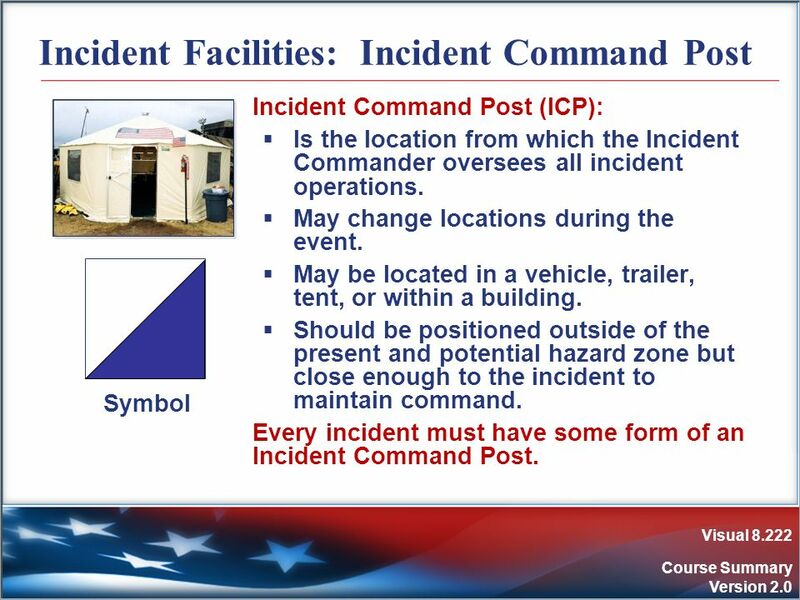 The Incident Command Post is the location at which primary command functions are executed. Usually located with the incident Base. 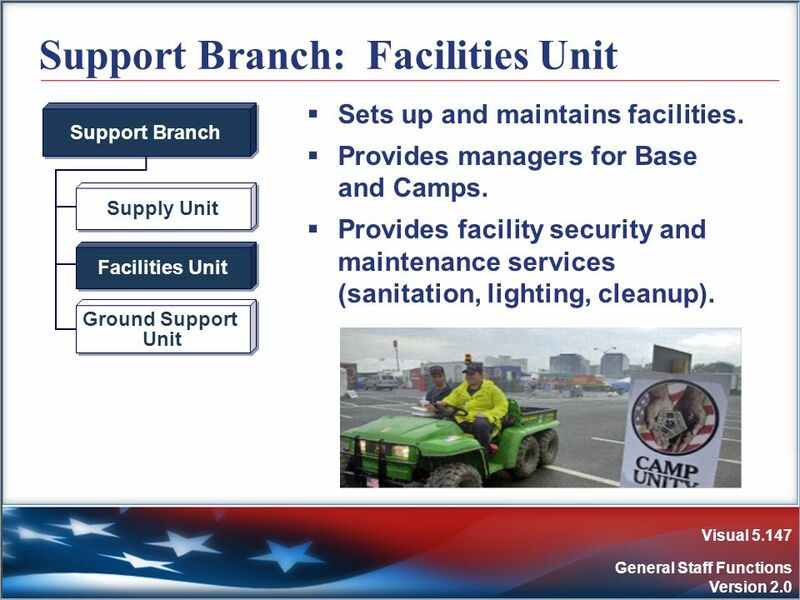 Camps are where food, water, rest, and sanitary services are provided to incident personnel. 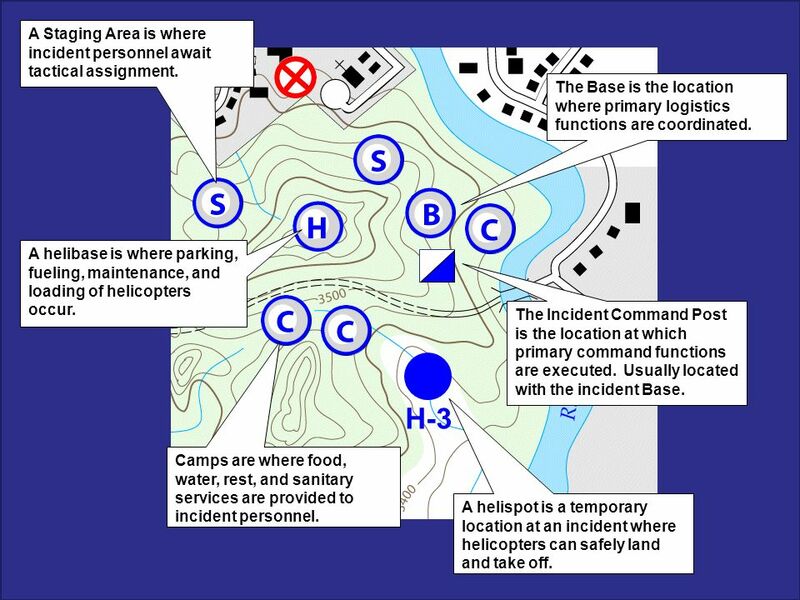 A helispot is a temporary location at an incident where helicopters can safely land and take off. 179 Knowledge Review (1 of 6) Instructions: Answer the question below. 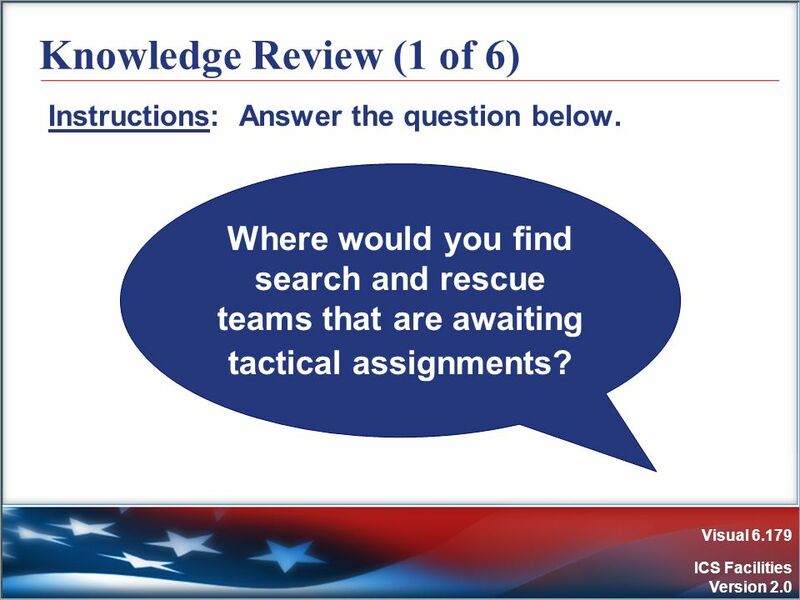 Where would you find search and rescue teams that are awaiting tactical assignments? 180 Knowledge Review (2 of 6) Instructions: Answer the question below. You are working at an incident in a remote area. 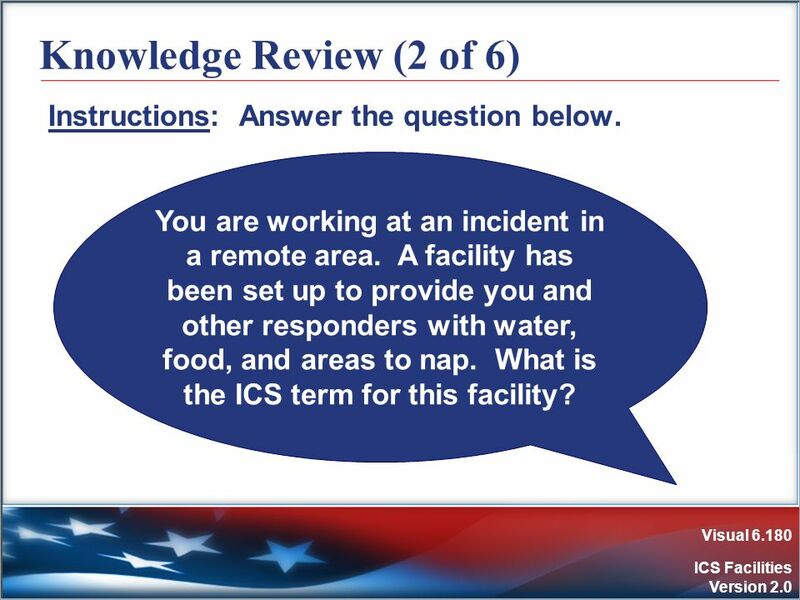 A facility has been set up to provide you and other responders with water, food, and areas to nap. 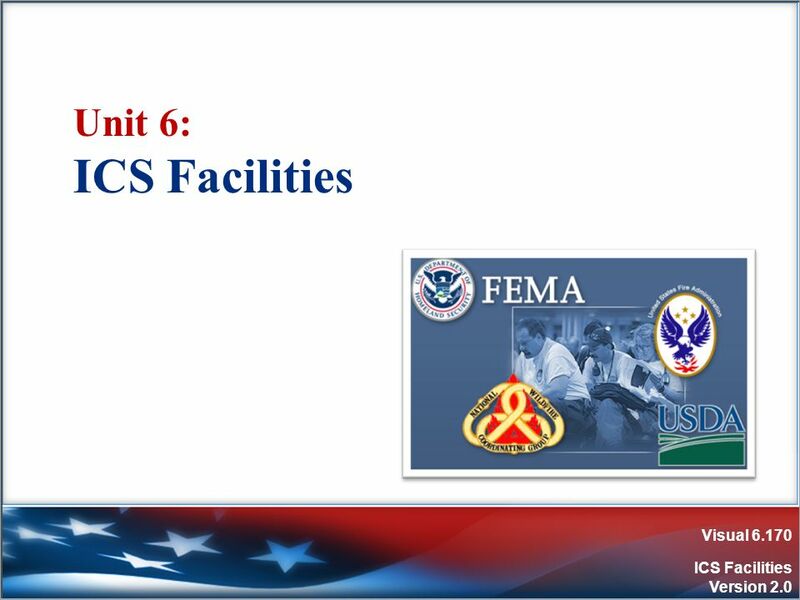 What is the ICS term for this facility? 181 Knowledge Review (3 of 6) Instructions: Answer the question below. You need to deliver something to the Incident Commander. 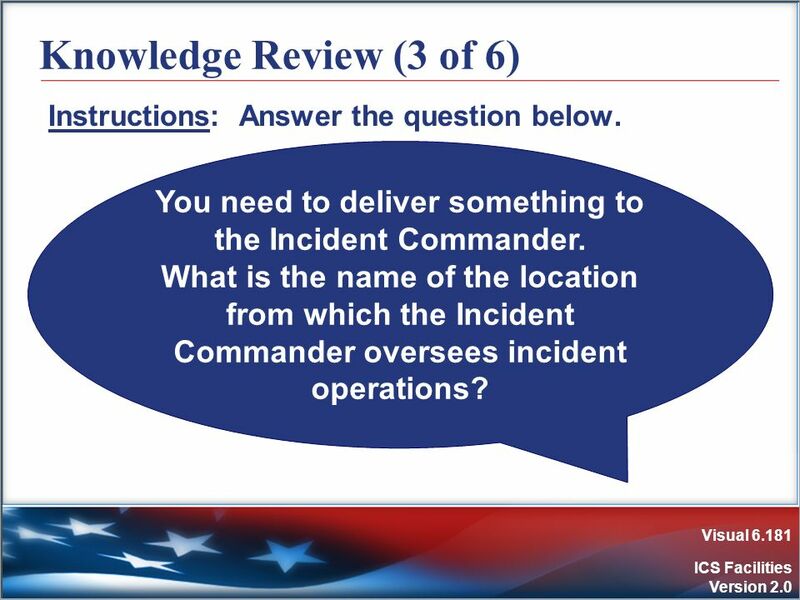 What is the name of the location from which the Incident Commander oversees incident operations? 182 Knowledge Review (4 of 6) Instructions: Answer the question below. 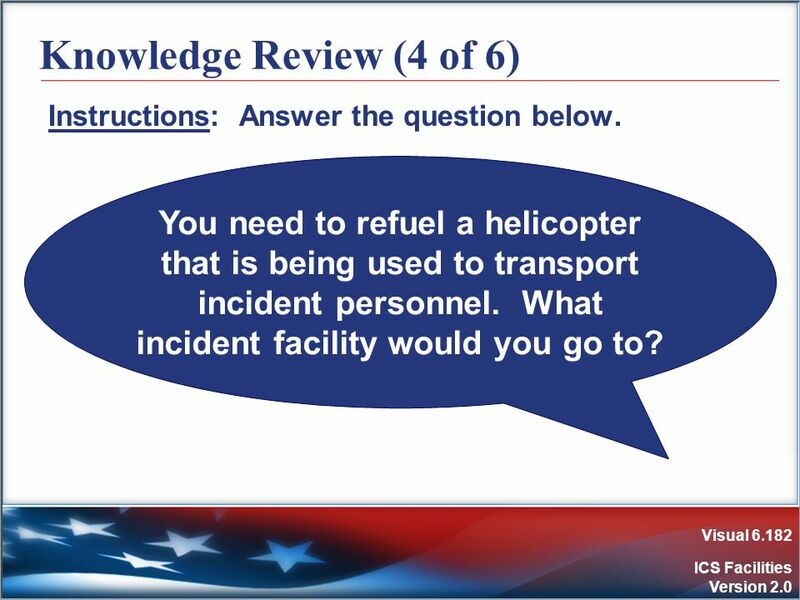 You need to refuel a helicopter that is being used to transport incident personnel. 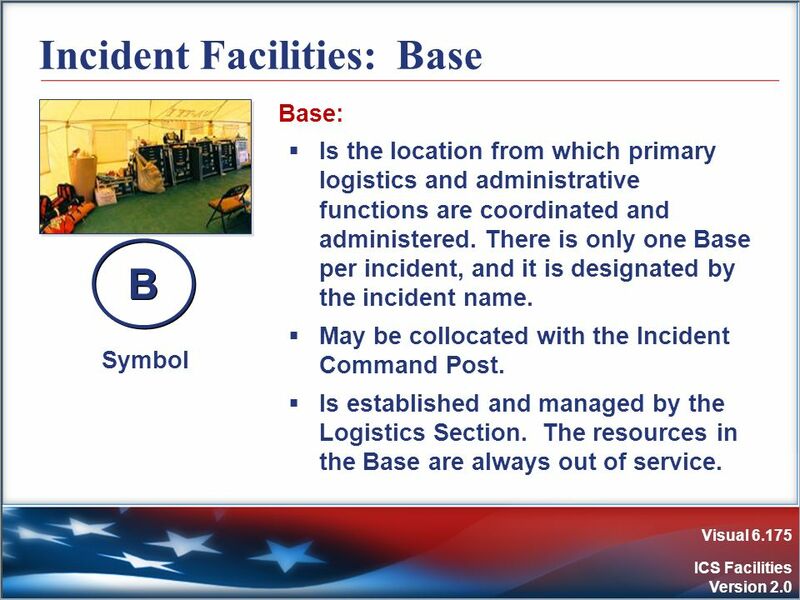 What incident facility would you go to? 183 Knowledge Review (5 of 6) Instructions: Answer the question below. 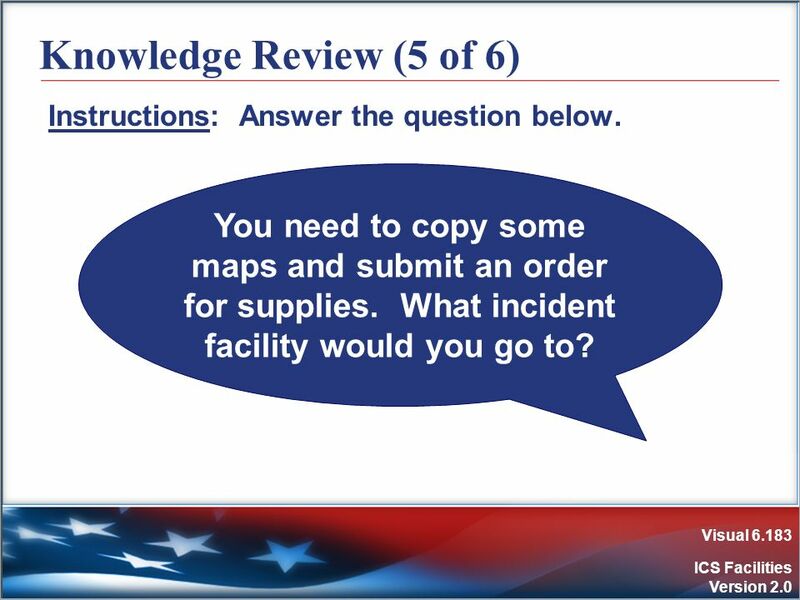 You need to copy some maps and submit an order for supplies. 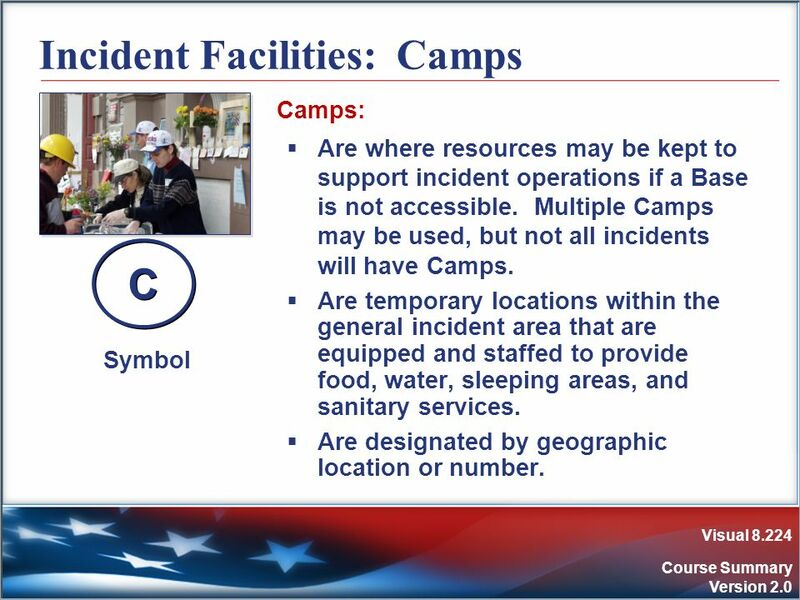 What incident facility would you go to? 184 Knowledge Review (6 of 6) Instructions: Answer the question below. 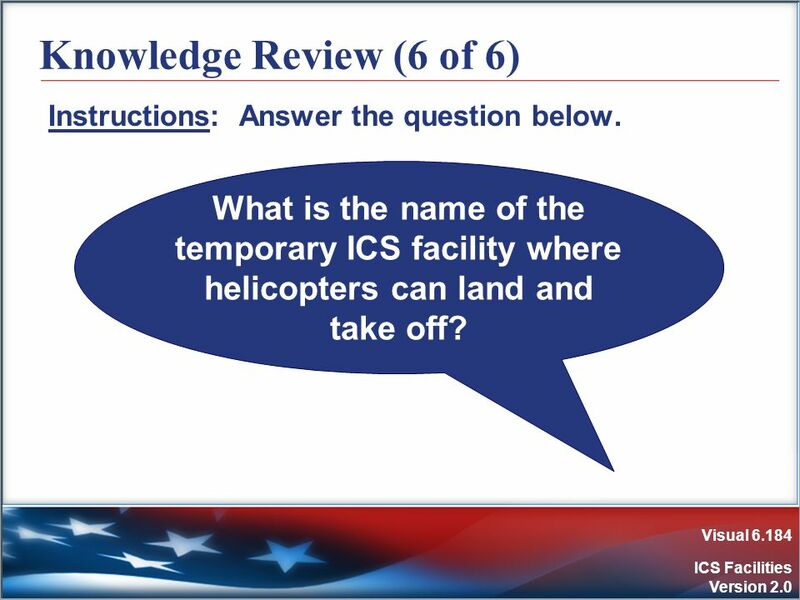 What is the name of the temporary ICS facility where helicopters can land and take off? 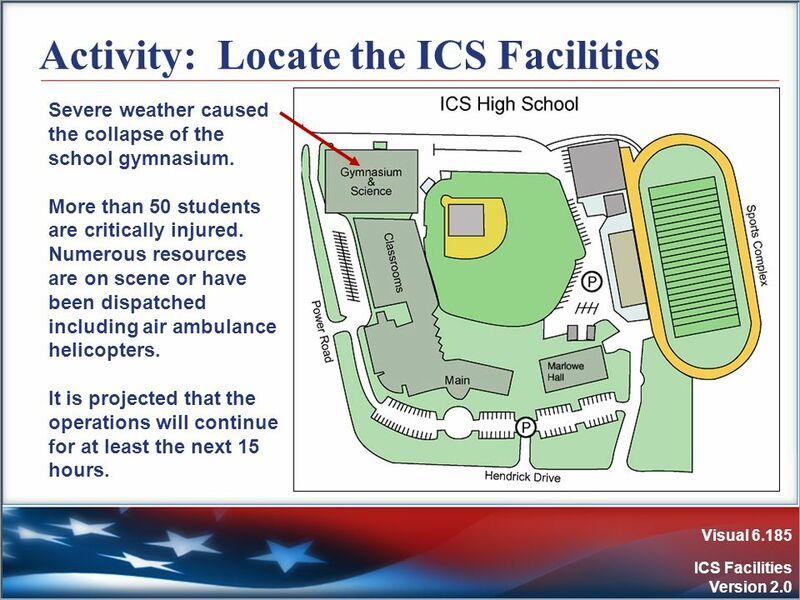 Severe weather caused the collapse of the school gymnasium. More than 50 students are critically injured. Numerous resources are on scene or have been dispatched including air ambulance helicopters. It is projected that the operations will continue for at least the next 15 hours. 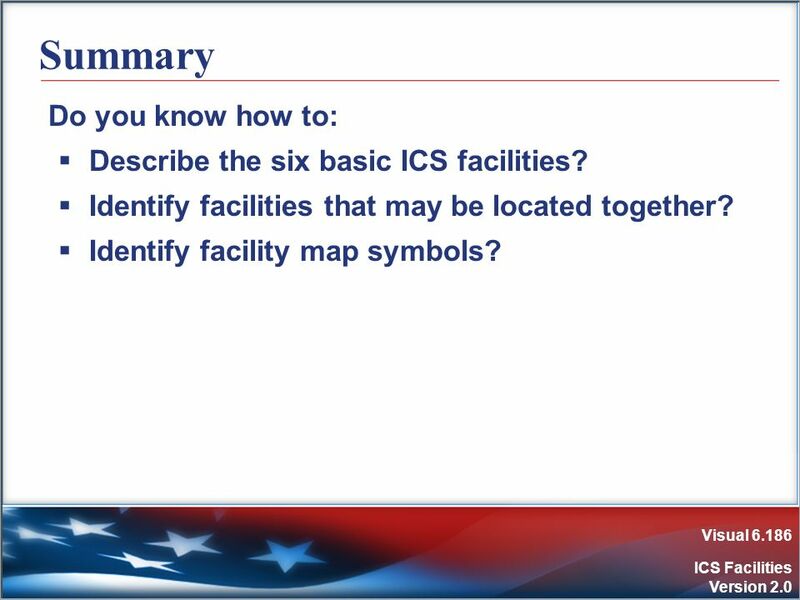 186 Summary Do you know how to: Describe the six basic ICS facilities? Identify facilities that may be located together? Identify facility map symbols? 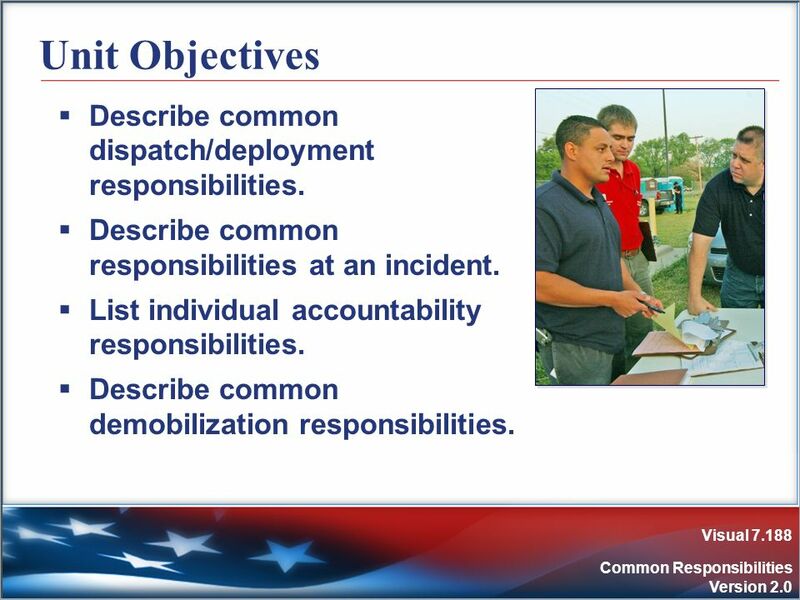 188 Unit Objectives Describe common dispatch/deployment responsibilities. Describe common responsibilities at an incident. 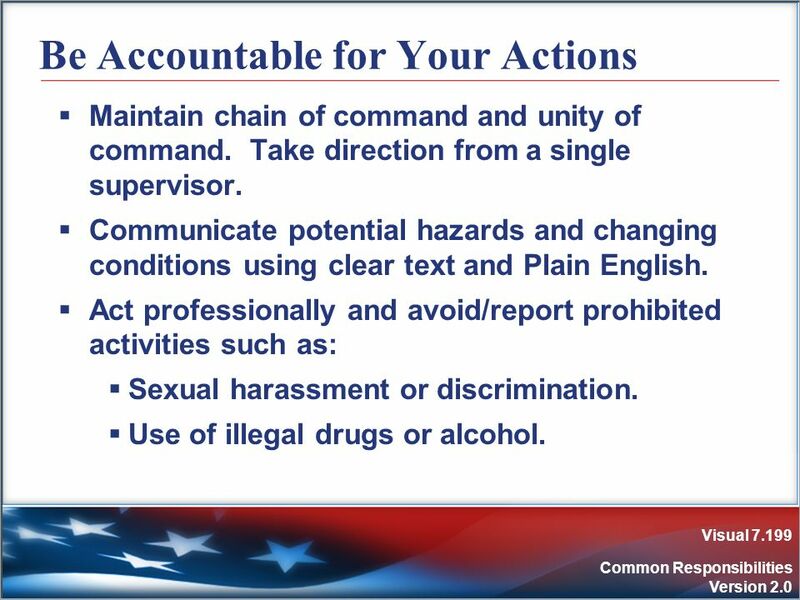 List individual accountability responsibilities. 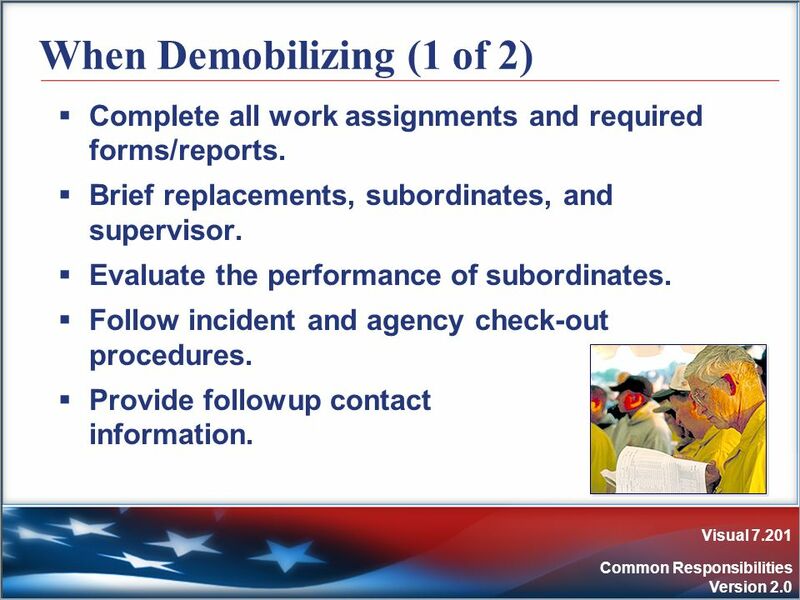 Describe common demobilization responsibilities. 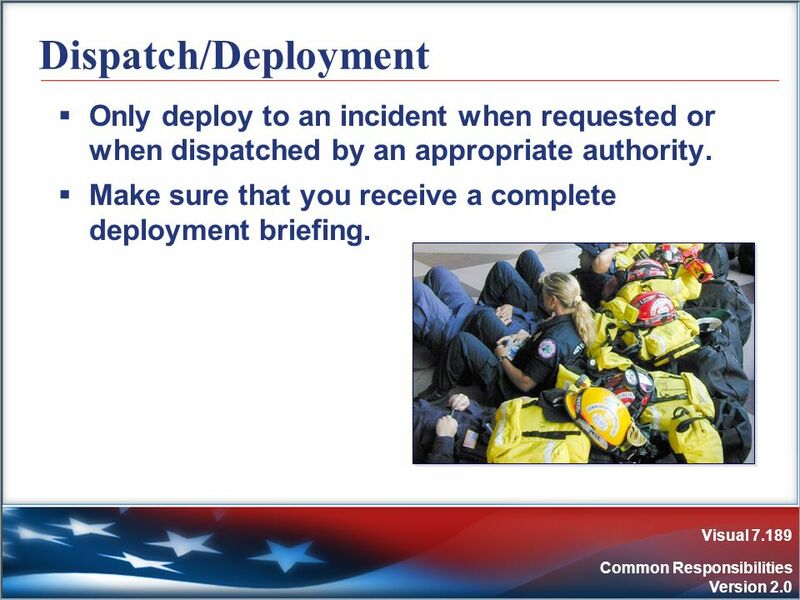 189 Dispatch/Deployment Only deploy to an incident when requested or when dispatched by an appropriate authority. 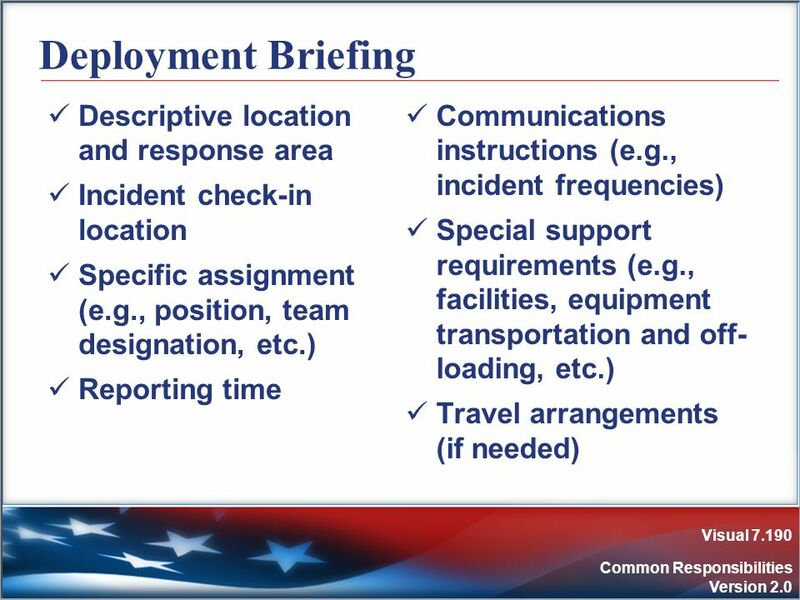 Make sure that you receive a complete deployment briefing. 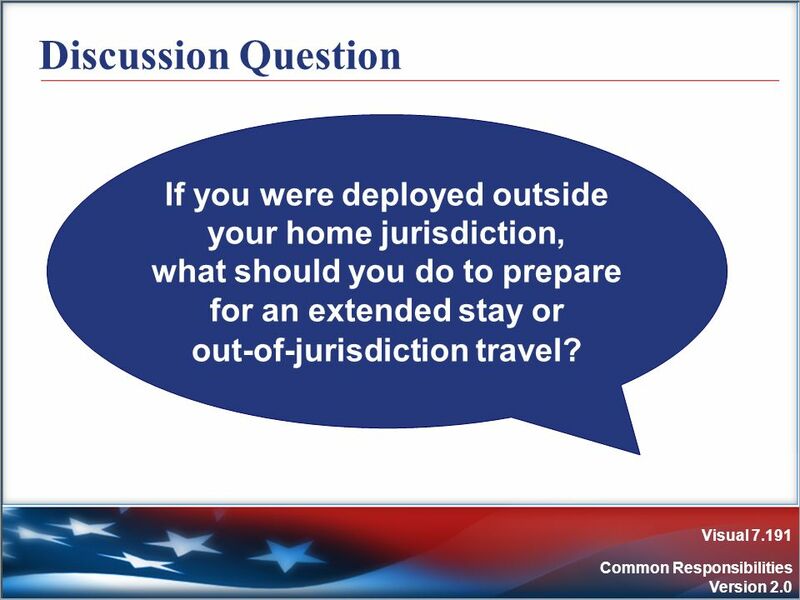 191 Discussion Question If you were deployed outside your home jurisdiction, what should you do to prepare for an extended stay or out-of-jurisdiction travel? The check-in process helps to: Ensure personnel accountability. Track resources. 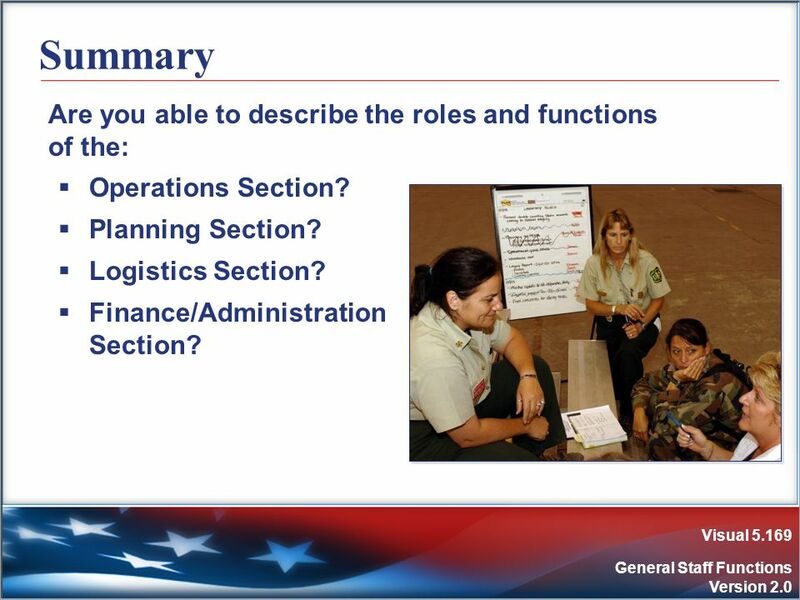 Prepare personnel for assignments and reassignments. Locate personnel in case of an emergency. 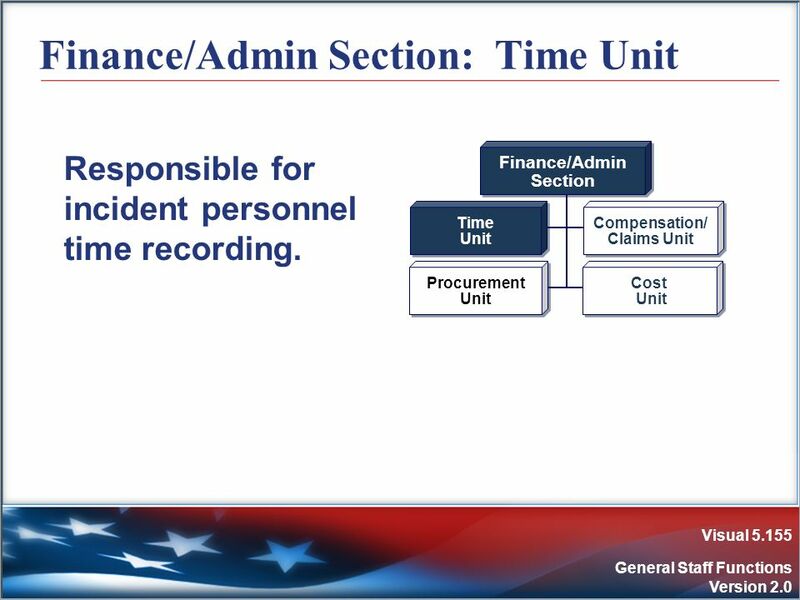 Establish personnel time records and payroll documentation. 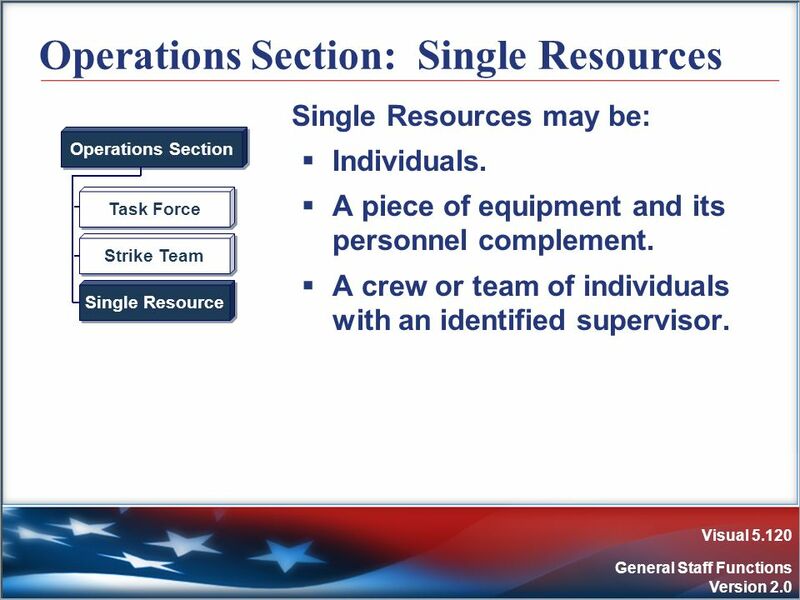 Plan for releasing personnel. Organize the demobilization process. 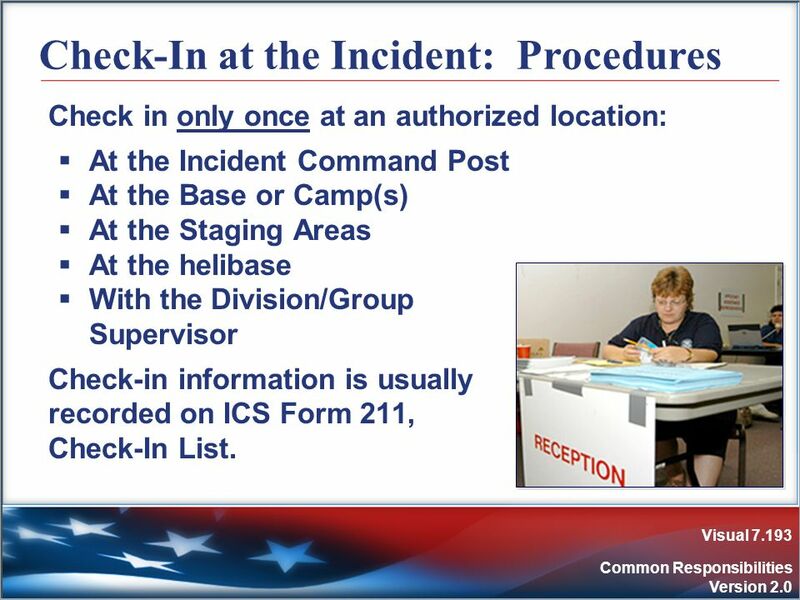 Check in only once at an authorized location: At the Incident Command Post At the Base or Camp(s) At the Staging Areas At the helibase With the Division/Group Supervisor Check-in information is usually recorded on ICS Form 211, Check-In List. 194 Knowledge Review Instructions: Answer the question below. 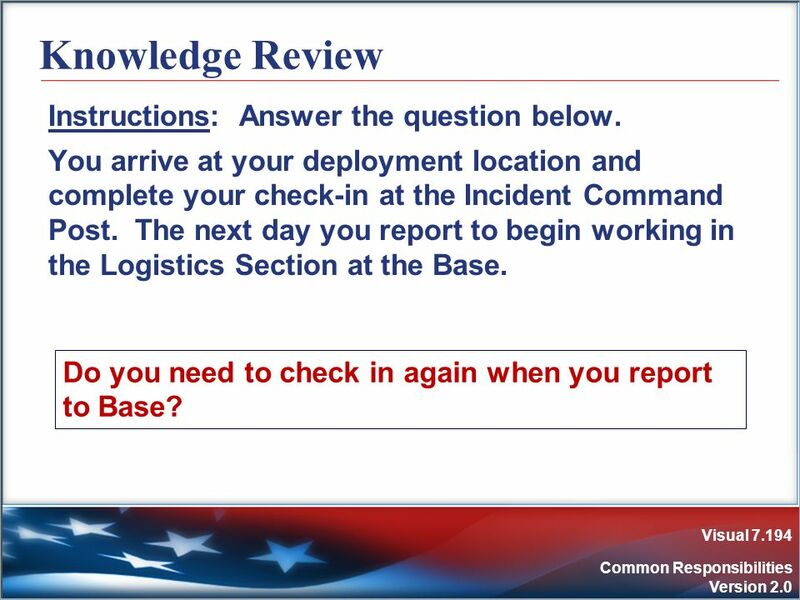 You arrive at your deployment location and complete your check-in at the Incident Command Post. 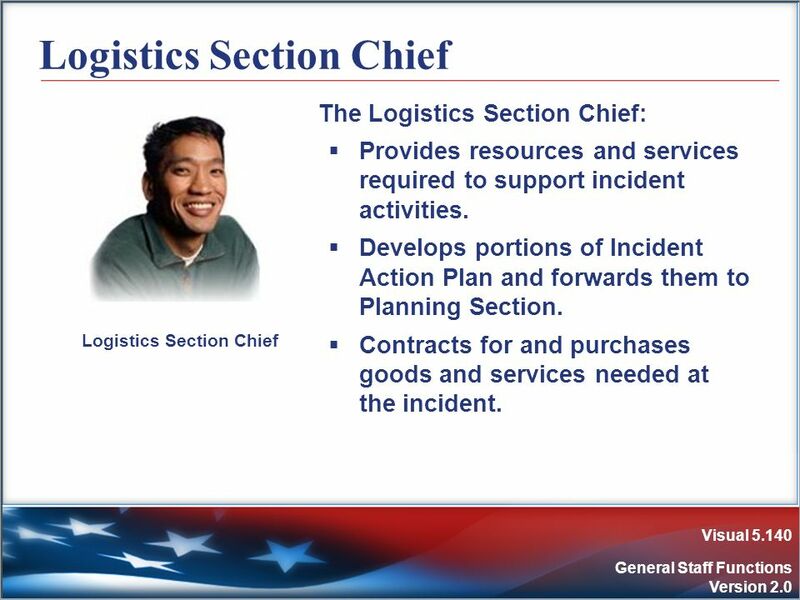 The next day you report to begin working in the Logistics Section at the Base. Do you need to check in again when you report to Base? 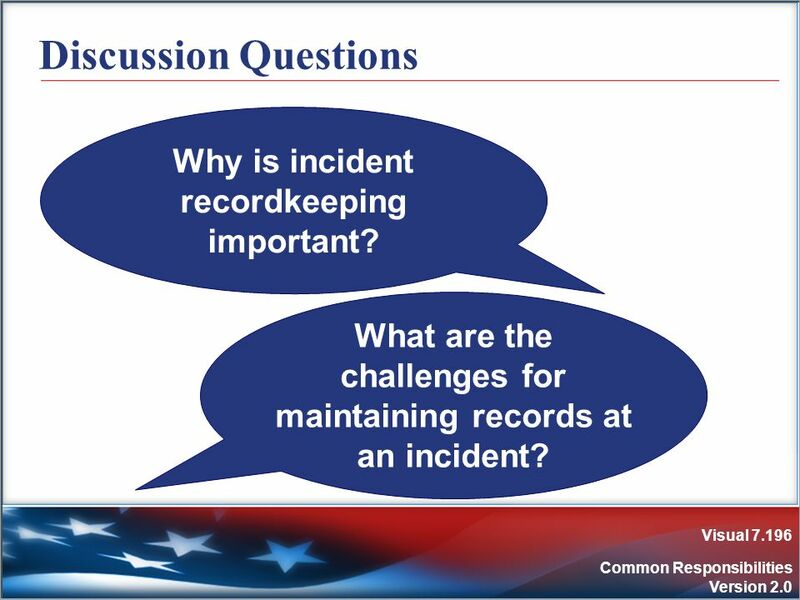 196 Discussion Questions Why is incident recordkeeping important? 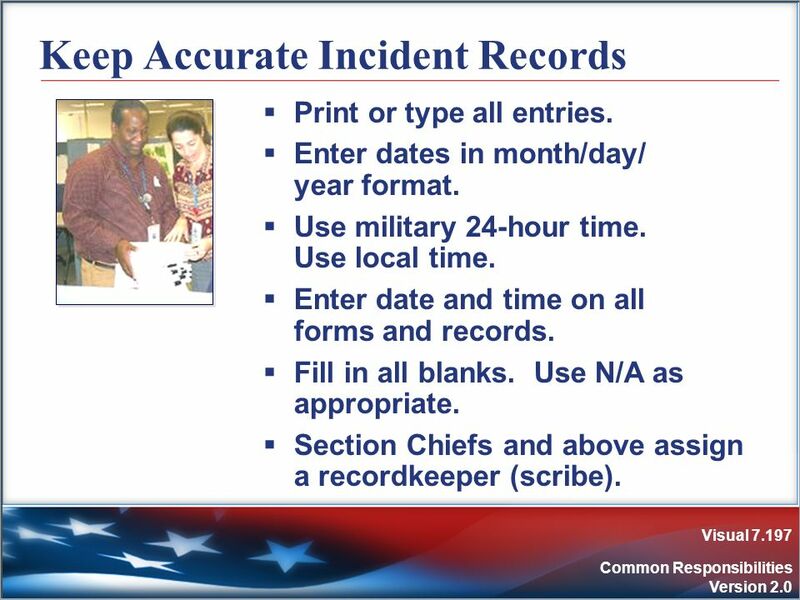 What are the challenges for maintaining records at an incident? Print or type all entries. Enter dates in month/day/ year format. 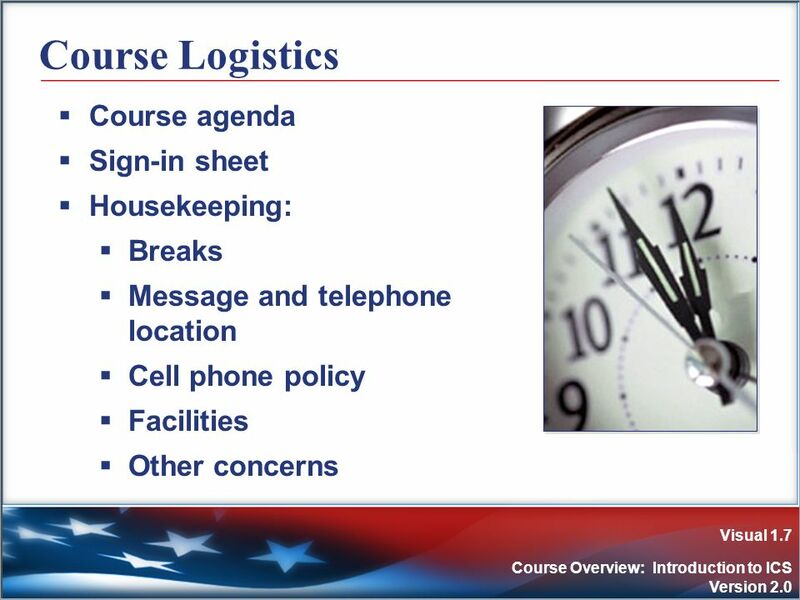 Use military 24-hour time. Use local time. Enter date and time on all forms and records. Fill in all blanks. Use N/A as appropriate. 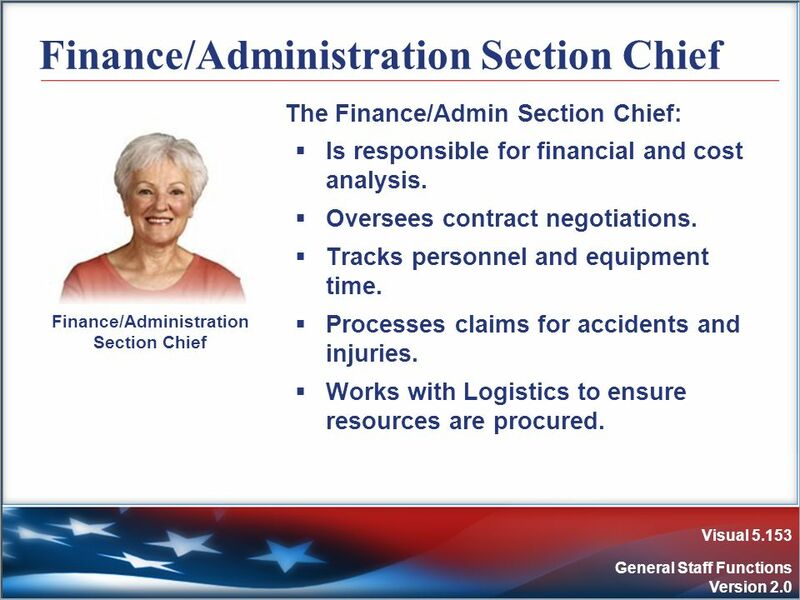 Section Chiefs and above assign a recordkeeper (scribe). 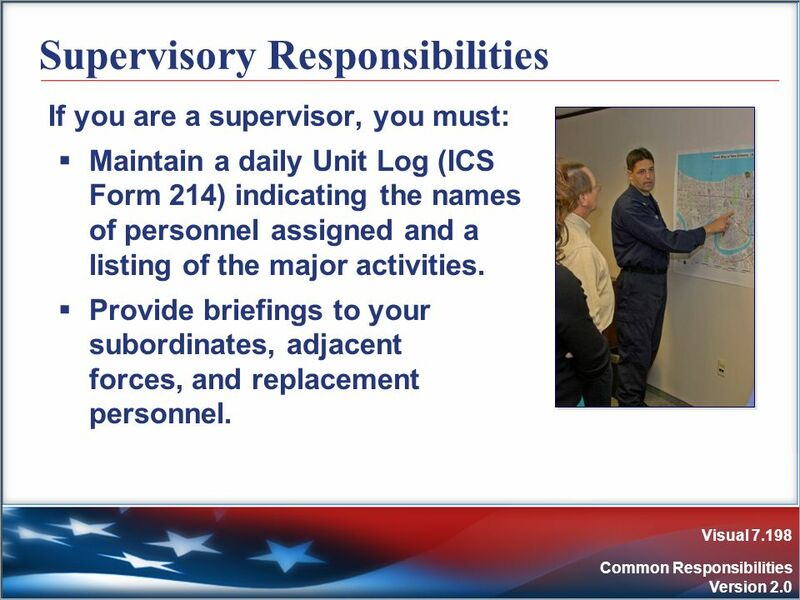 If you are a supervisor, you must: Maintain a daily Unit Log (ICS Form 214) indicating the names of personnel assigned and a listing of the major activities. 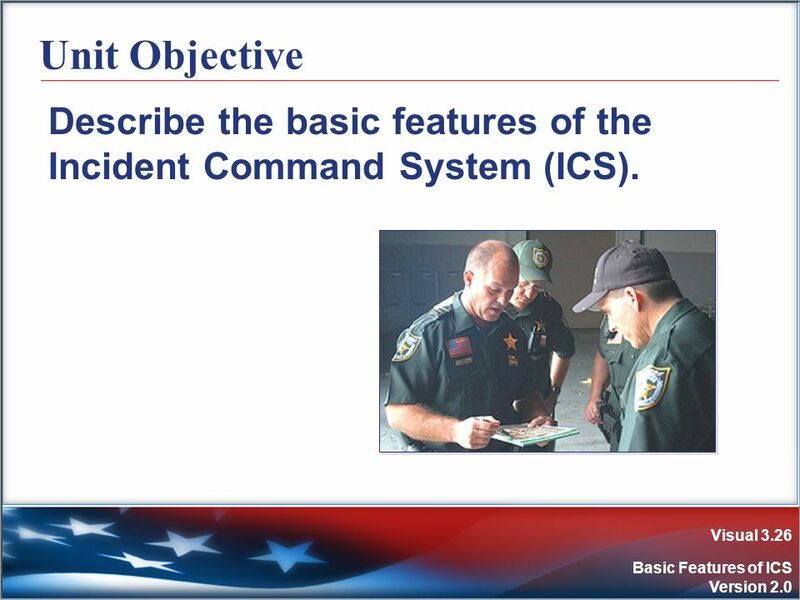 Provide briefings to your subordinates, adjacent forces, and replacement personnel. 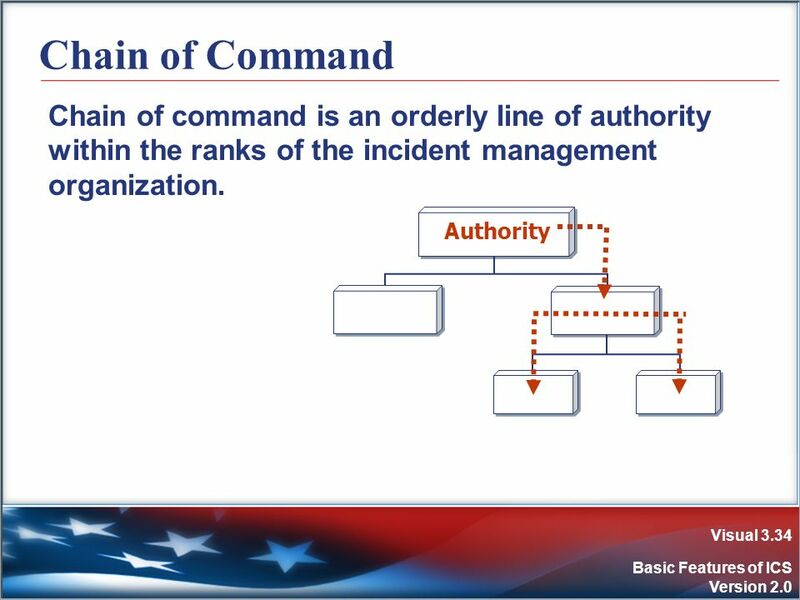 Maintain chain of command and unity of command. Take direction from a single supervisor. Communicate potential hazards and changing conditions using clear text and Plain English. Act professionally and avoid/report prohibited activities such as: Sexual harassment or discrimination. Use of illegal drugs or alcohol. 200 Before leaving an incident, what should you do? 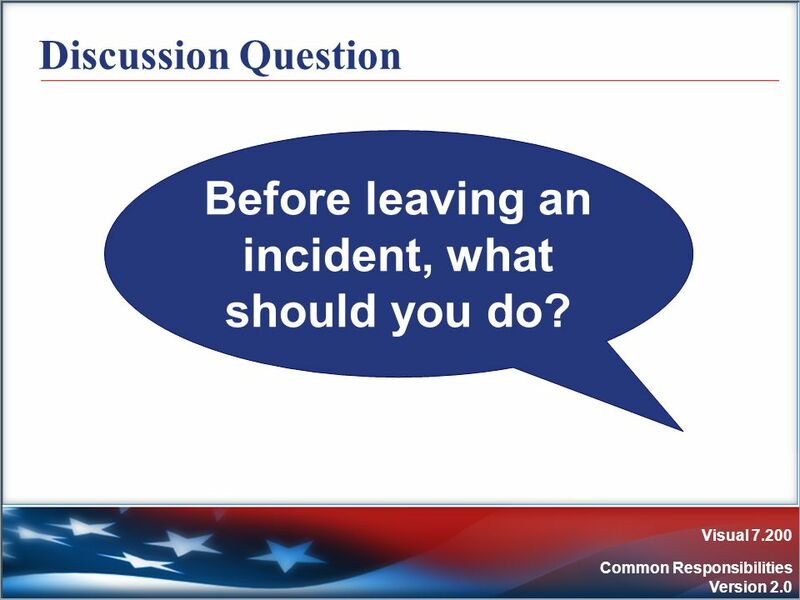 Discussion Question Before leaving an incident, what should you do? Complete all work assignments and required forms/reports. Brief replacements, subordinates, and supervisor. Evaluate the performance of subordinates. 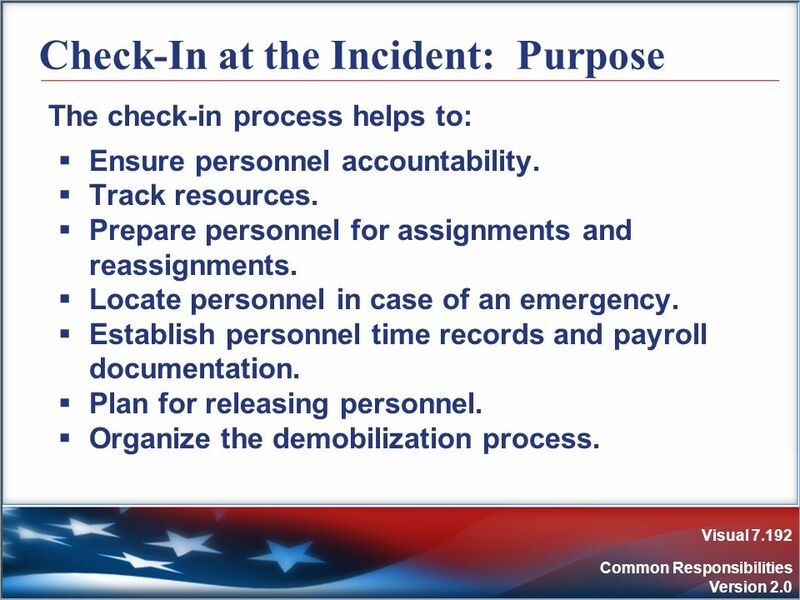 Follow incident and agency check-out procedures. Provide followup contact information. Return any incident-issued equipment or other nonexpendable supplies. 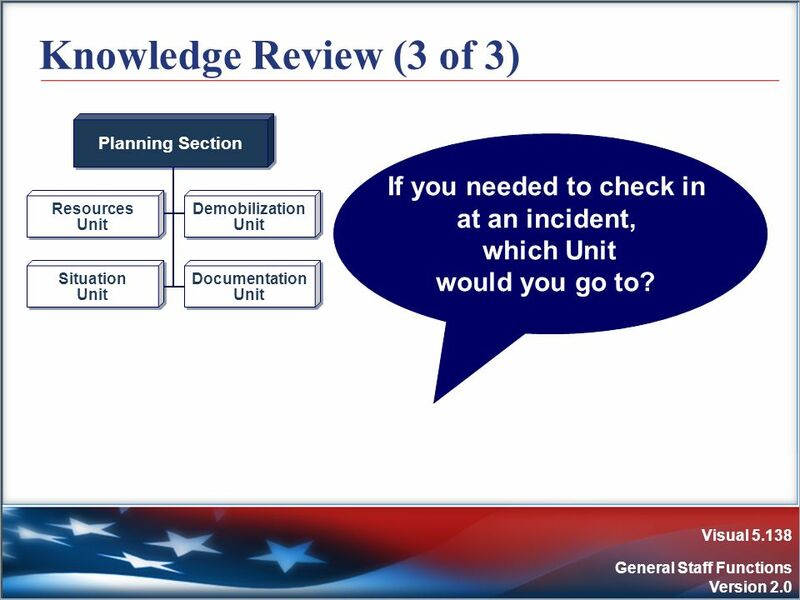 Complete post-incident reports, critiques, evaluations, and medical followup. Complete any administration issues. 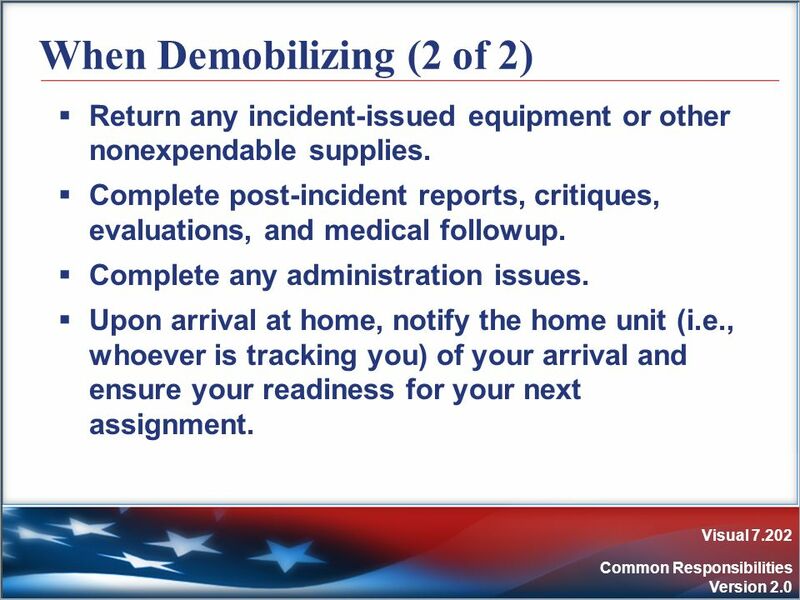 Upon arrival at home, notify the home unit (i.e., whoever is tracking you) of your arrival and ensure your readiness for your next assignment. 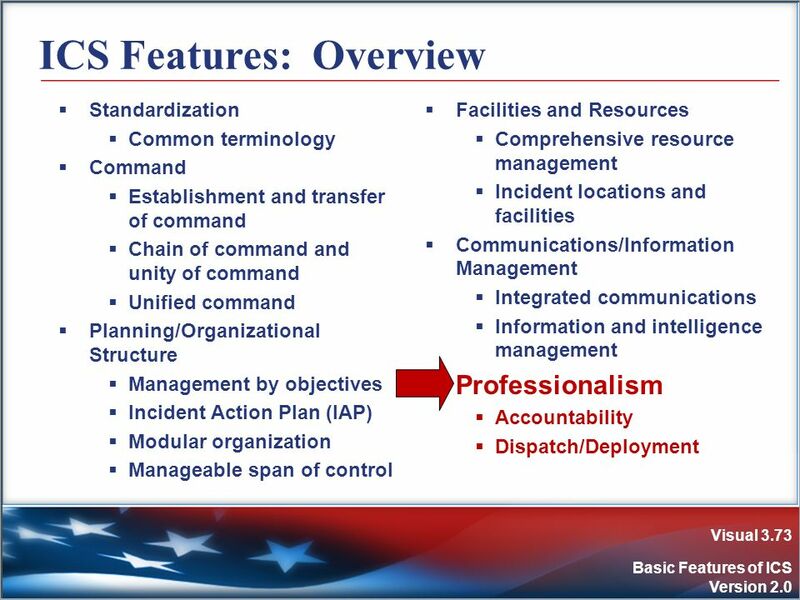 Describe common dispatch/deployment responsibilities? Describe common responsibilities at an incident? List individual accountability responsibilities? 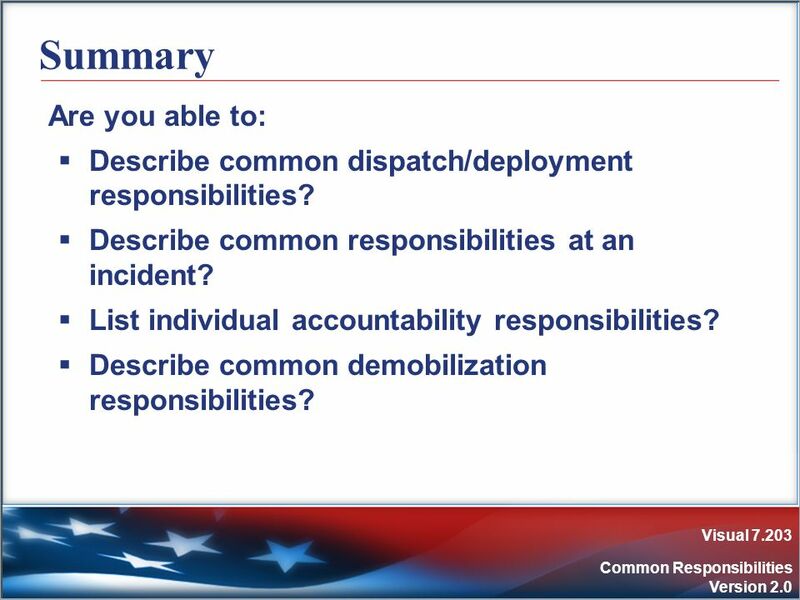 Describe common demobilization responsibilities? 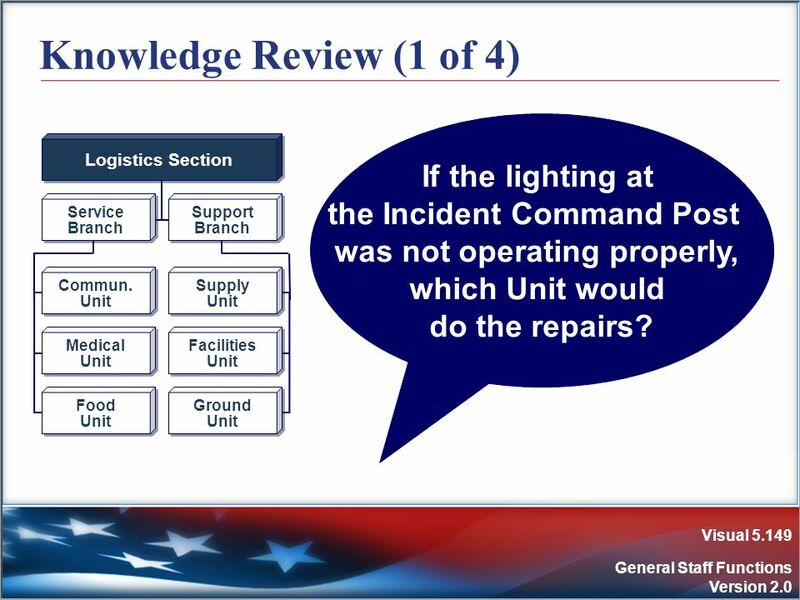 Are you now able to Describe the Incident Command System (ICS) organization? Take a few moments to review your Student Manuals and identify any questions. 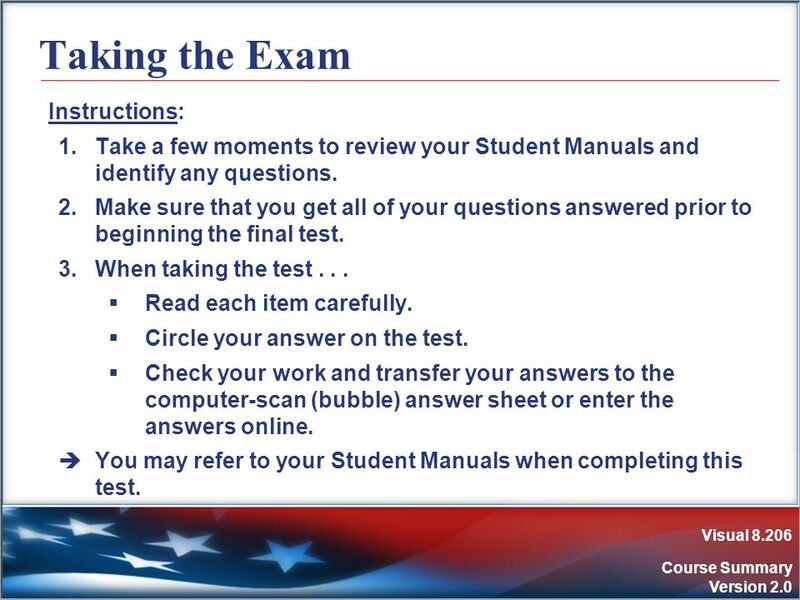 Make sure that you get all of your questions answered prior to beginning the final test. When taking the test . . . Read each item carefully. Circle your answer on the test. Check your work and transfer your answers to the computer-scan (bubble) answer sheet or enter the answers online. You may refer to your Student Manuals when completing this test. 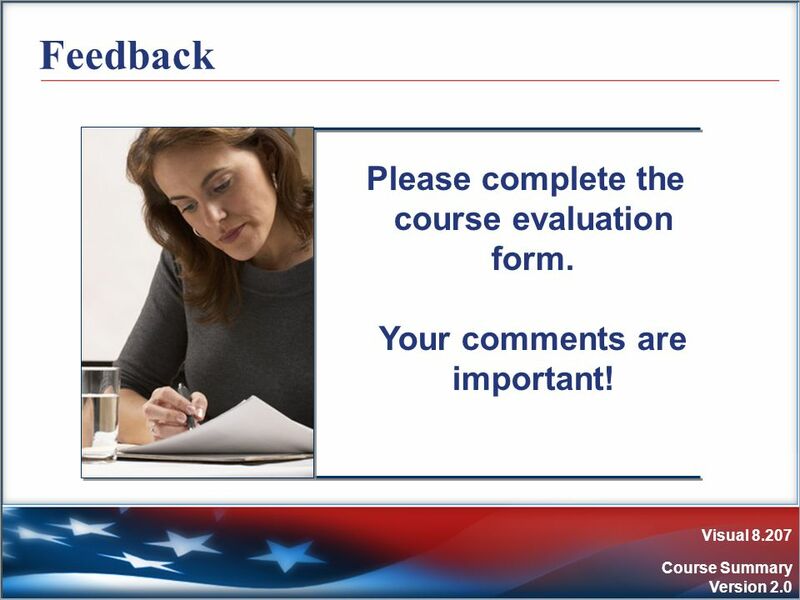 207 Feedback Please complete the course evaluation form. Your comments are important! 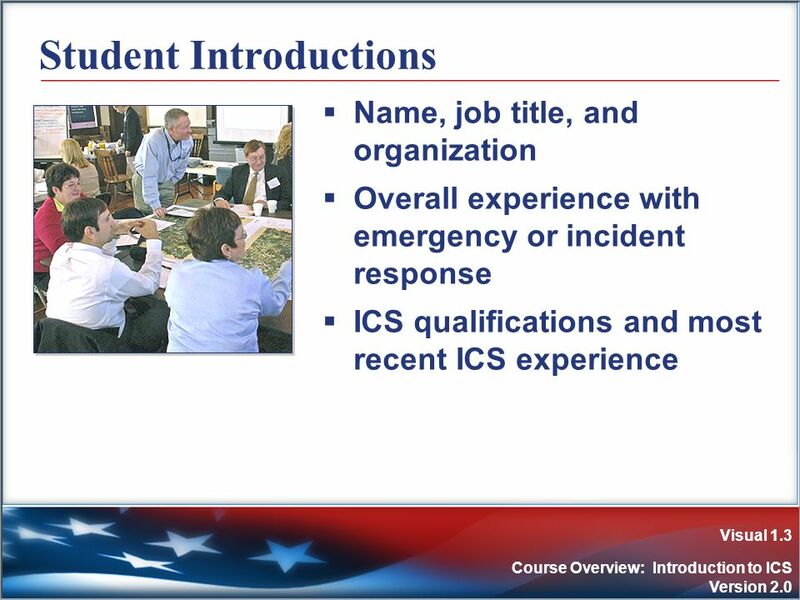 208 ICS Benefits ICS: Meets the needs of incidents of any kind or size. 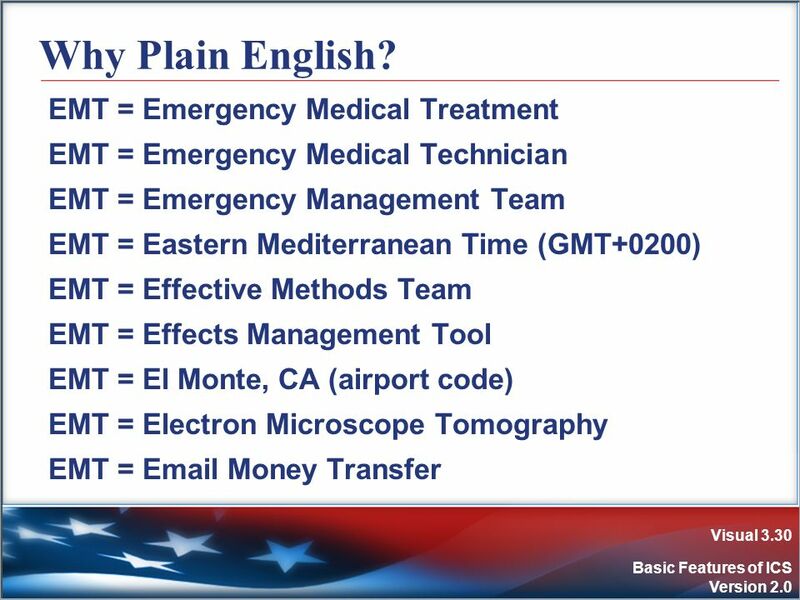 210 Use of Plain English Communications should be in plain English or clear text. 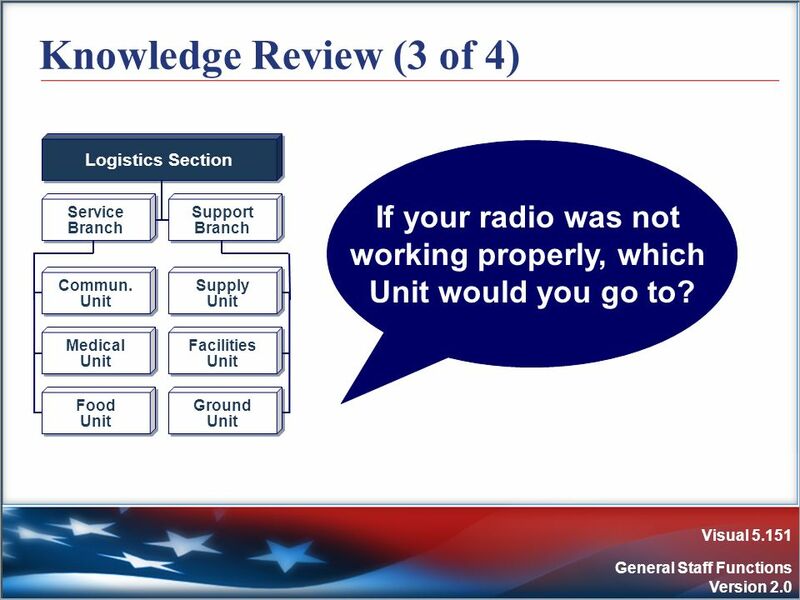 Do not use radio codes, agency-specific codes, or jargon. 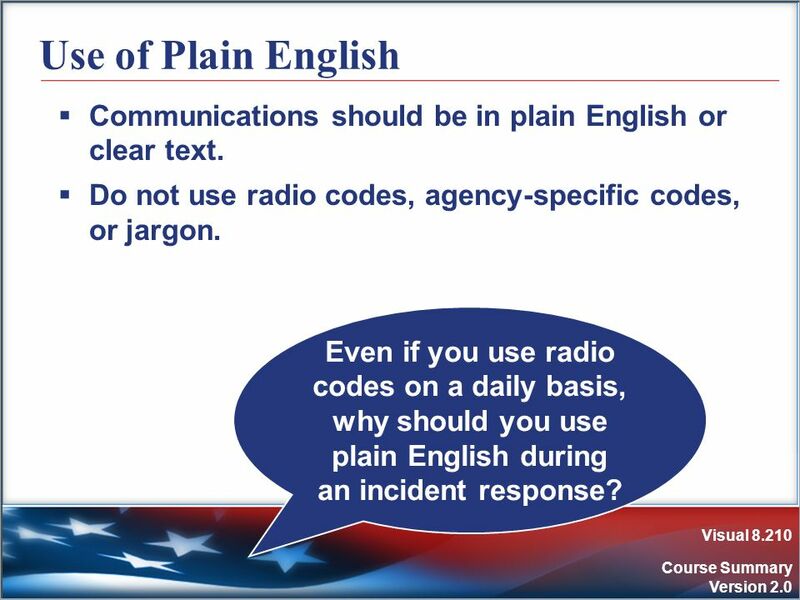 Even if you use radio codes on a daily basis, why should you use plain English during an incident response? 220 Logistics Section Responsible for: Communications. Download ppt "Unit 1: Course Overview Introduction to ICS"
Visual 1.1 Course Overview Unit 1: Course Overview. Visual 8.1 Course Summary Unit 8: Course Summary. Visual 3.1 Delegation of Authority & Management by Objectives Unit 3: Delegation of Authority & Management by Objectives. Unit 7: Course Summary – Putting It All Together.